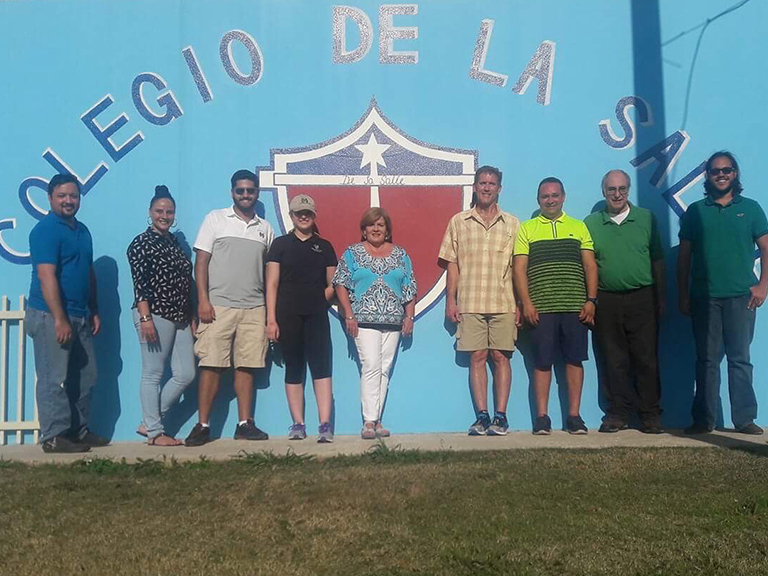 Their visit from April 14-20 strengthened an academic partnership between Universidad de La Salle and the College. 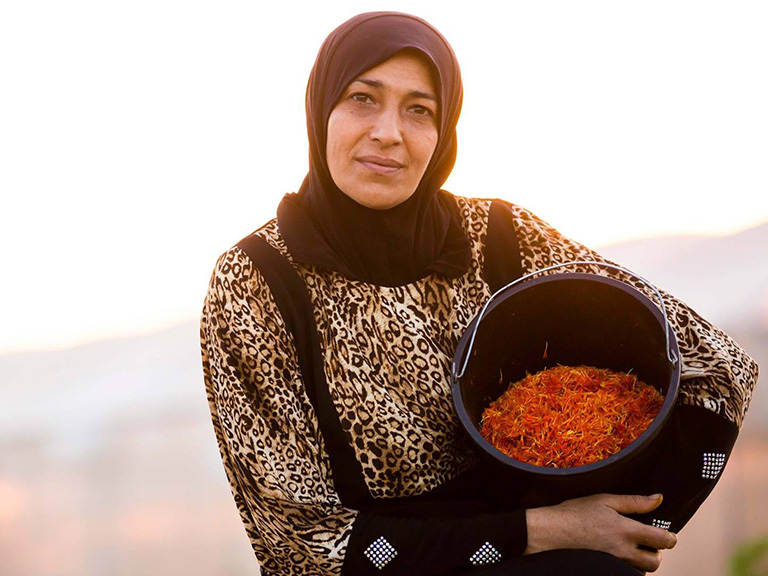 Eleven individuals will share their stories in an intimate setting on Thursday, April 25. 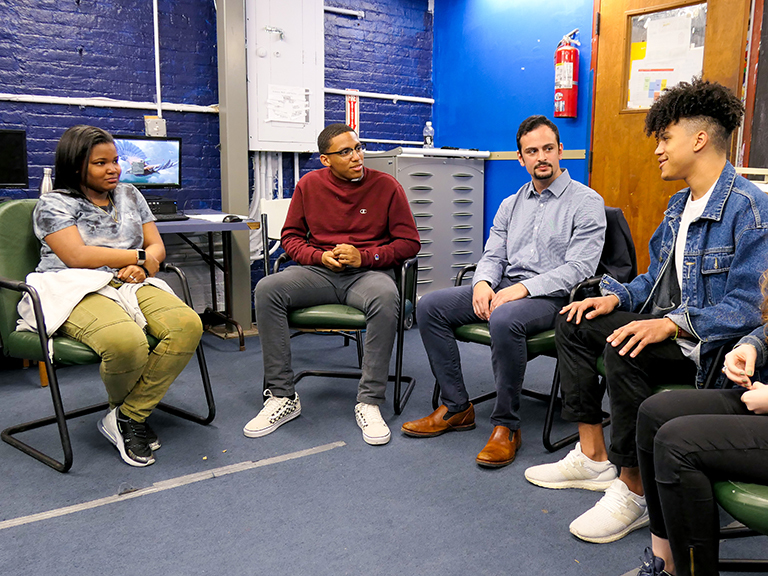 David Caiafa ’19 teaches yoga and mindfulness to help New York City teens prepare for the future. 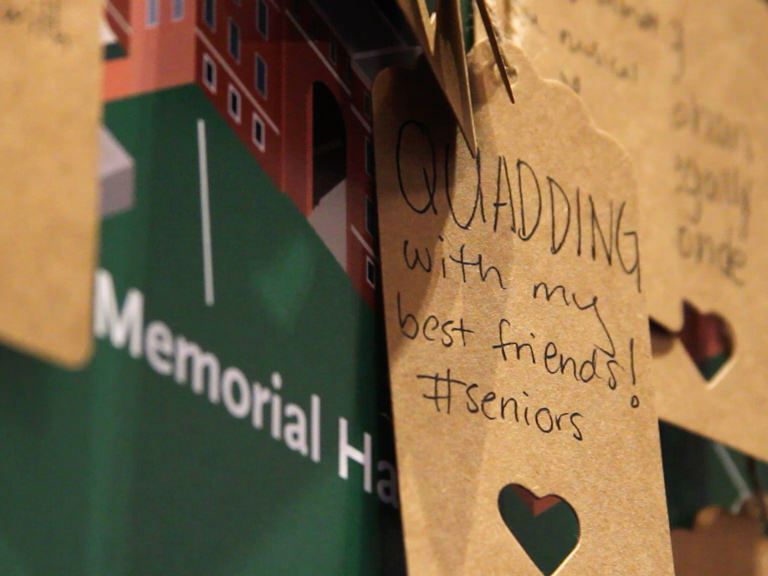 From April until November, members of the Manhattan College community will reflect on the meaning of the Lasallian tradition on campus. 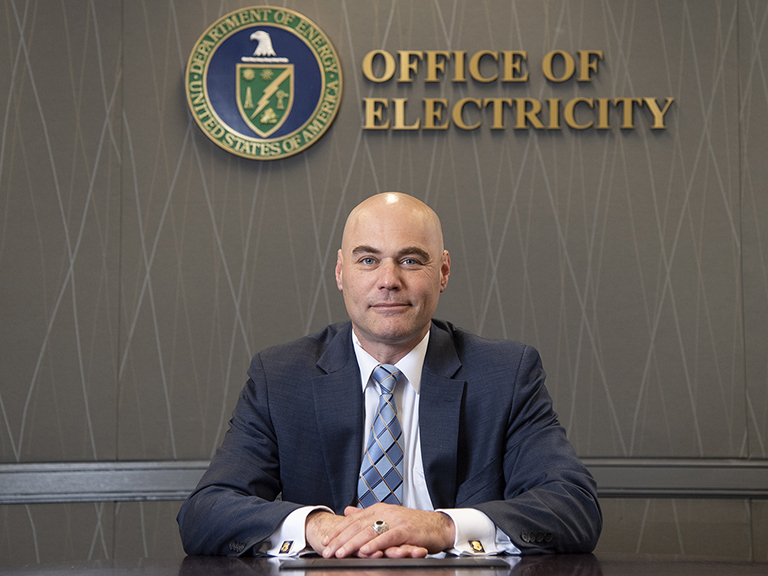 Engineering alumnus Bruce Walker ’92 is a top-level executive working at the Department of Energy. 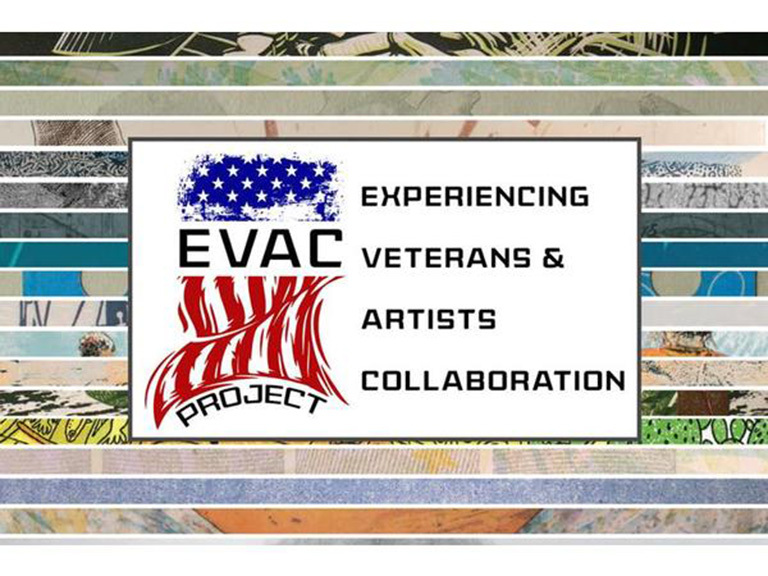 The exhibition will open on Wednesday, April 10 and is open to the public through mid-June. 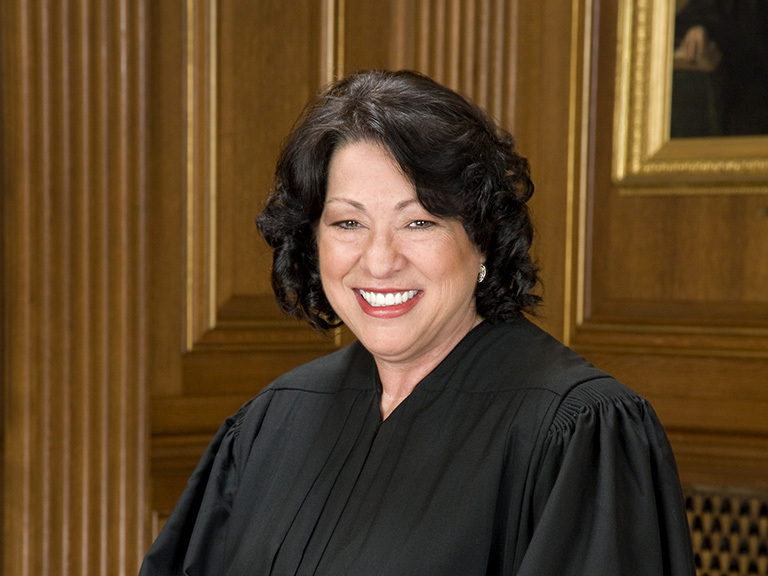 Born and raised in the Bronx, Justice Sotomayor is the first sitting Supreme Court justice to speak at Manhattan College. 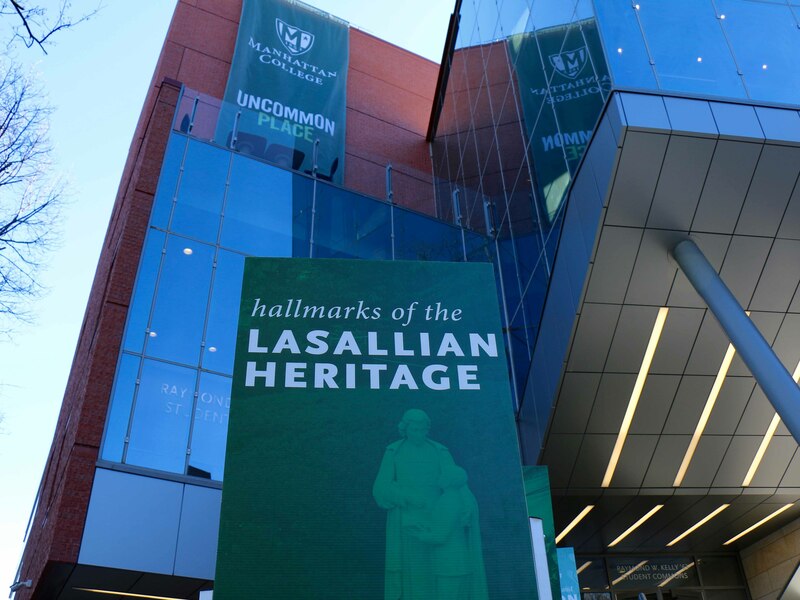 In 2019, Lasallians around the world commemorate 300 years after De La Salle. A series of events aims to celebrate and empower women in our Lasallian Catholic community. 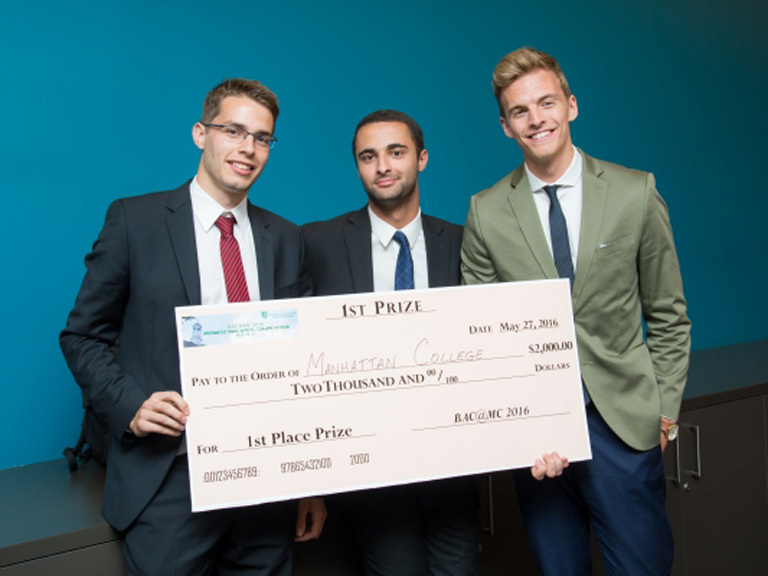 The winning idea is an app that connects automobile drivers to mechanics. 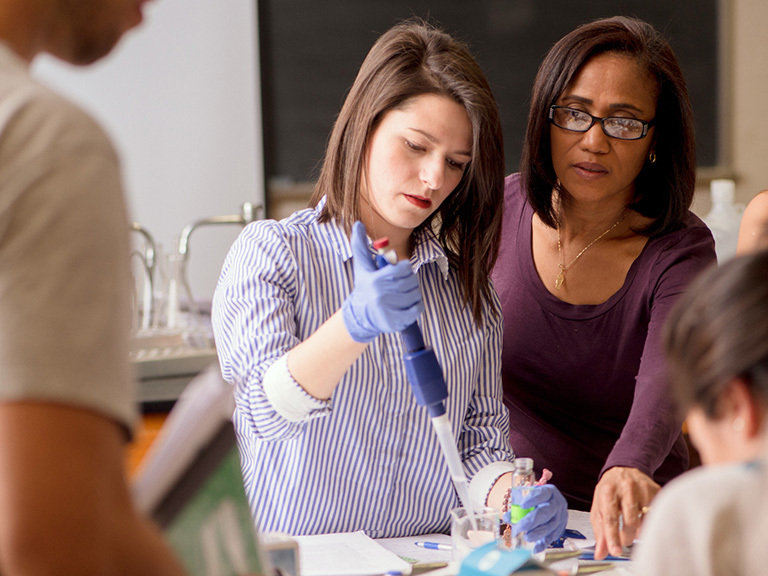 Manhattan College faculty and students are using engineering education to develop future STEM leaders. 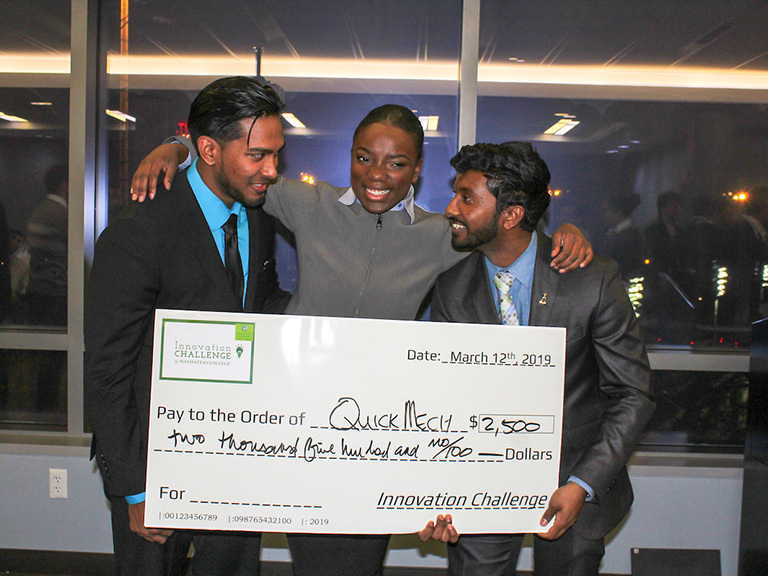 An aspiring DNA cancer researcher aims to one day prevent the risk of certain human genetic diseases. 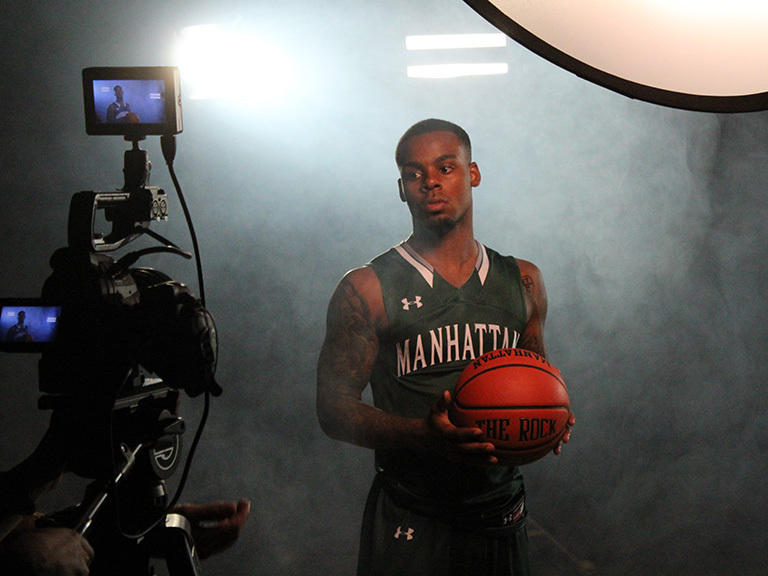 Students will produce live Manhattan College sporting events beginning with the 2019-20 basketball season. 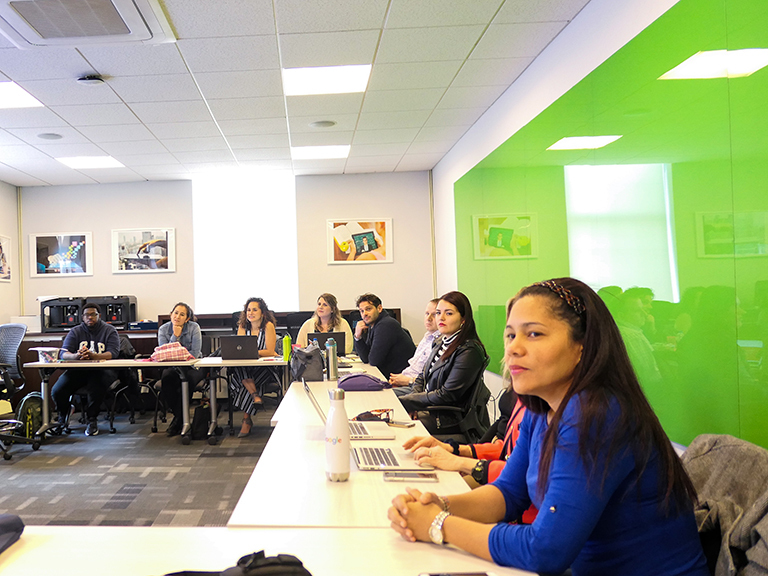 Students from the Data Mining for Business Analytics course learned about Microsoft’s analytics services. 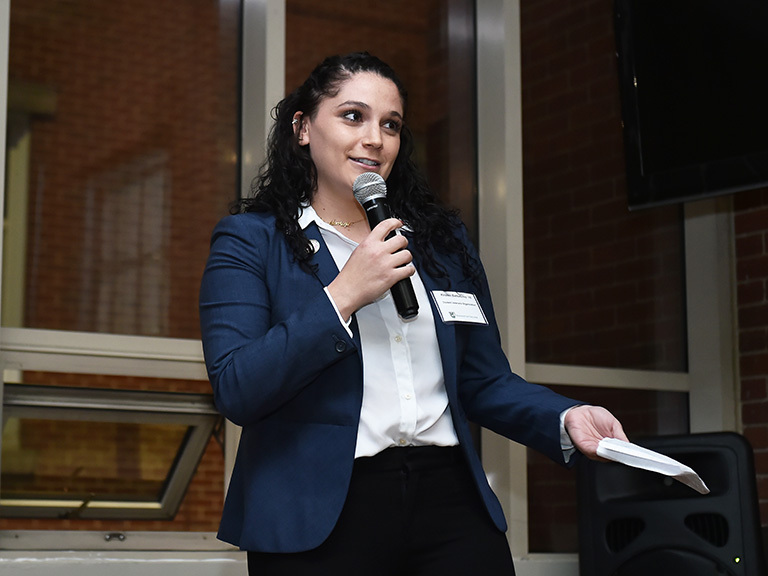 Students speak on the valuable connections they maintain after the semester is over or in some cases, after graduation. 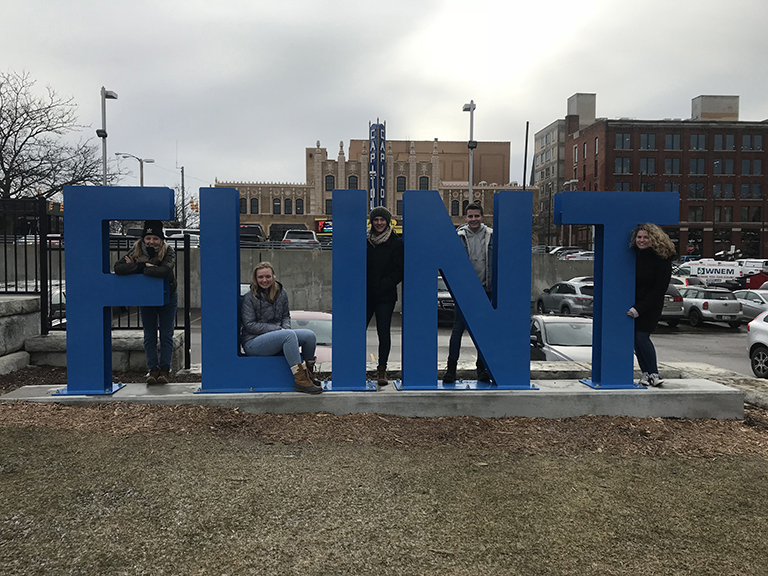 A winter break volunteer experience helped five Jaspers understand the reality of the Flint water crisis. 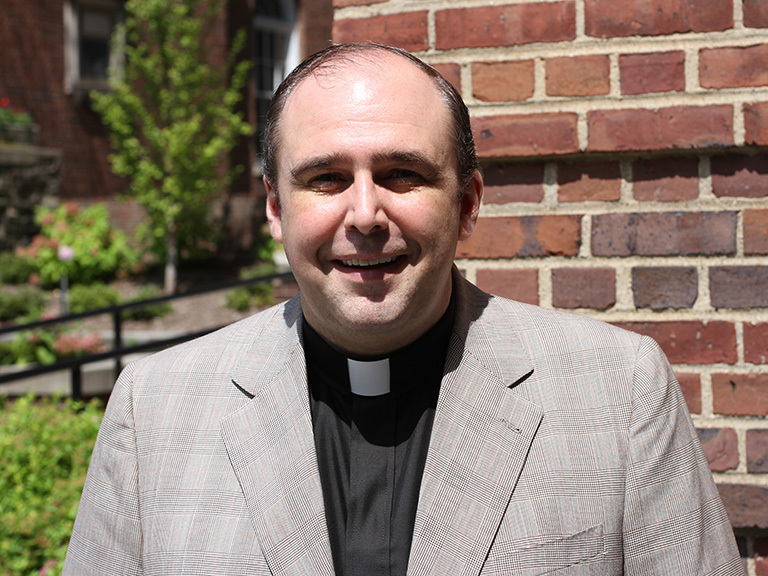 Kevin Ahern, Ph.D., is spotlighting on-campus faith communities in a new book. 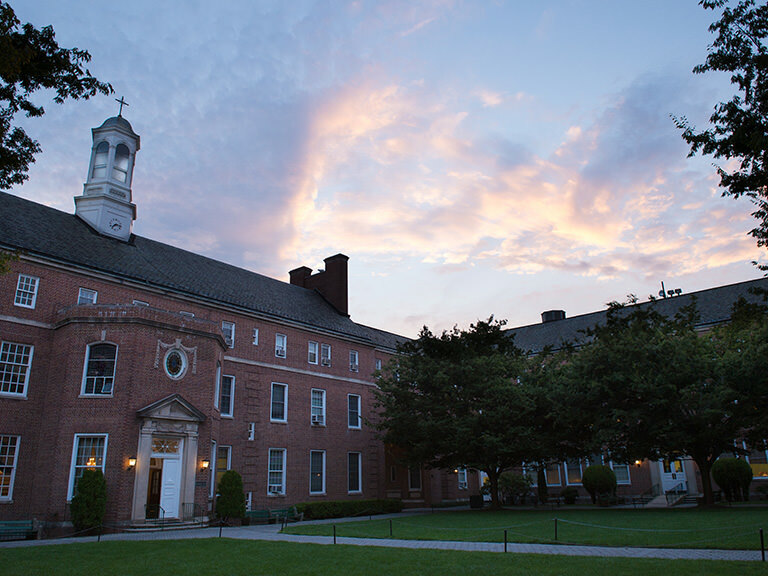 Being a Manhattan College student comes with a lot of perks. 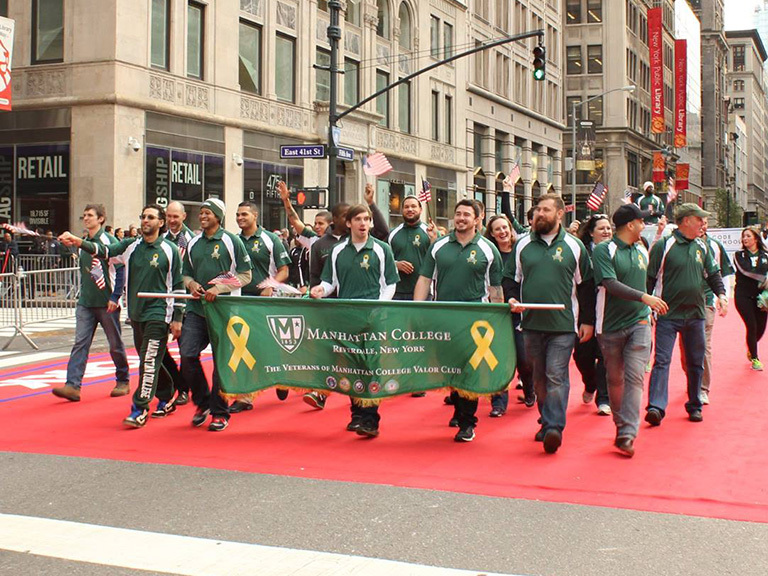 Manhattan is the only New York City private college to be placed in Military Friendly’s silver category or higher. 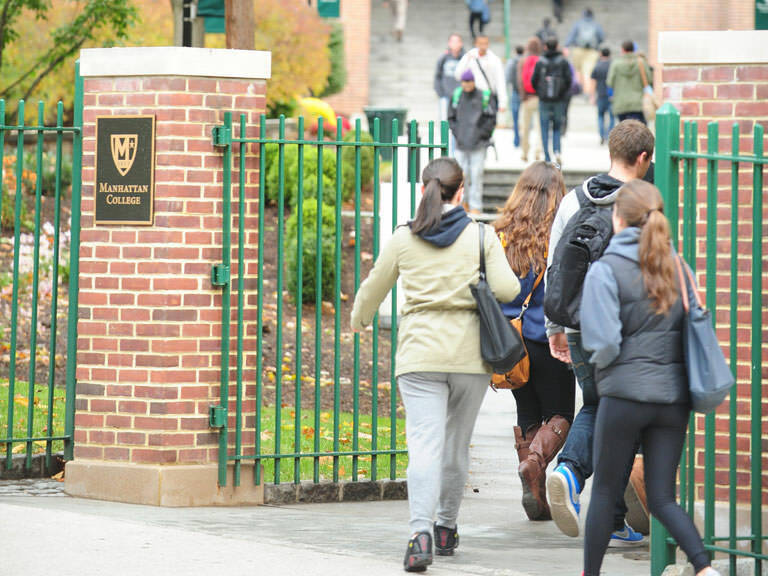 A report from CICU shows economic effects generated by Manhattan College and other private colleges. 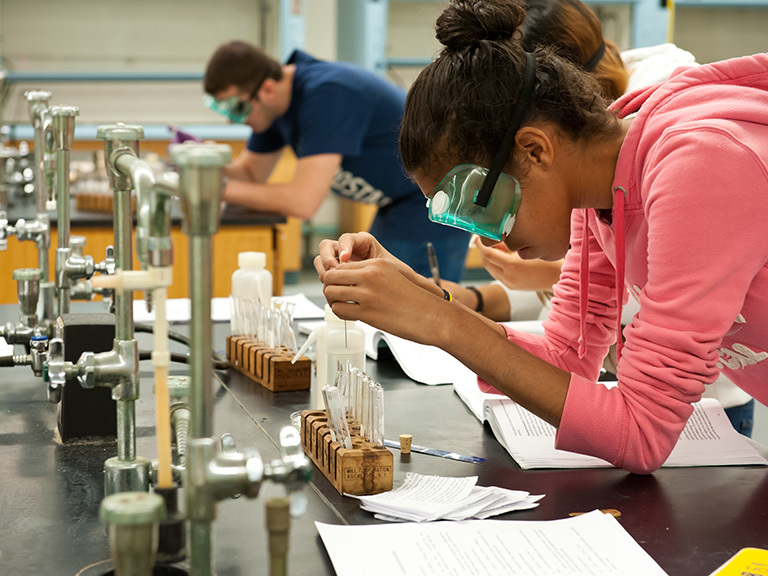 Rising high school juniors and seniors have the chance to learn about Manhattan College’s STEM programs. 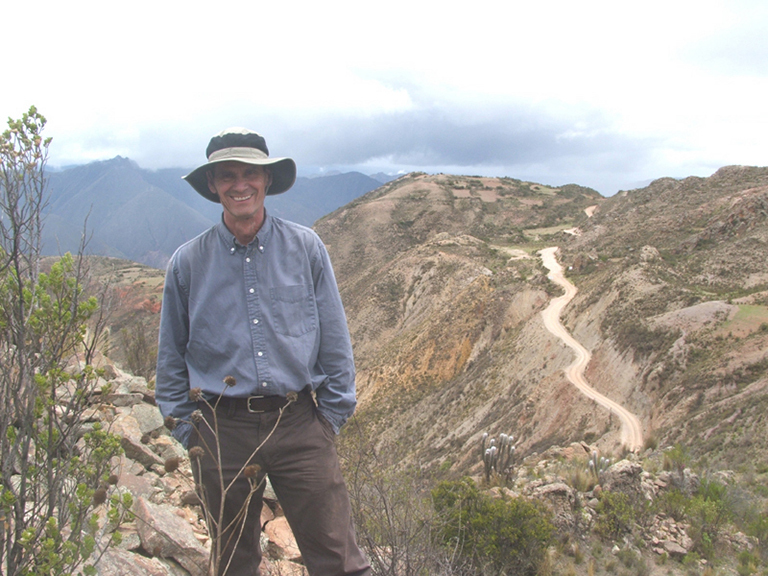 Bruce Shockey, Ph.D., a Manhattan College science professor, is now a part of history. 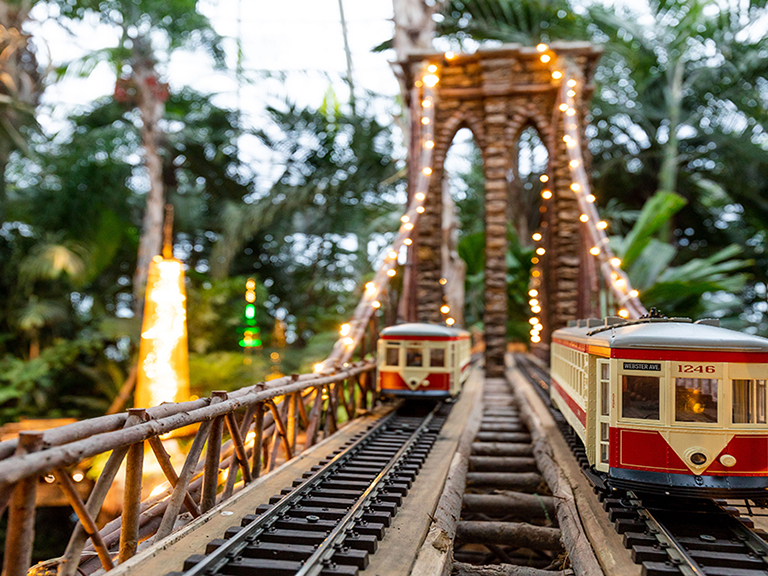 The city comes alive each season with fun and affordable ways to enjoy the holidays. 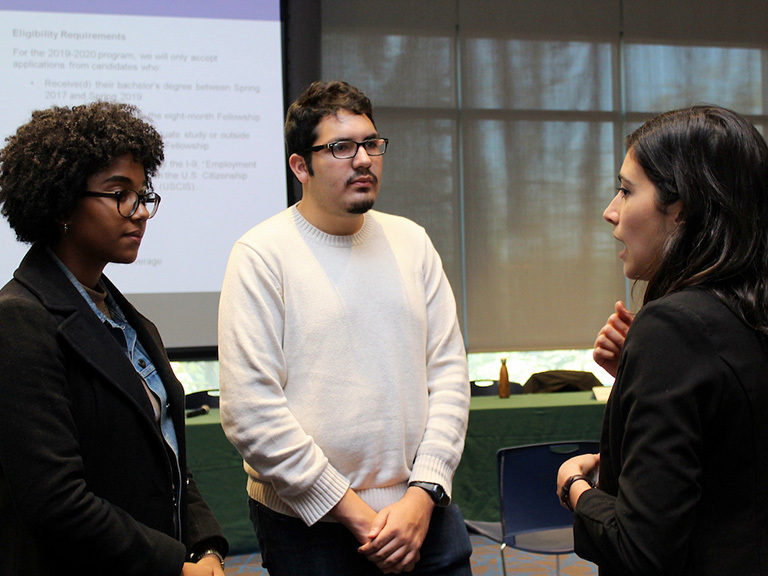 Members of the city’s public sector presented to students about post-grad opportunities in government and non-profits. 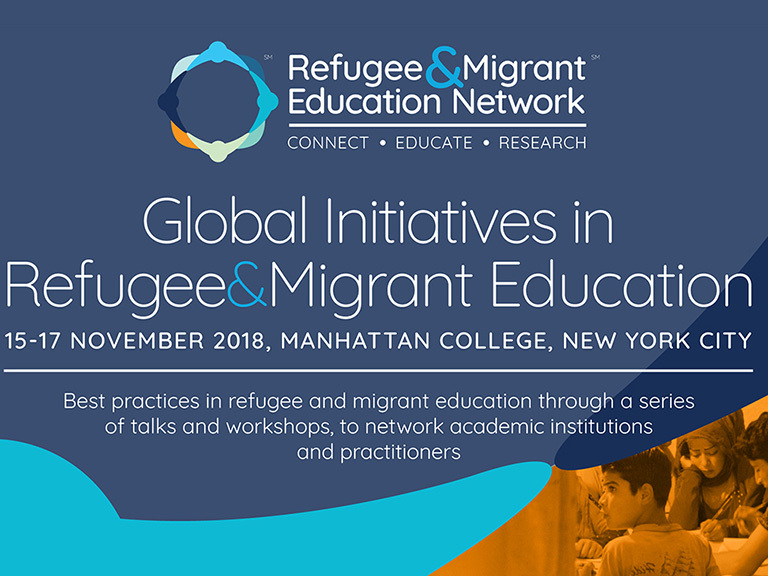 Manhattan College hosted the three-day event focused on higher education’s role in refugee and migrant education. 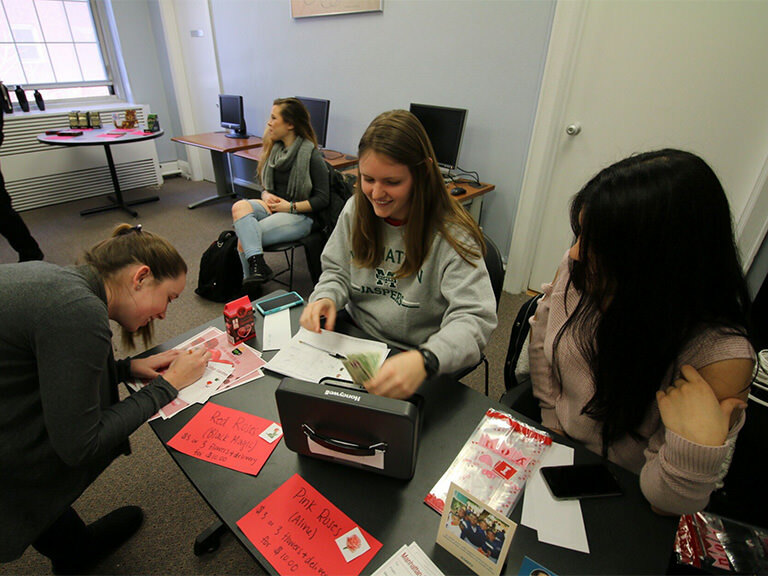 For the fourth consecutive year, Manhattan College joins the Giving Tuesday movement, an international celebration of giving. 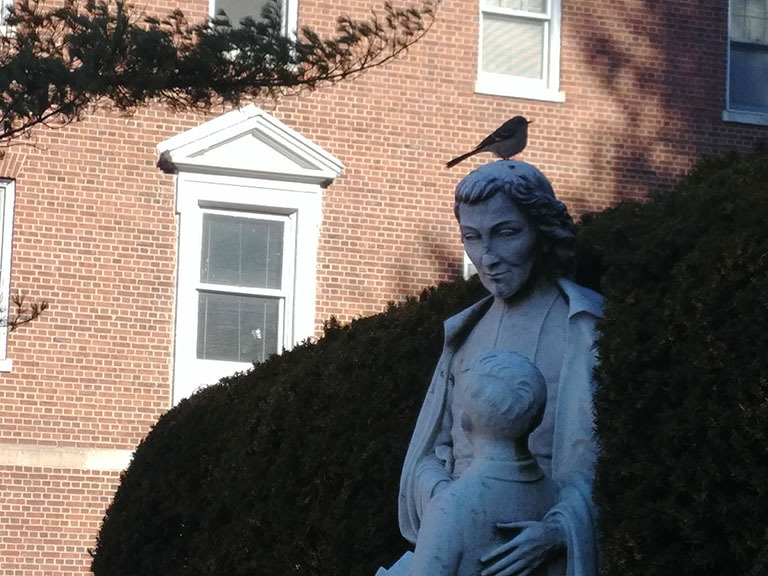 The Manhattan College community dedicates a community artwork to commemorate the life and legacy of St. John Baptist de La Salle for the Tercentenary. 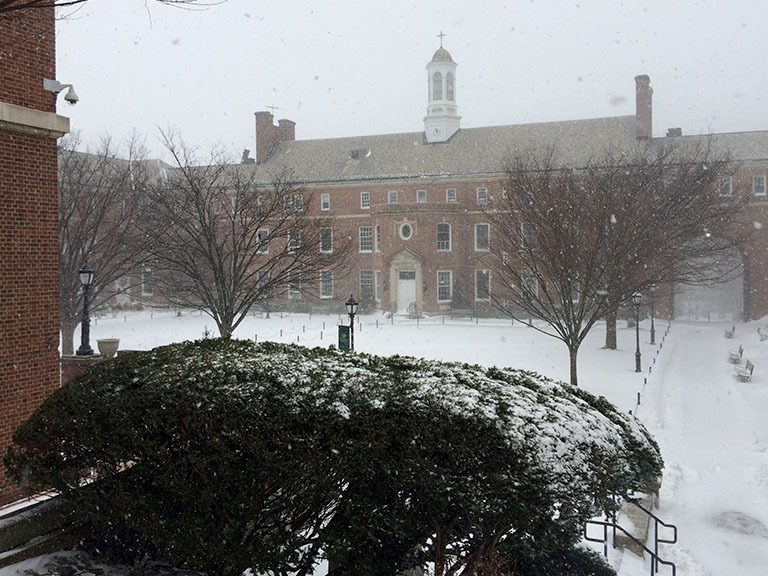 From all of us at Manhattan College, we wish you a Merry Christmas, blessed New Year, and a happy and healthy holiday season. 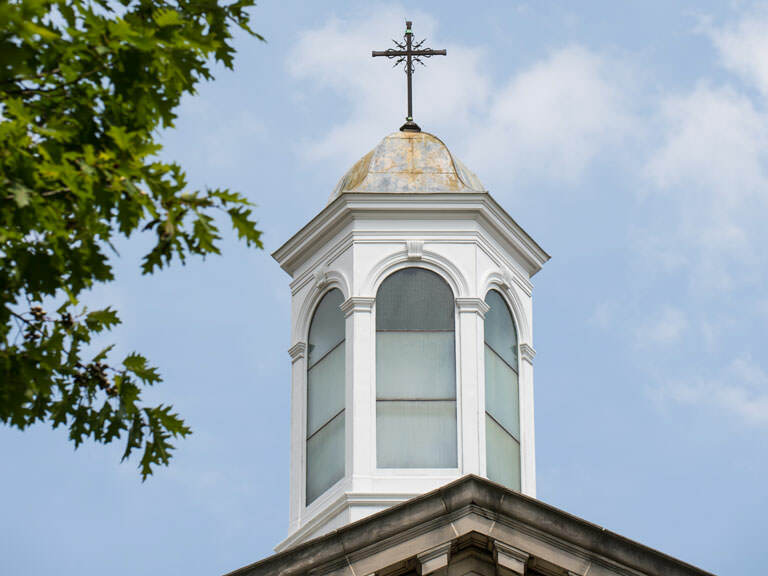 An introductory religious studies course helps student veterans transition to college life. 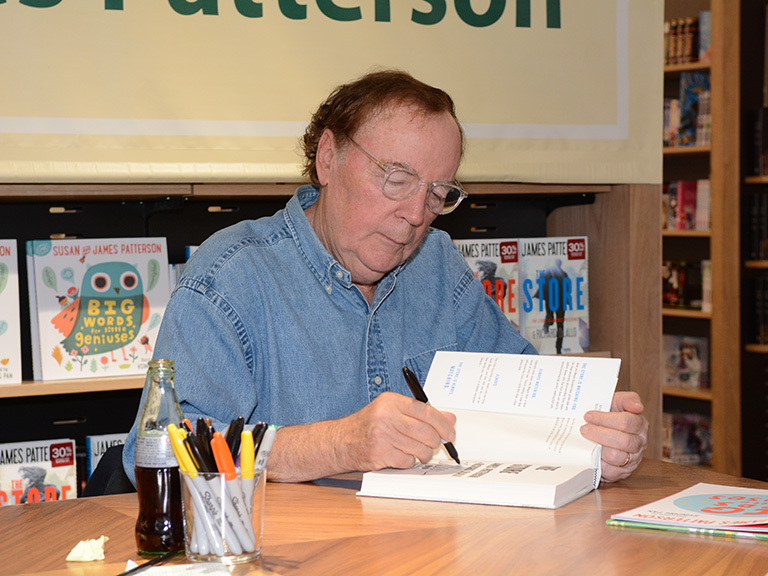 The best-selling novelist and Manhattan College alum continues to give back. 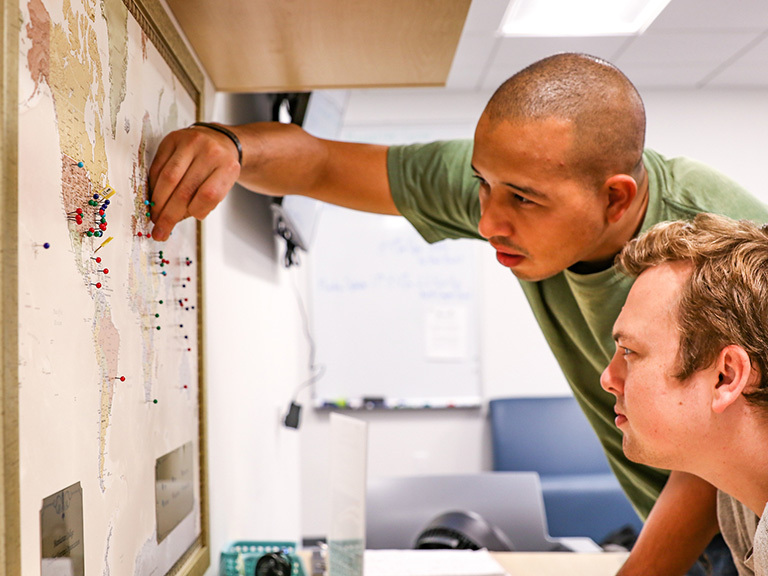 Manhattan continues to be recognized for its work with student veterans. 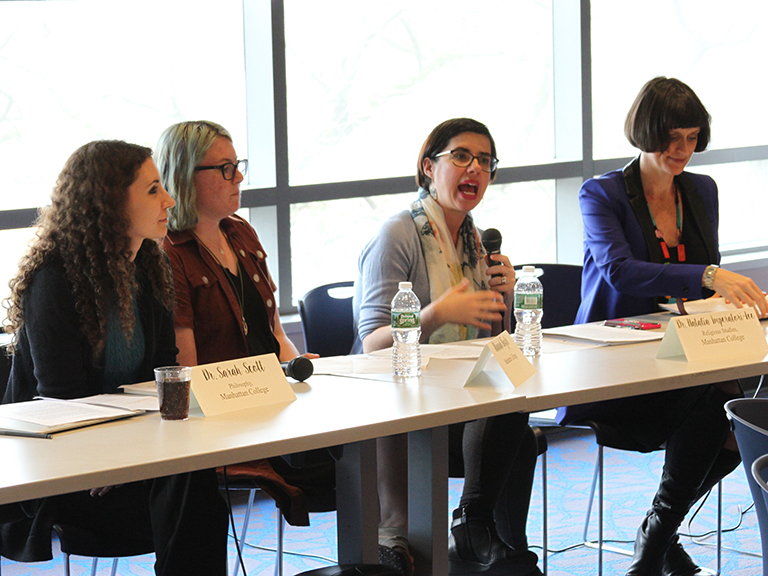 The Center will foster research, scholarship, and student discussion about gender, sexuality and embodiment within the Lasallian tradition. 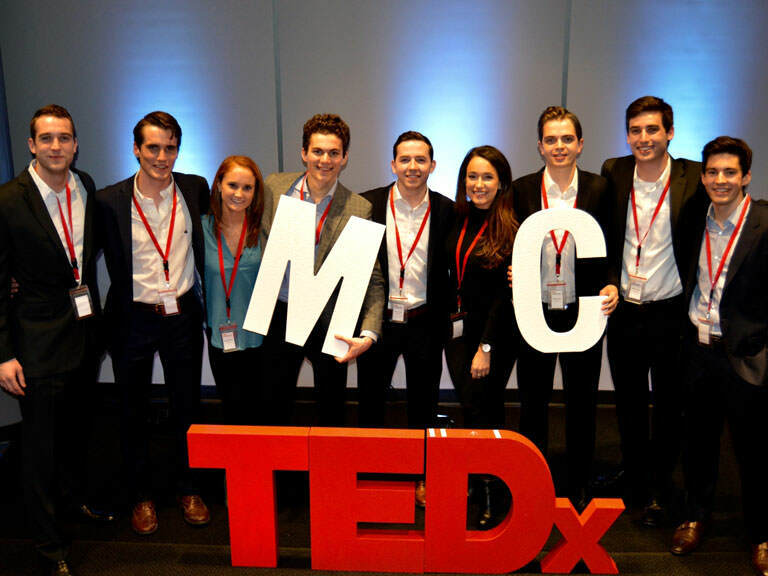 From Yelping the greatest slice of New York City pizza near campus to balancing your academic and extracurricular interests. 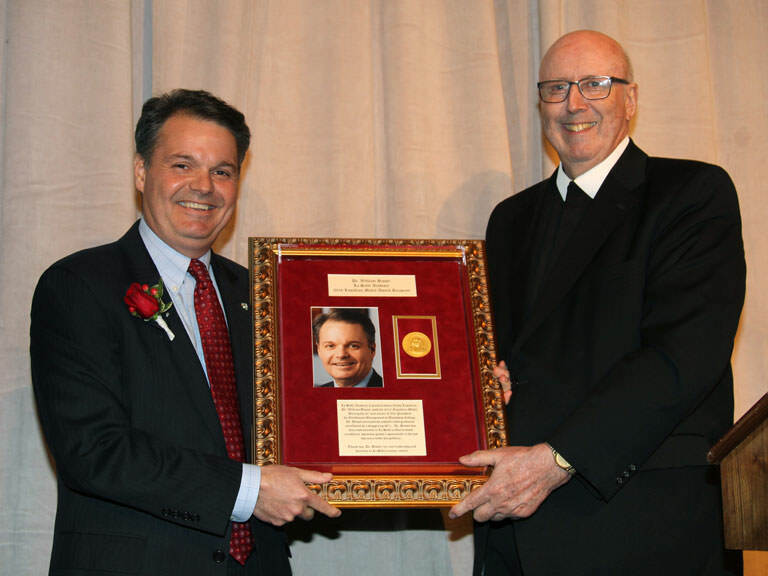 Brother Frank Byrne, FSC, Lynn Martin ’98 and John McAvoy ’80 have been selected to the board of trustees. 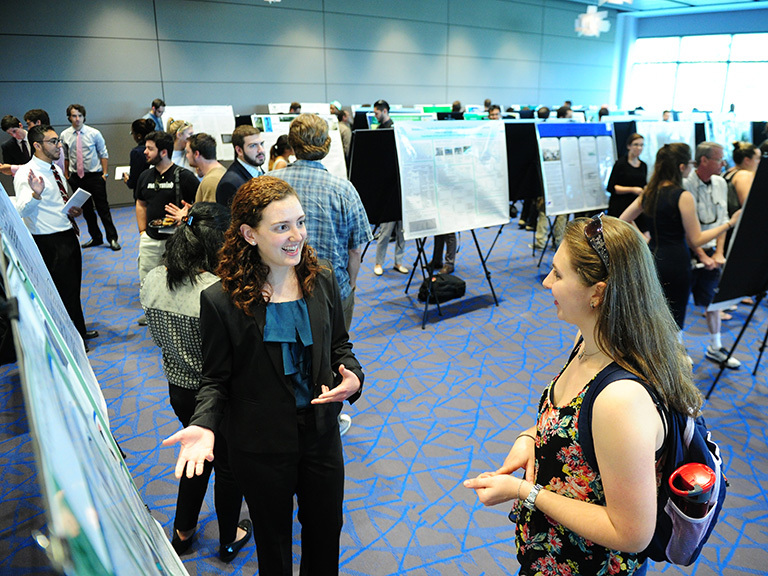 Students present on topics in liberal arts, business, health, science and engineering. 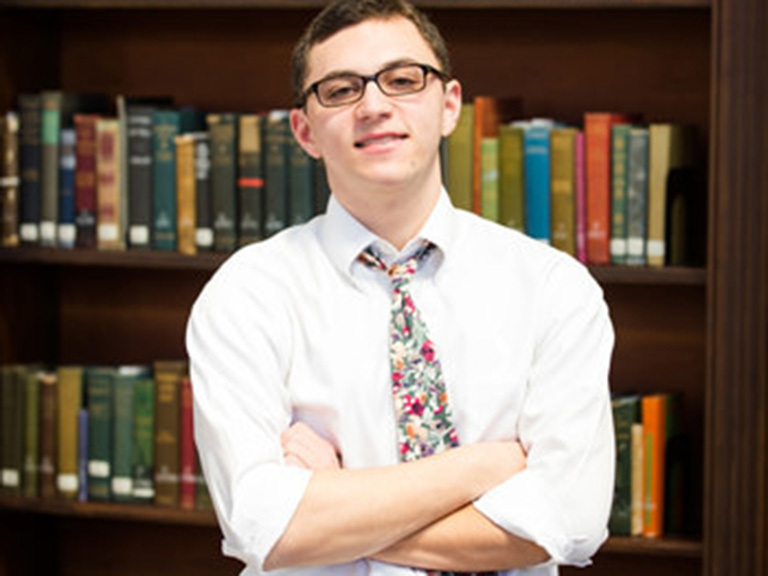 In the role, Kale will reinforce the College’s dedication to the creation of a safe climate for all. 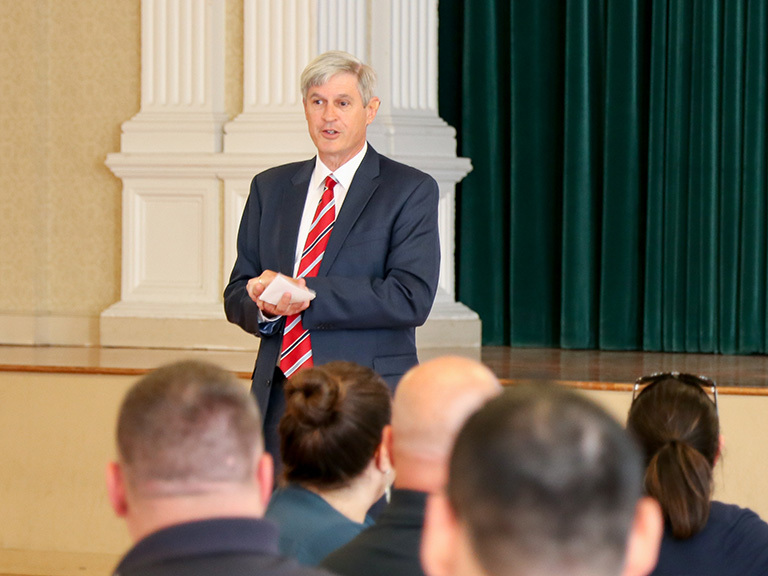 Student veterans and engineering programs highlighted as standout programs. 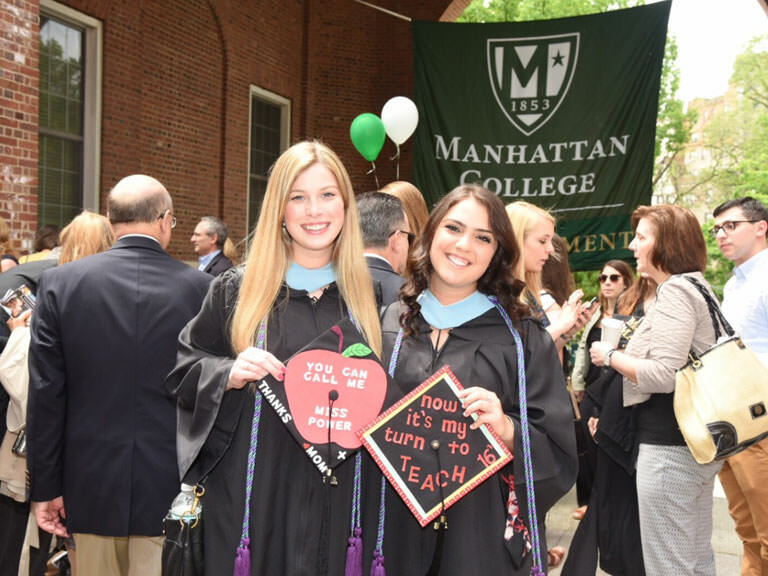 What Can You Do with a Manhattan College Education? Anything. 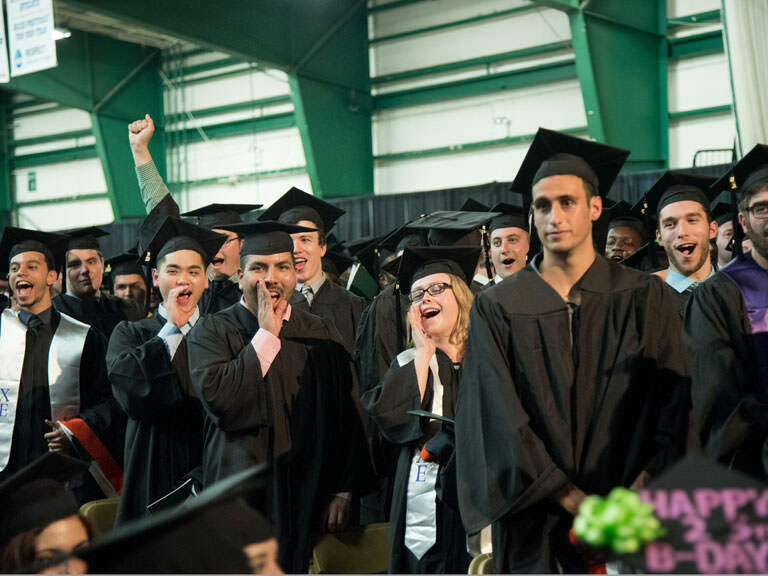 Manhattan College graduates are landing jobs in their desired fields with strong salaries. 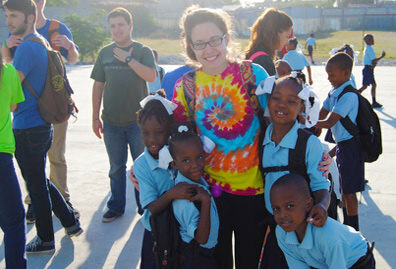 Clyde’s research in development and poverty alleviation will benefit Salvation Army’s mission. The Higher Education Capital Matching Grant will be used toward the continued South Campus upgrades. 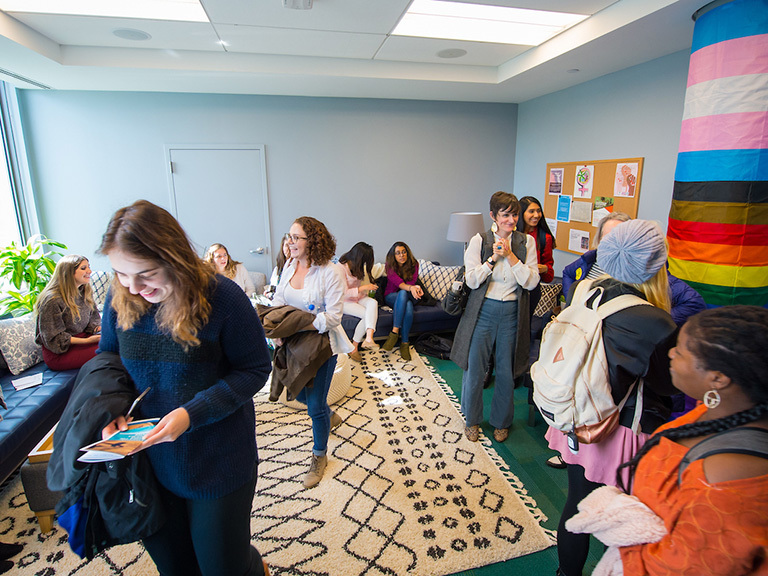 While living together in a community in Lee Hall, freshmen in the Arches program take one class together per semester that incorporates service projects and cultural excursions in New York City. 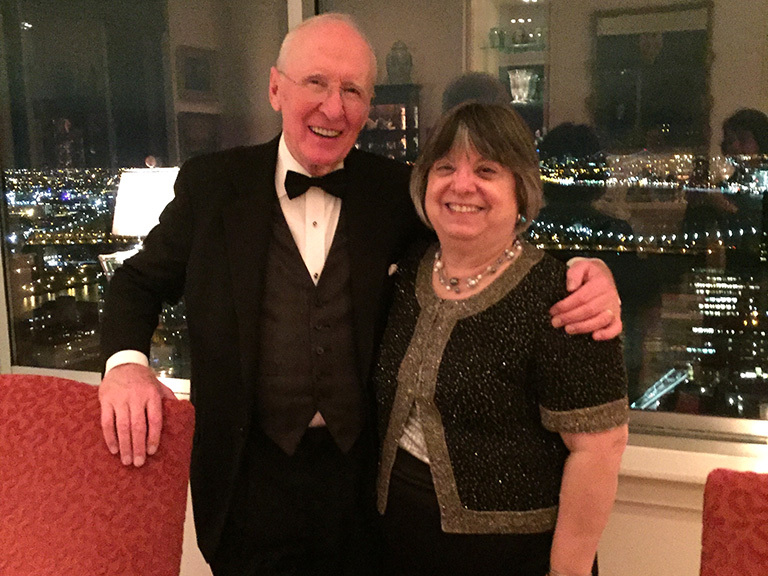 Helene and Ken Orce '65 are calling on others to help them raise more than $15 million to support the College. 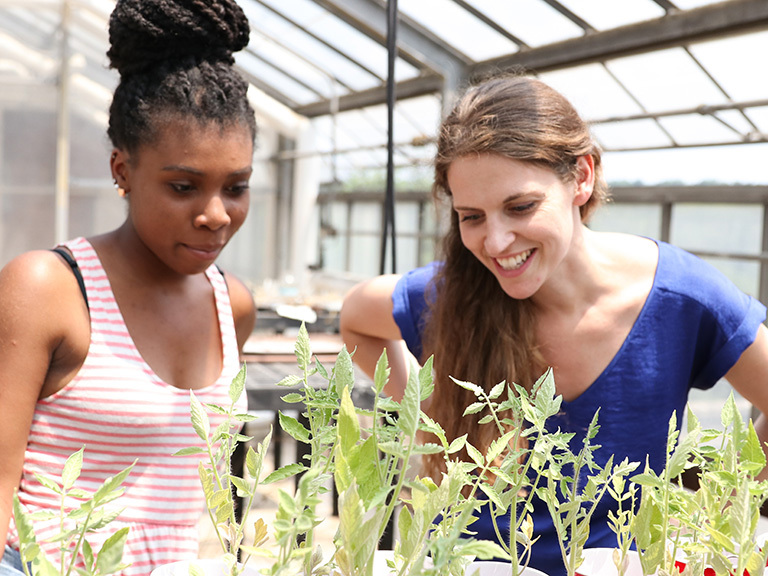 Students from all five undergraduate schools are conducting Manhattan College research in 2018. 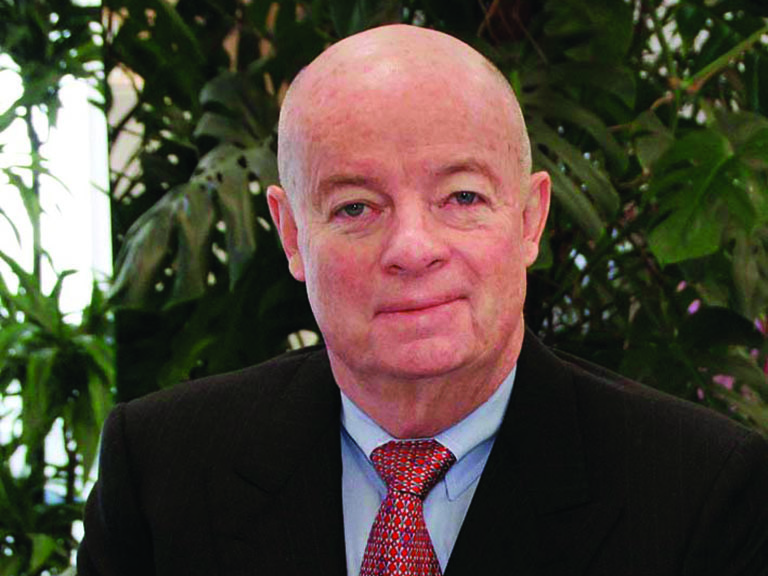 Walsh served as the commissioner of New York City's Department of Small Business Services for 12 years. 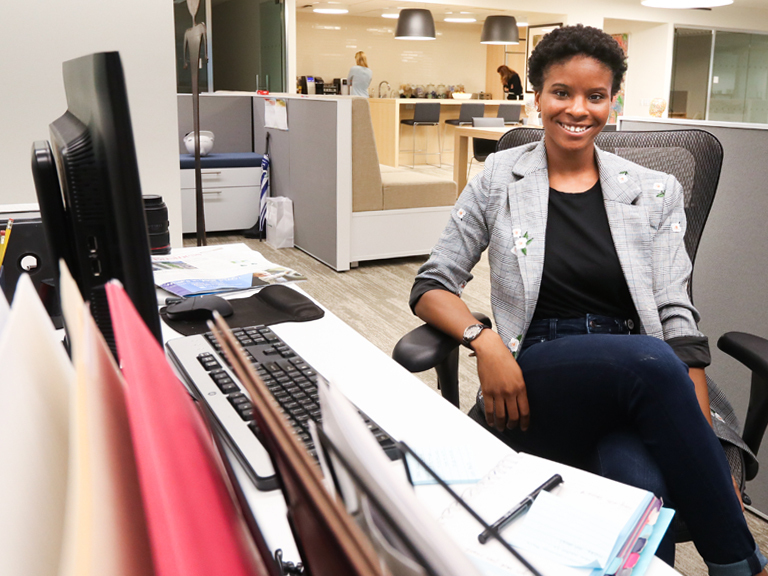 The business alumna from Riverdale has built an illustrious career in advertising upon two prevailing principles: client relationships and data-driven results. 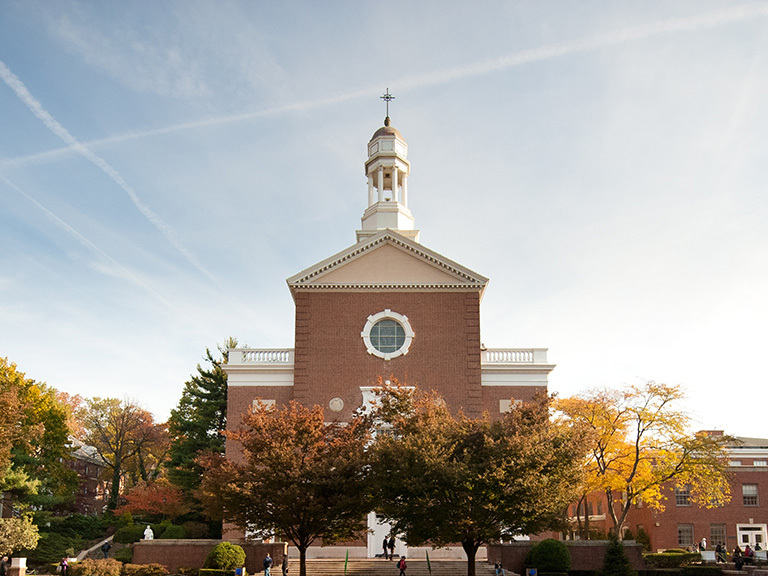 The College will host the annual Lasallian conference for the second consecutive year. 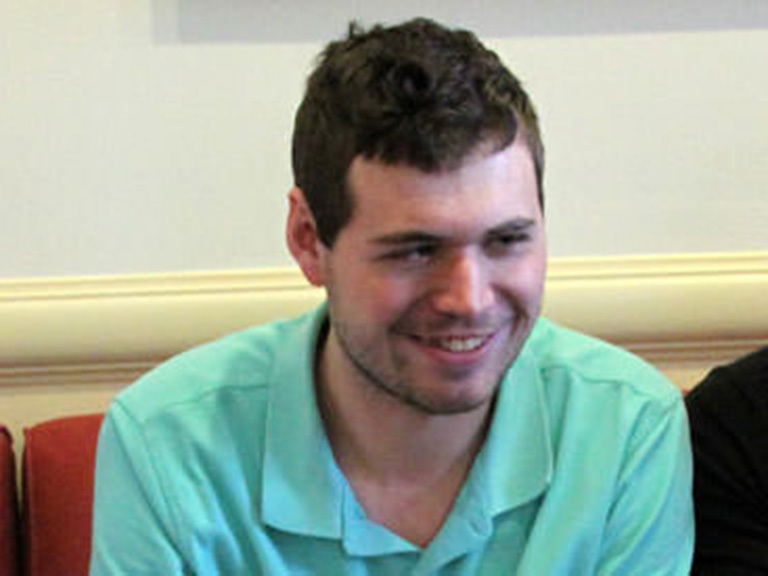 DeGuisto received a posthumous bachelor’s degree in May. 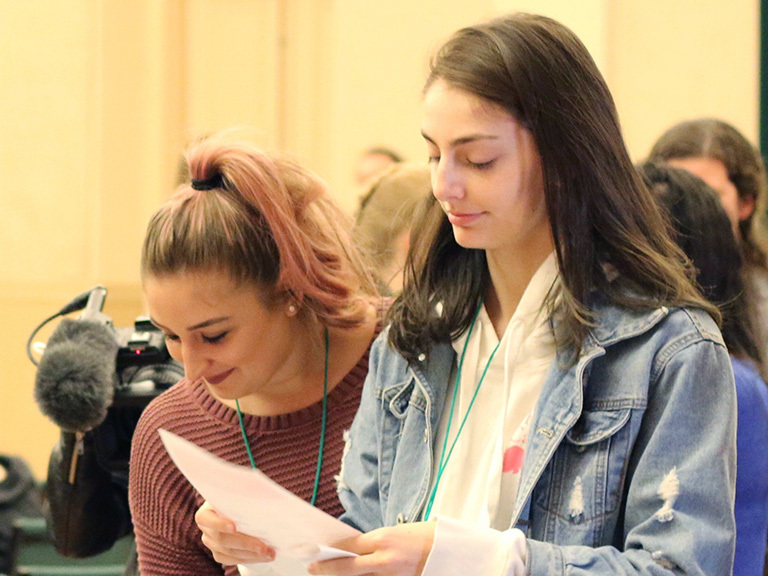 Students from near and far came to Riverdale to analyze the city’s contracts and budget. 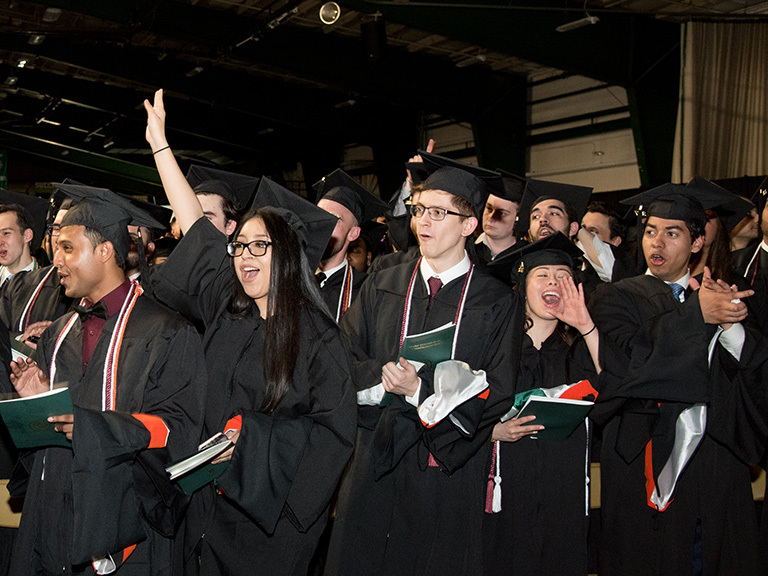 More than 1,000 graduates participated in Manhattan College's Commencement exercises from May 16-18 in Draddy Gymnasium. 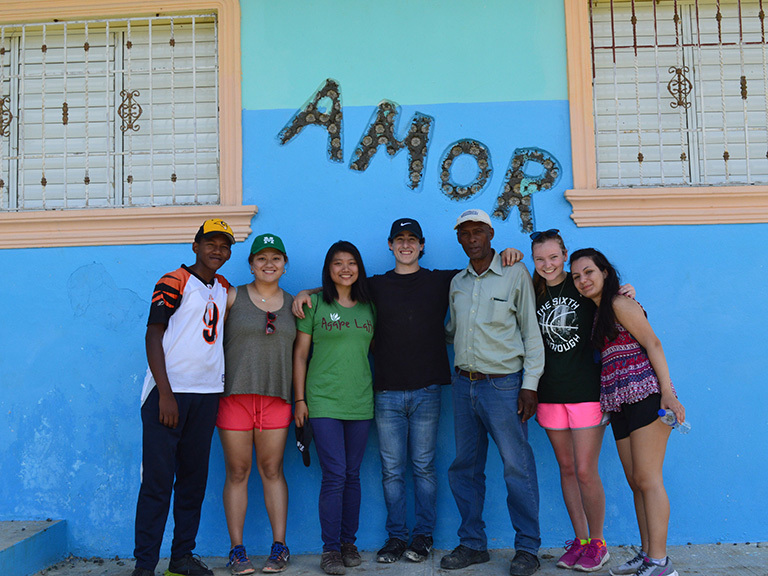 Interested individuals can participate in a variety of programs this summer. 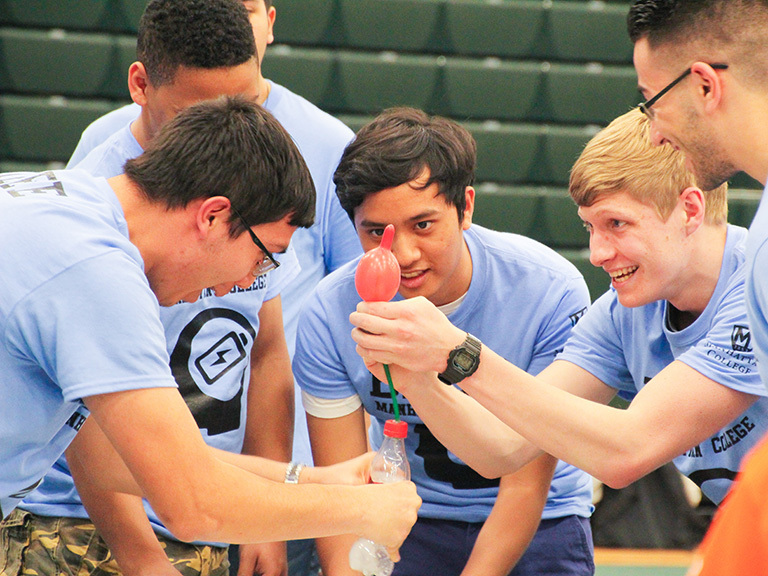 The civil engineers emerged victorious and earned bragging rights for the year. 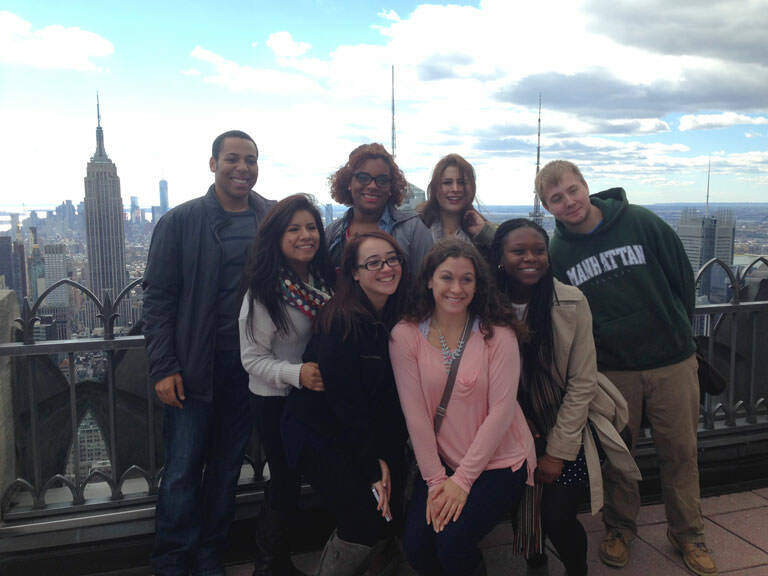 Students and faculty spent the month of April volunteering in New York City. 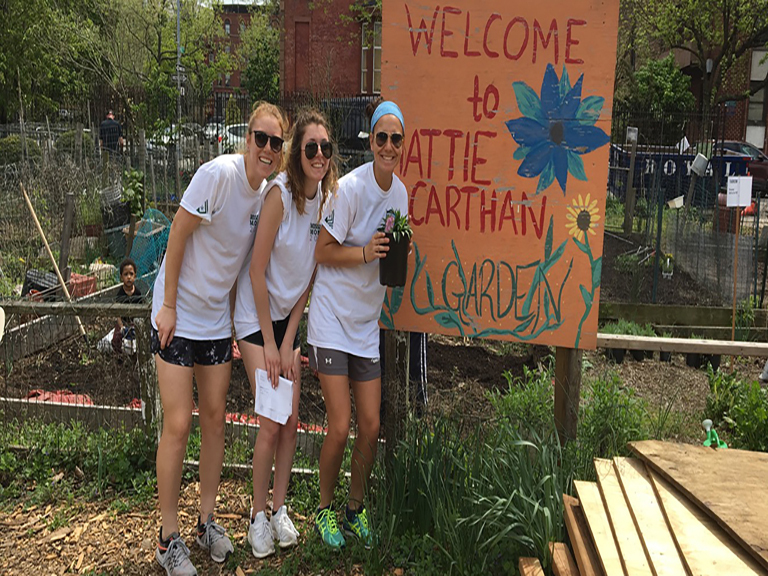 In doing so, they carried out the Manhattan College mission, which inspires us to lead and serve our community. 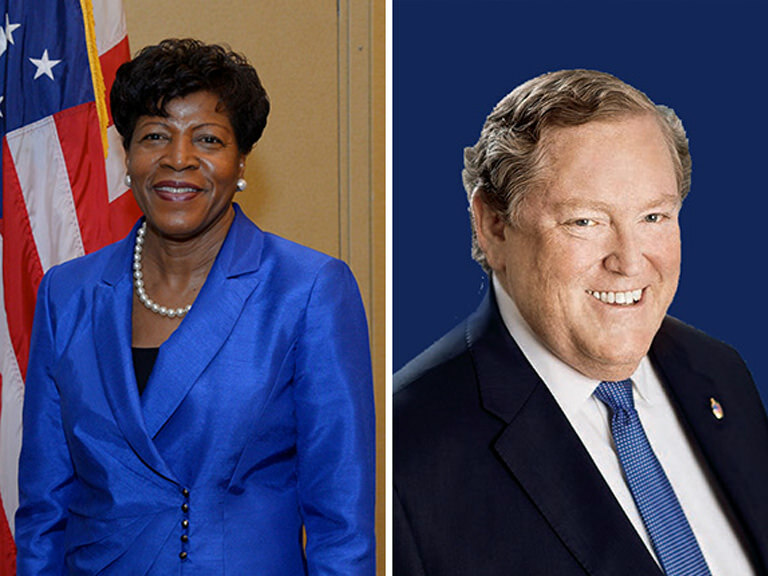 Miller and Murphy will receive honorary degrees during the week of Commencement. 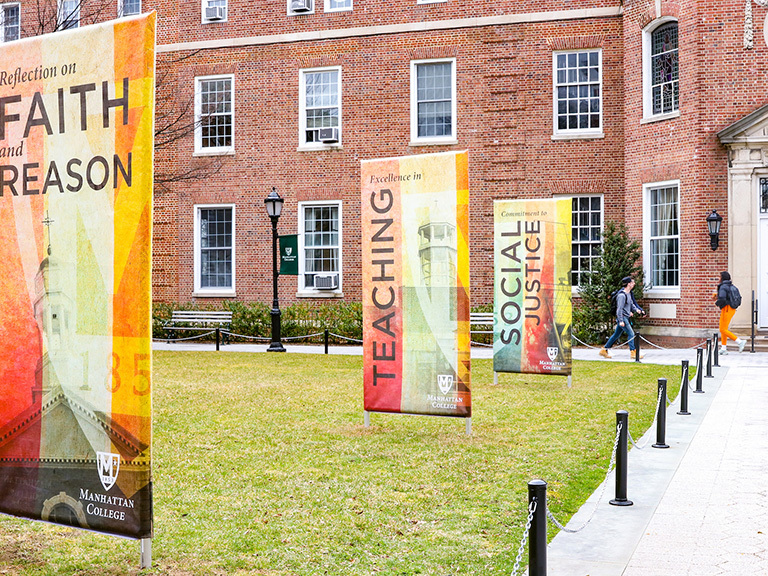 During the month of April, Manhattan College will host more than 100 events that reflect its mission and heritage. 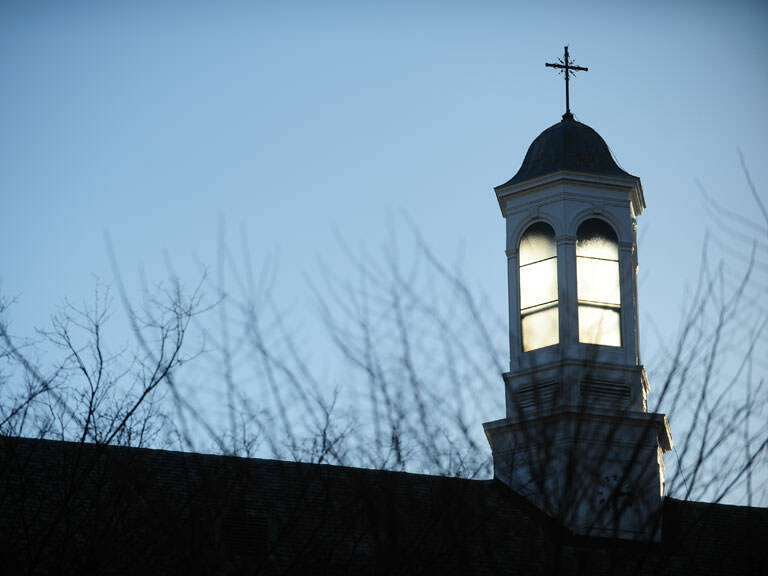 Throughout Lent, Manhattan College's students, faculty and staff will reflect on the season. 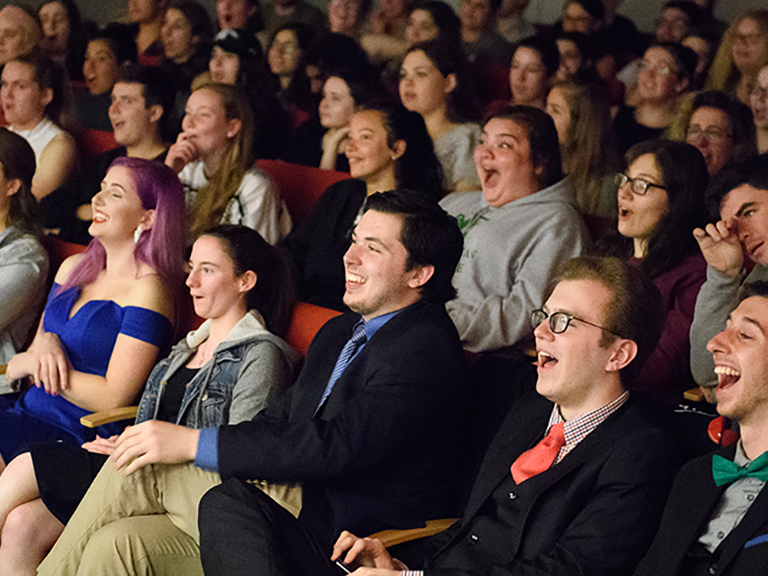 Ranging from the cocurricular to the performing arts, Manhattan’s vast selection of clubs and organizations helps like-minded Jaspers connect. Interested parents and students can visit during open houses throughout March, April and May. 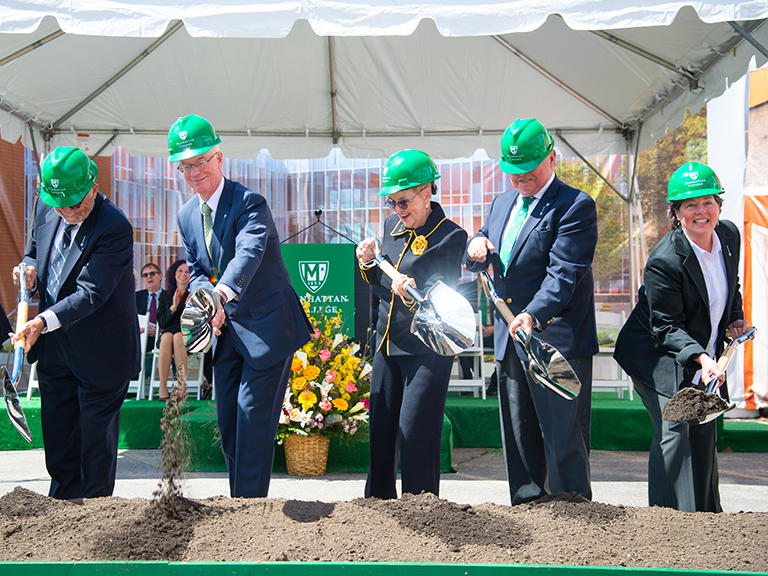 The largest gift in College history will support what will be known as the O’Malley School of Business. 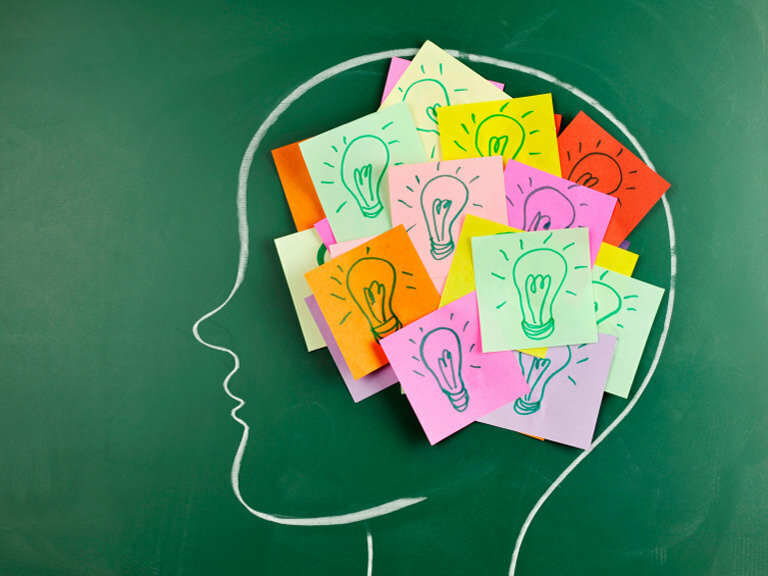 The program’s mission is to develop female emerging leaders and empower them to advance professionally. 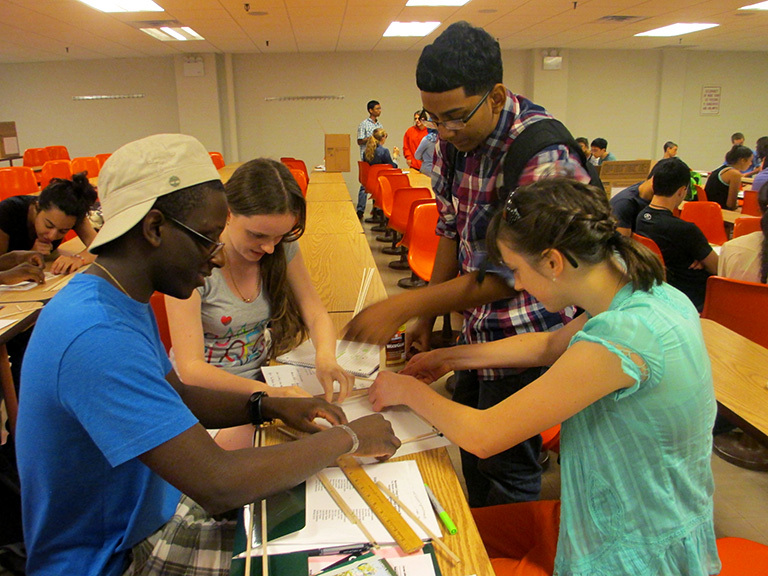 Manhattan College’s long-running engineering awareness program returns to campus in June. 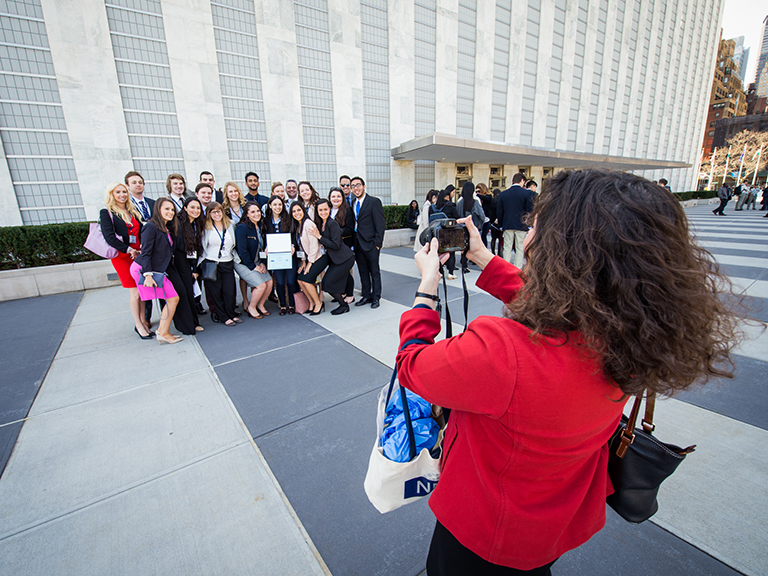 From February 11-27, the College will host a series of events focused on peace efforts. 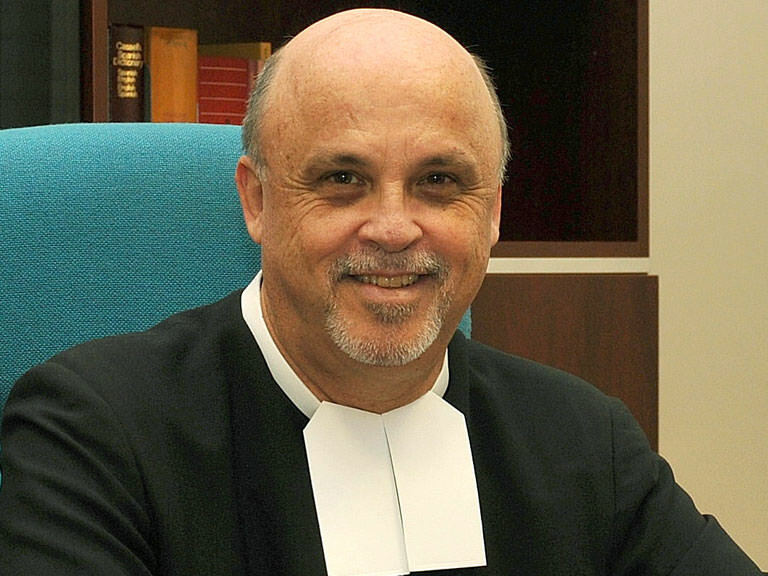 A leader in the international organization will speak at the College on February 21. 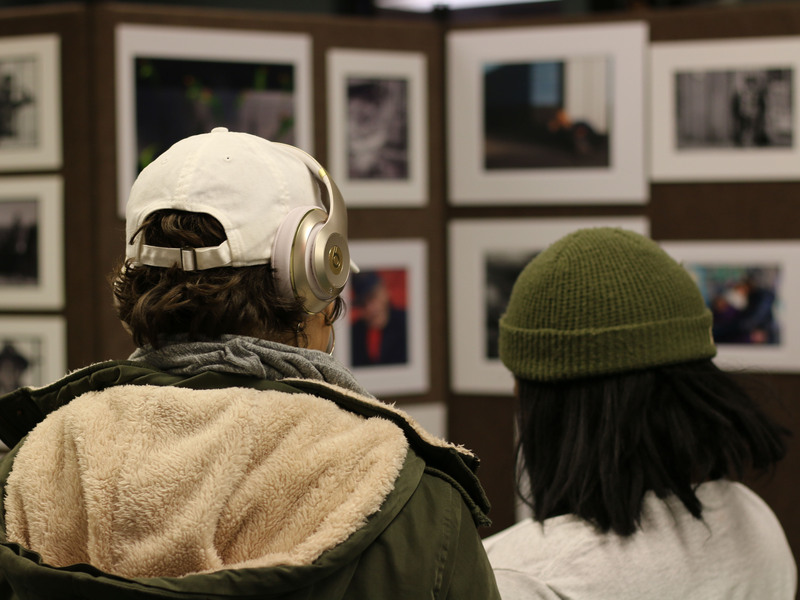 Bethlehem Beyond the Wall, a multimedia exhibition, will be on view at the College from Monday, Feb. 19 to Tuesday, Feb. 27. 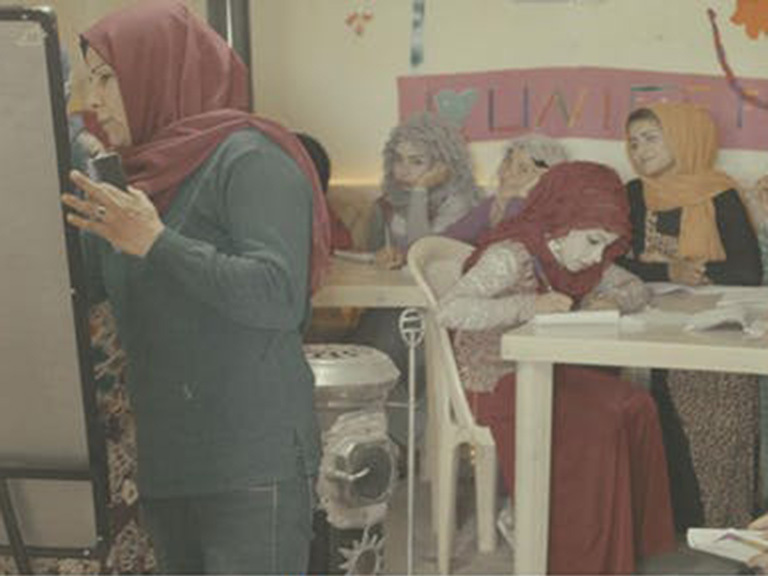 The exhibition will take place on campus from February 19-27. 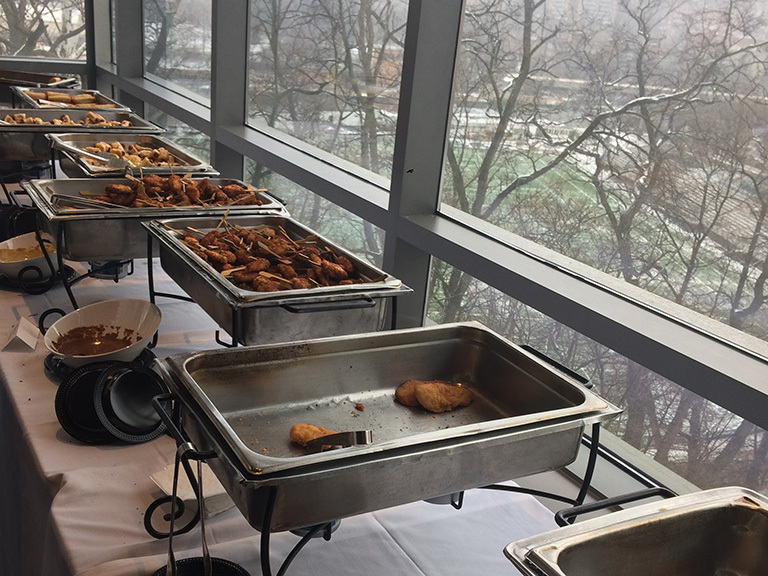 Student Life departments take to Twitter, Instagram to alert students of available food. 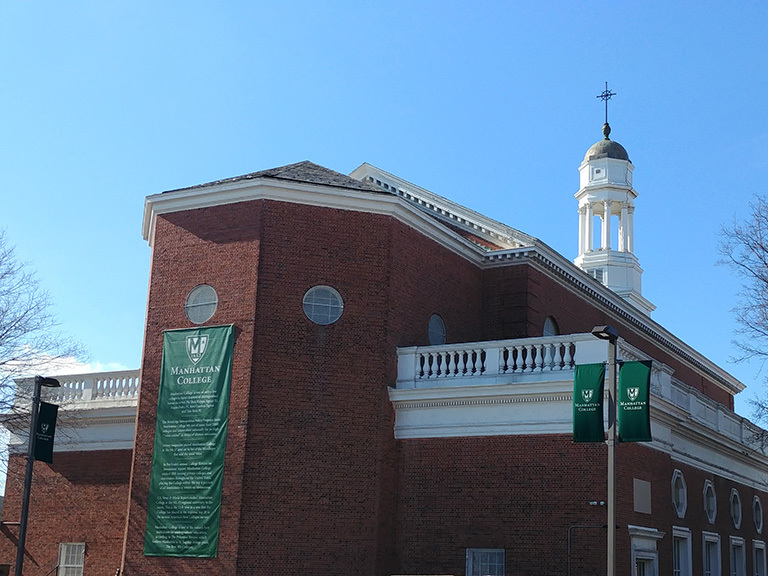 The Manhattan College president was named one of top 25 influencers in the borough. 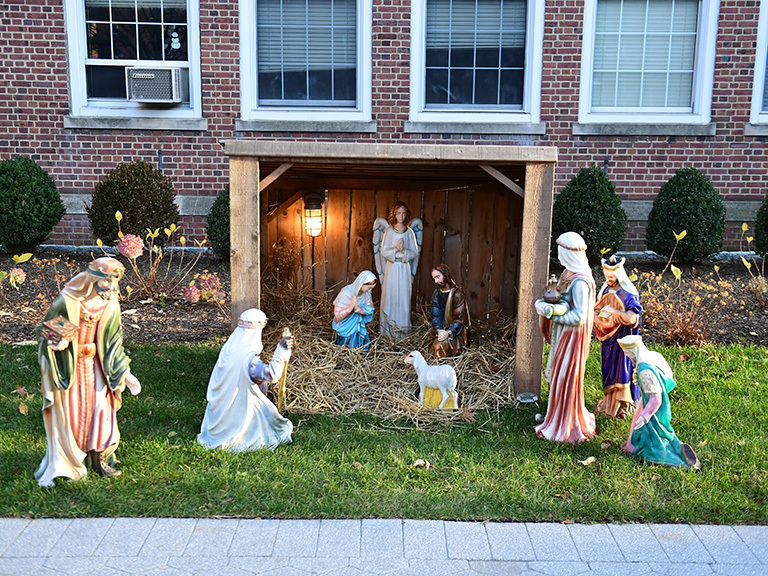 A Manhattan College sophomore reflects on Advent and the meaning of Christmas. 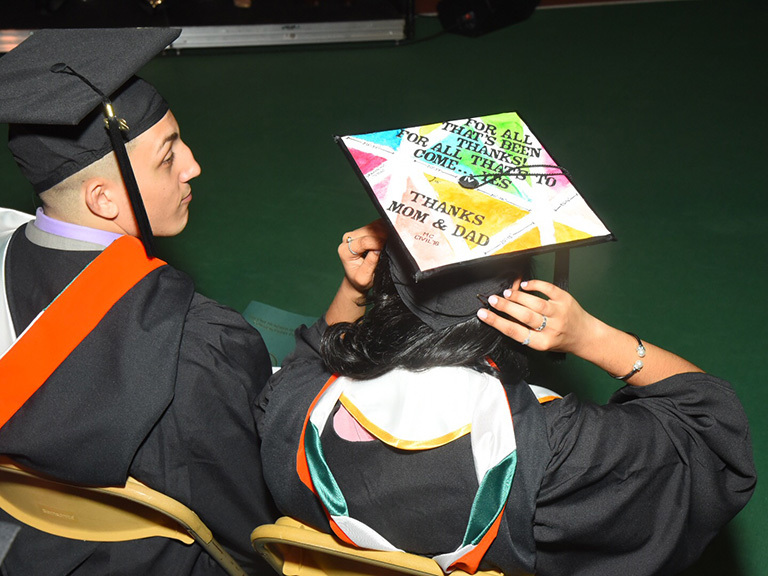 As 2017 draws to a close, we reflect on the ways the Manhattan College family has connected this year. 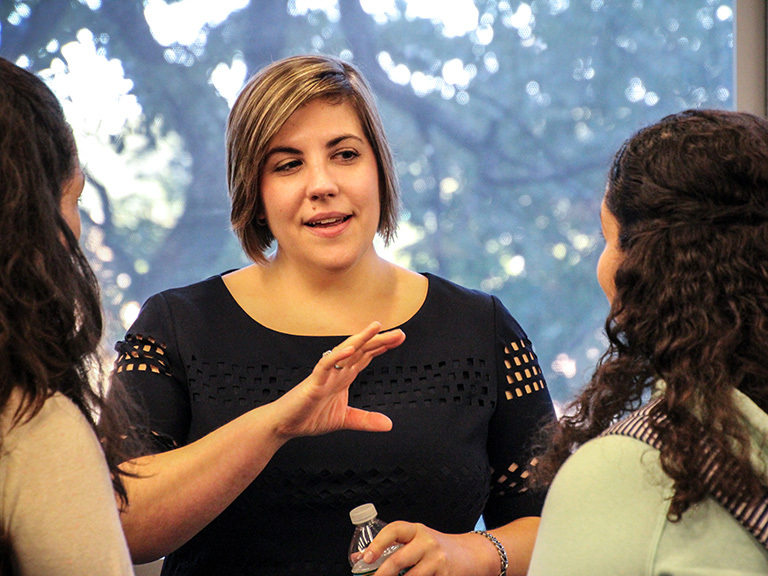 Mentors have proven to be an invaluable resource for female engineering alumni, faculty and students. 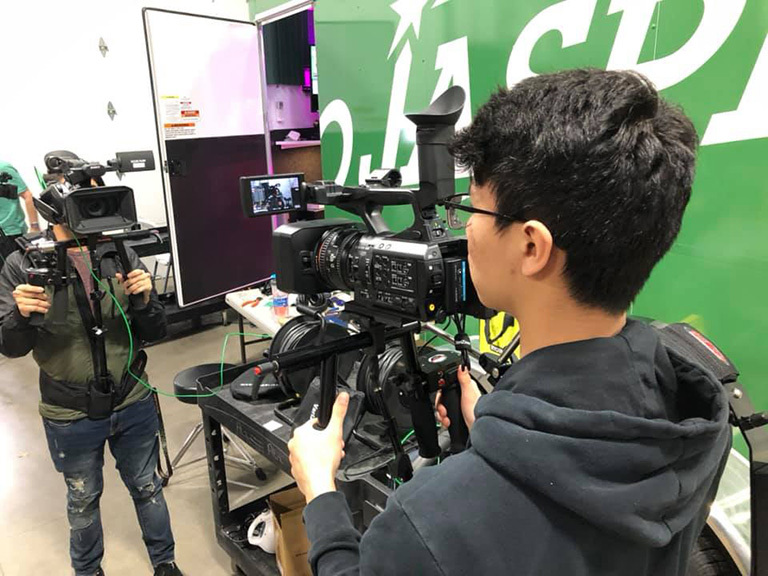 Communication majors will have the ability to take advantage of the College's partnership with ESPN to gain experience for working in the production field. 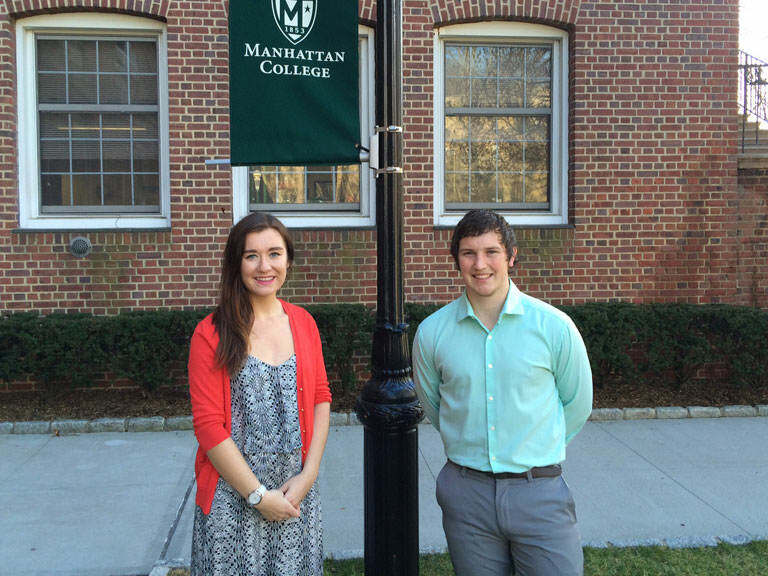 More than 100 veterans attend Manhattan College and excel in a variety of on-campus leadership roles. 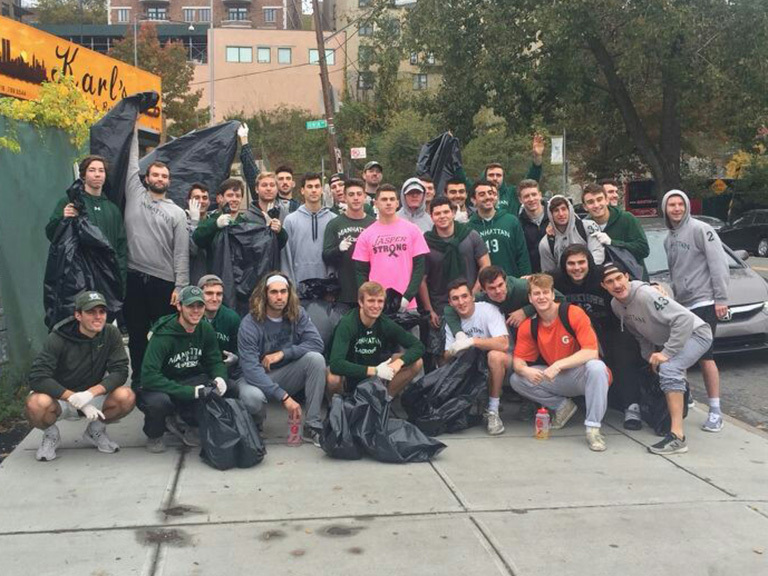 Nearly 100 Manhattan College students canvassed Riverdale on Nov. 5 to clean up adjacent streets. 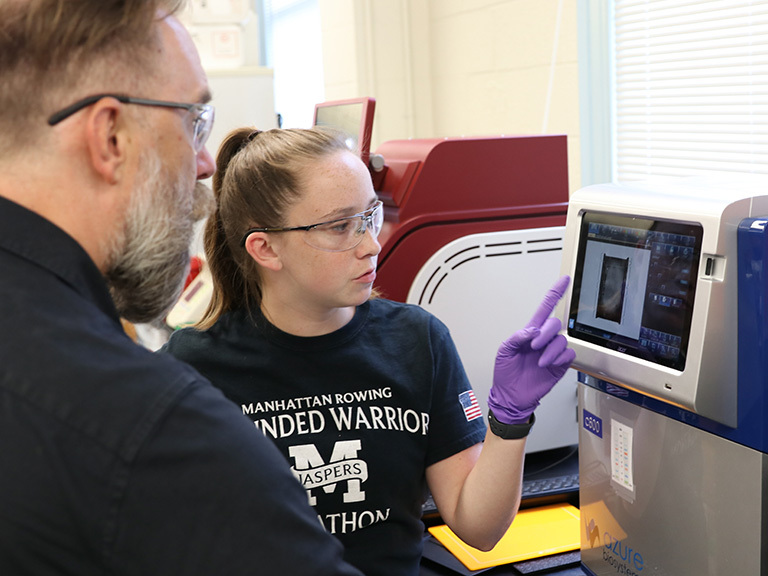 Bryan Wilkins, Ph.D., a faculty member in the Biochemistry department, is working on chromatin remodeler complexes in living cells. On Friday, Oct. 27, students in the School of Education will coordinate fun Halloween events for local residents. Kenneth Bouyer ’90, Brother Carlos Gómez Restrepo, FSC, Louis Lamatina ’79, Brother Dennis Lee, FSC and Suni Munshani join the College’s board. 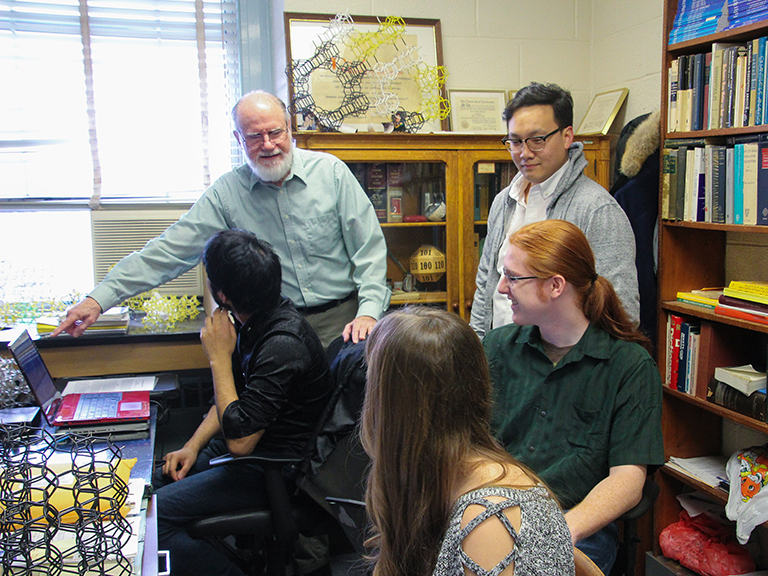 A faculty member in the philosophy department, Bollert is highly regarded by his students and peers. 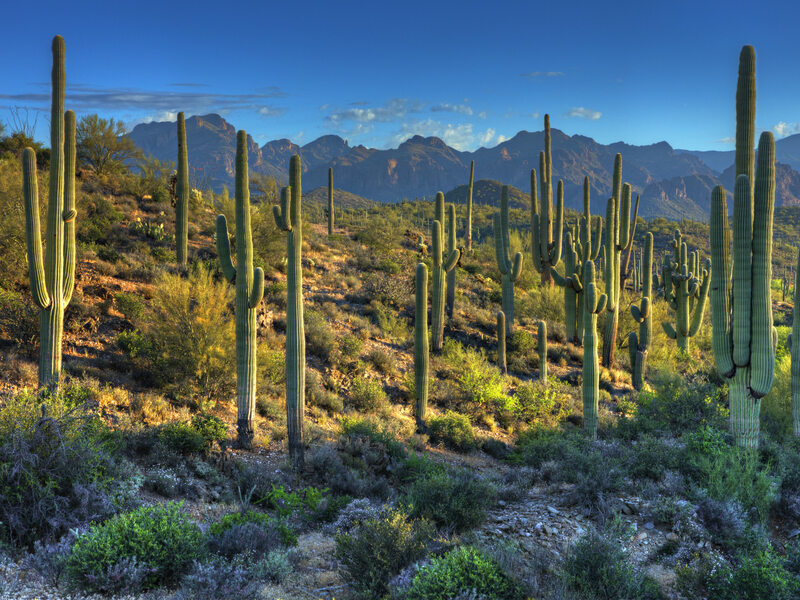 Professor Lance Evans tracks the decline of a Southwest American symbol with the help of student researchers. In this newly created position, Britt will serve as the College’s principal legal officer. 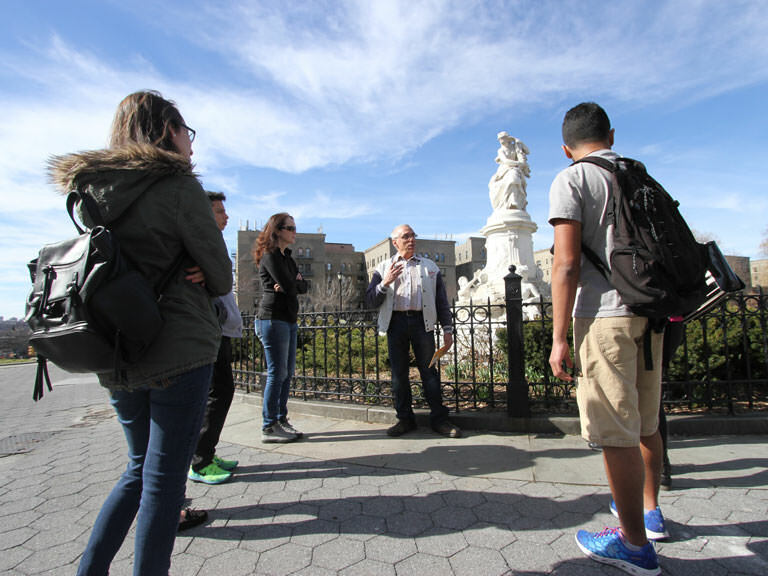 Starting in the spring of 2018, the College will offer a study-away Semester in New York City program for students from across the country. Fr. 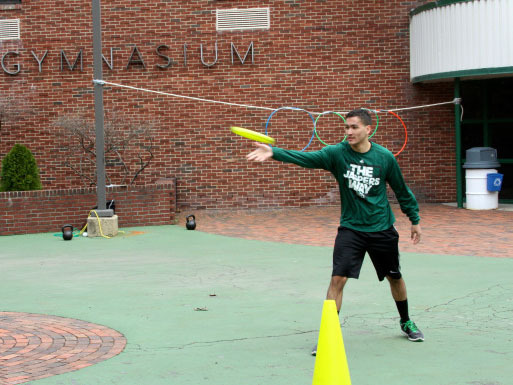 Franks is the newest member of Manhattan College’s campus community. 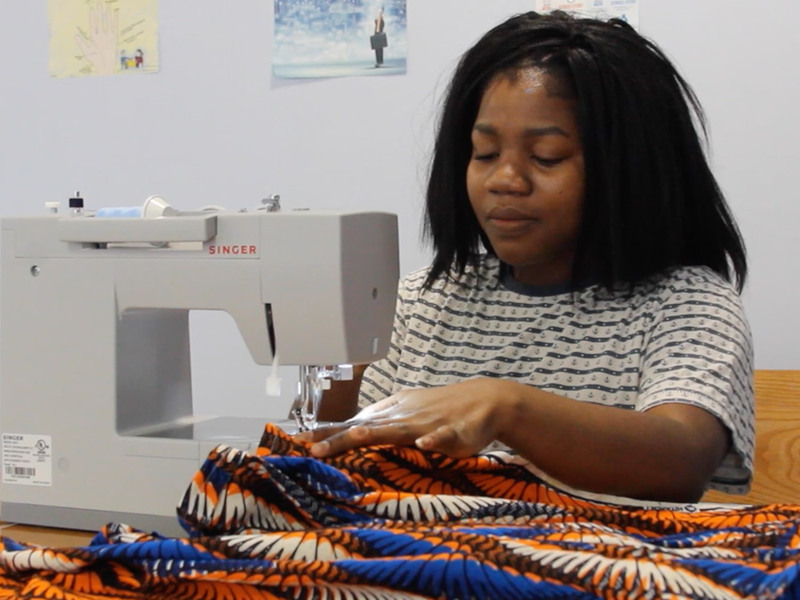 From July 24 – 28, the Center for Academic Success hosted its seventh annual Summer Literacy Institute, an immersive learning experience that this year helped 30 rising high school seniors in New York City plan for college. 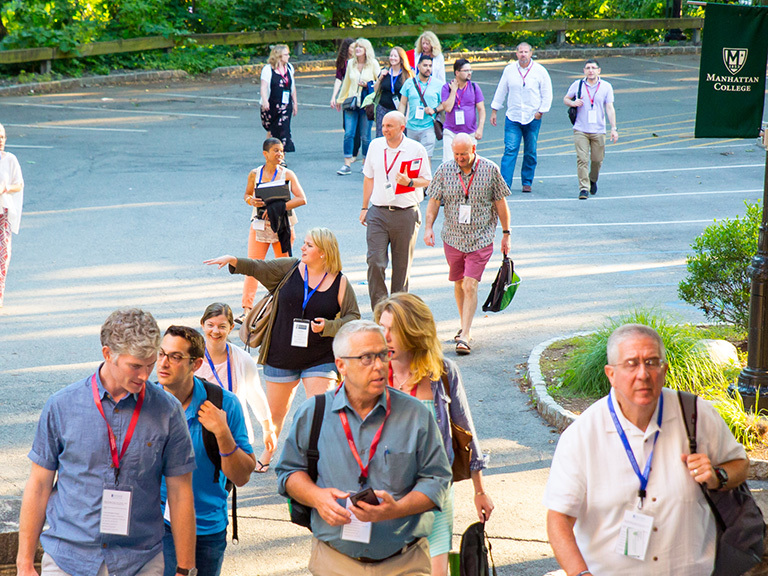 More than 120 education professionals from Pakistan to Papua New Guinea visited Manhattan College in June to attend the Buttimer Institute, an annual program that delves deeper into the aspects of our Lasallian Catholic heritage. 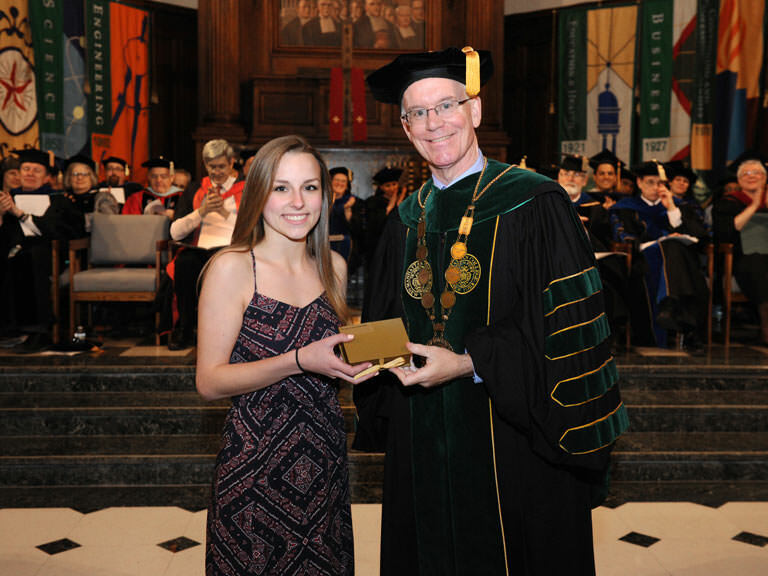 Class of 2017 creates a scholarship to honor the College’s late chaplain. 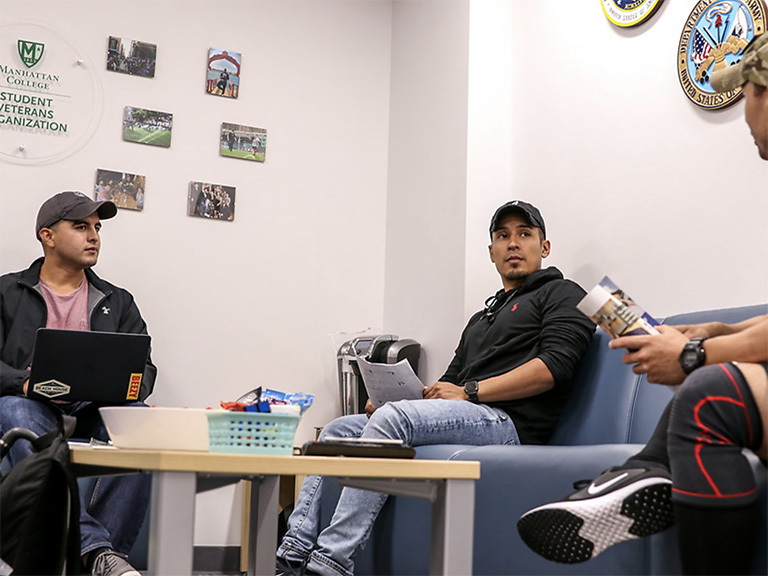 Over the past three years, a homegrown Veterans Success Program has provided a way for student veterans to acclimate to college life and find their place among peers. 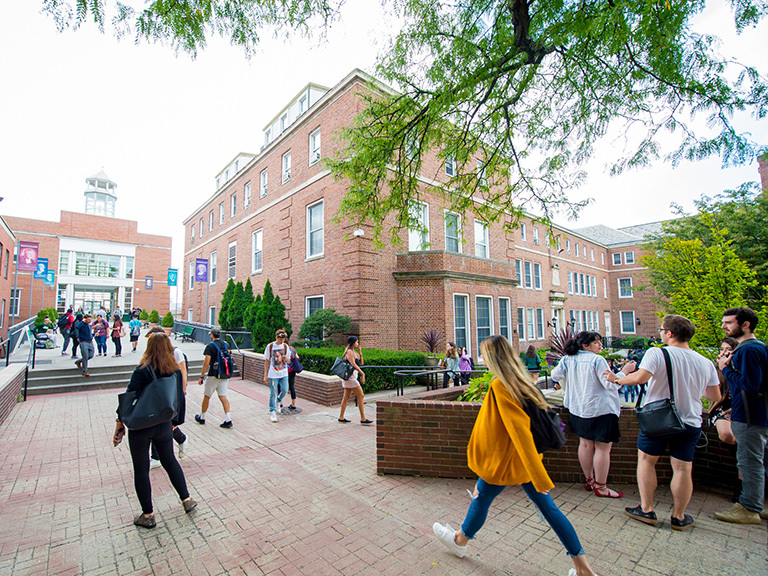 The College ranked among the top four percent nationwide in PayScale’s annual survey. 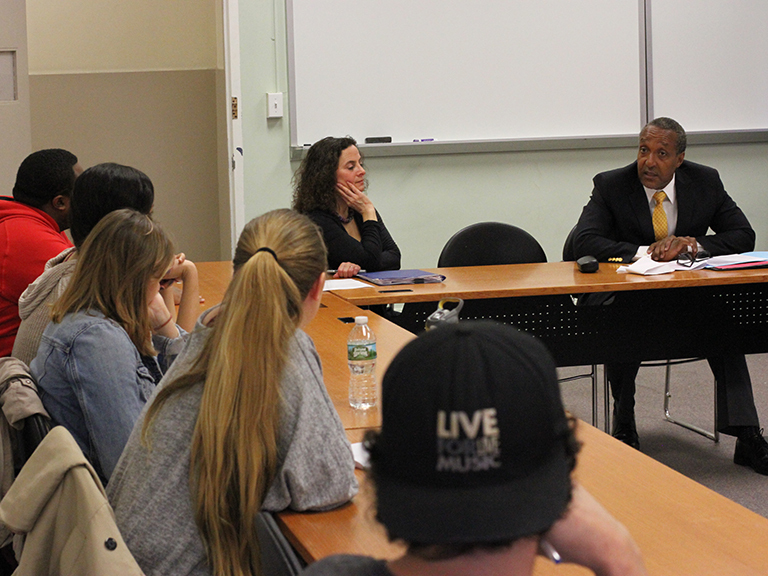 The Republic of Kenya’s permanent representative to the United Nations (U.N.), Ambassador Macharia Kamau, visited campus on Apr. 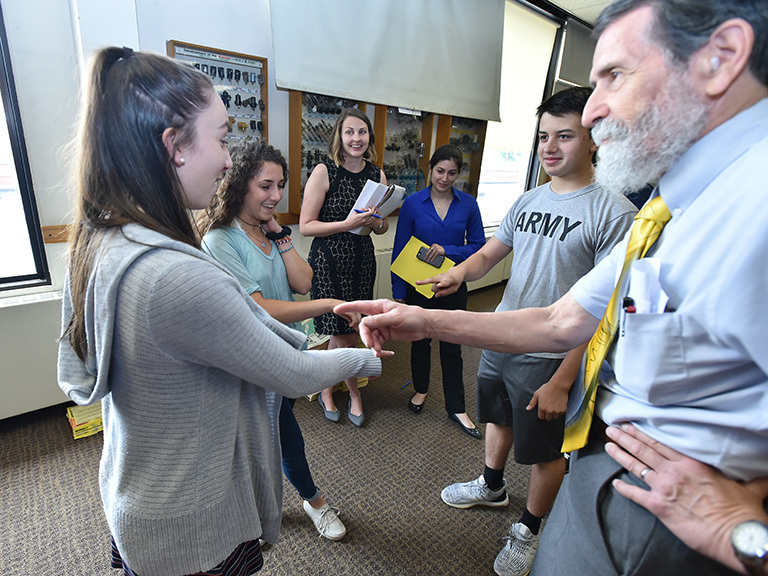 6 to discuss world affairs with College seniors studying conflict resolution. 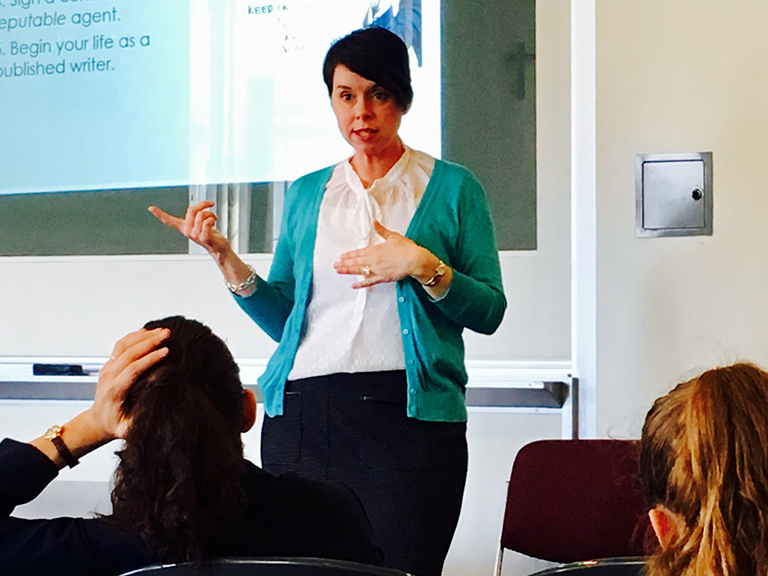 Christine Seifert, author of the widely popular young adult novel, The Predicteds, gave a lecture on Apr. 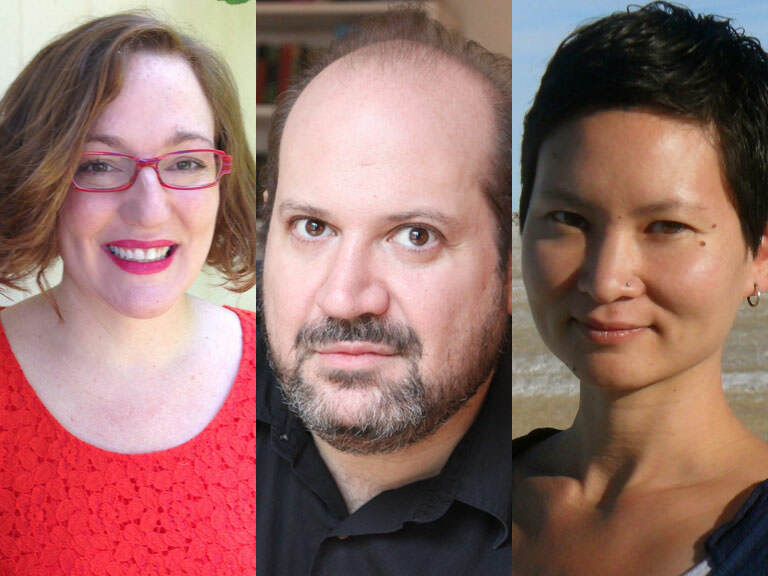 5 that outfitted aspiring writers with the skills to draft and publish their own stories. Thomas J. Moran ’74, chairman of the board of Mutual of America Life Insurance Company, will address the undergraduate class of 2017 and Bettye H. Perkins, Ed.D., president and chief executive officer of Today’s Students Tomorrow’s Teachers (TSTT), will be the keynote speaker at Spring Commencement. 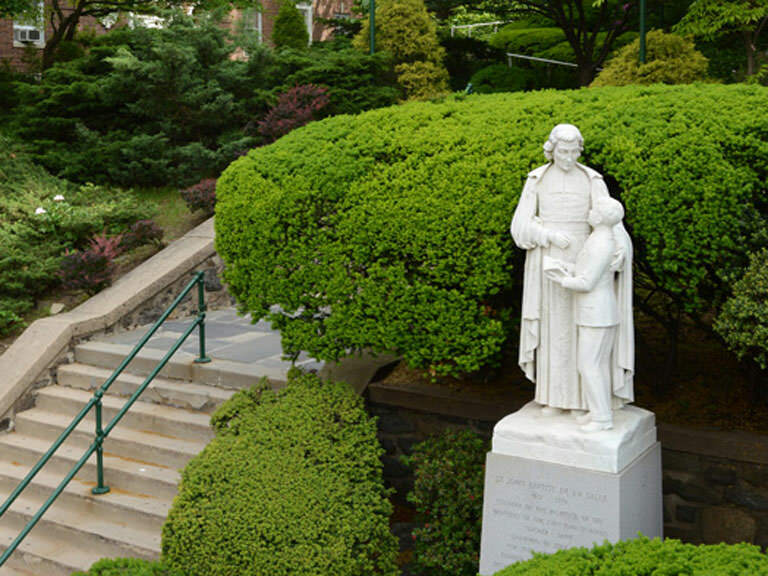 Manhattan College will host several events inspired by the legacy of John Baptist de La Salle. JustPeace invited four speakers of different disciplines to share their perspectives on the Dakota Access Pipeline build for World Water Day 2017. 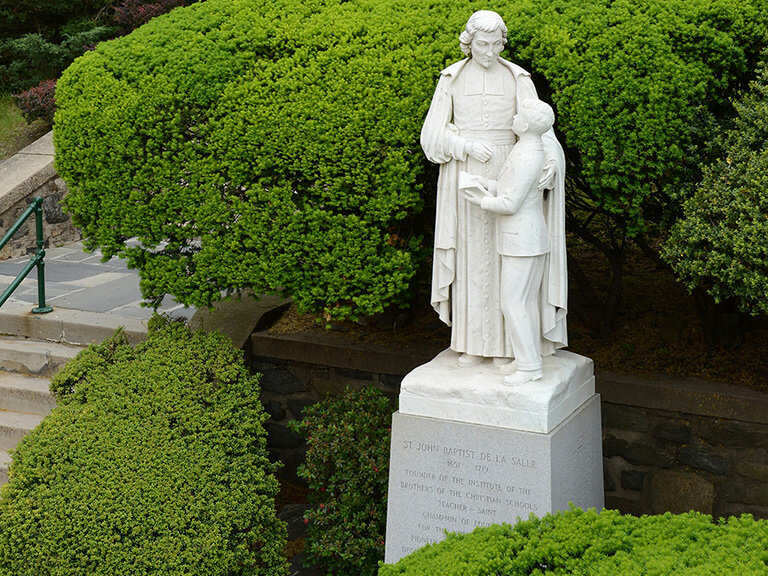 The two-week Lasallian retreat will take place this summer. 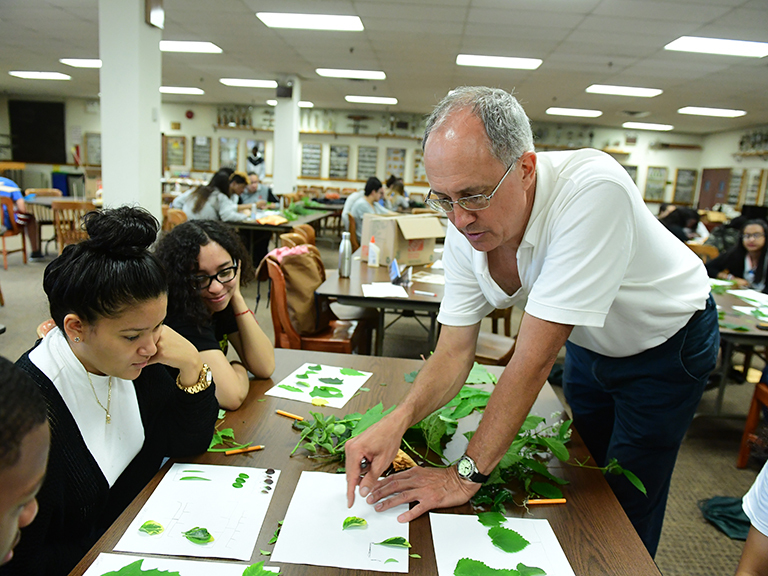 Manhattan College is increasing its efforts to include more community-based learning courses in the curriculum and forge more dynamic local partnerships. 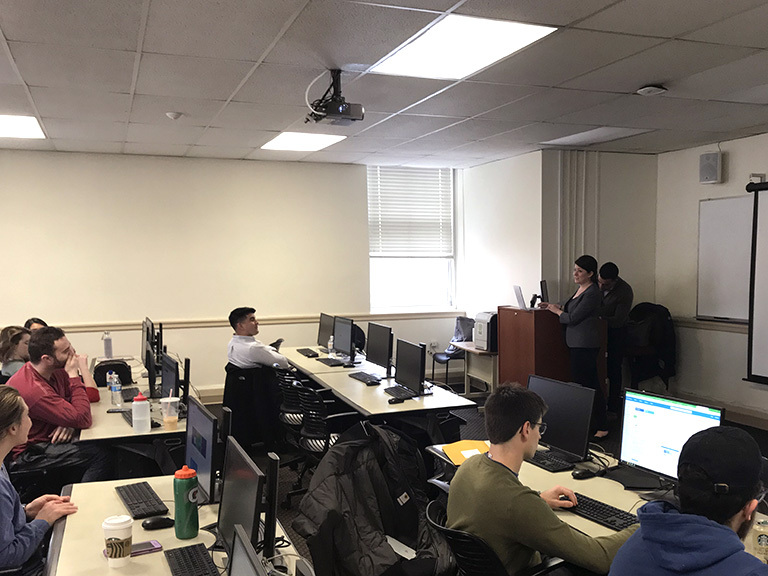 School of Business students created a business and marketing plan for the store, enhancing offerings to the College community. 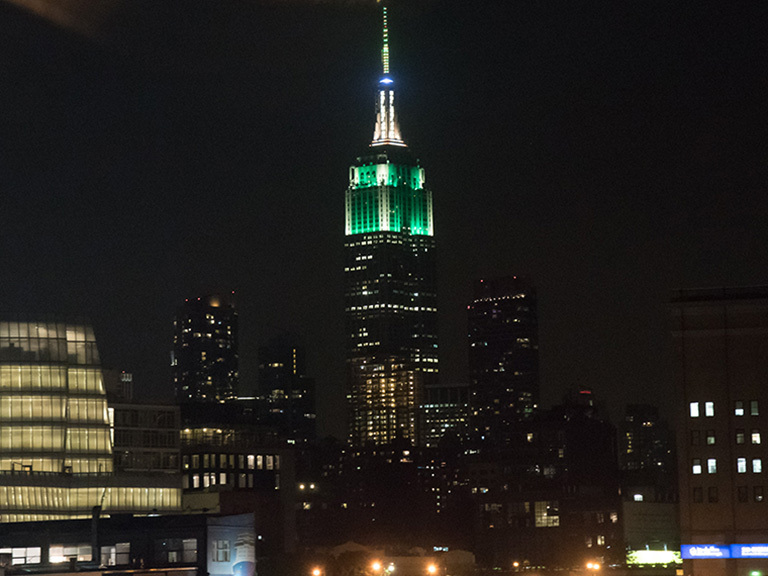 With New York City’s startup culture as a backdrop, Jaspers form a hub of creativity and innovation right here, on campus. 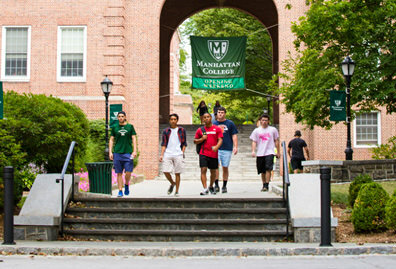 To broaden access and reframe the admissions process, Manhattan College joins a coalition to provide an alternative way to apply to college. 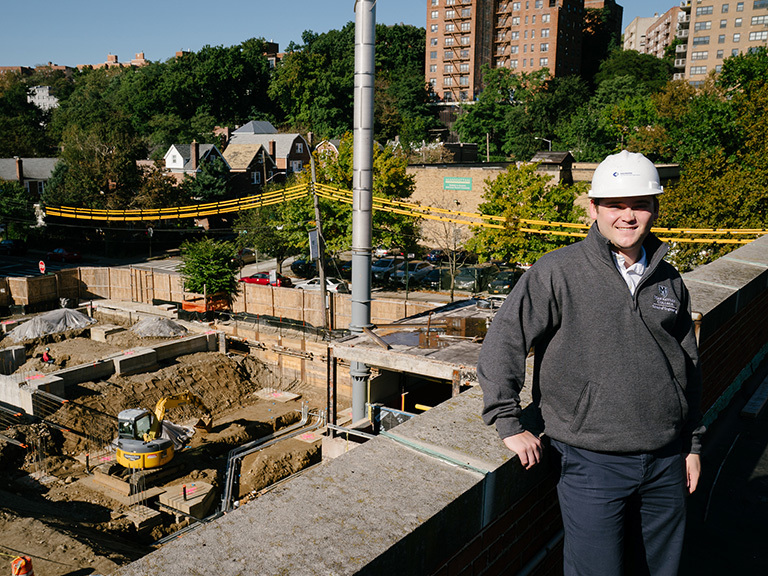 Manhattan College accounts for more than 2,000 jobs in the Bronx. Student-serving offices now together in one space near the Quadrangle. 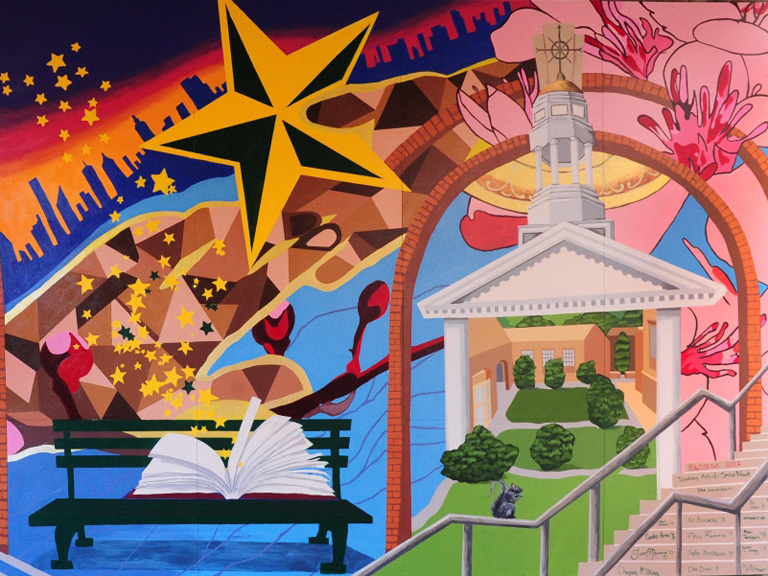 The incoming freshmen Class of 2020 are greeted this semester by Blossom, a mission-centered artwork that represents all that can be achieved through a Manhattan education. 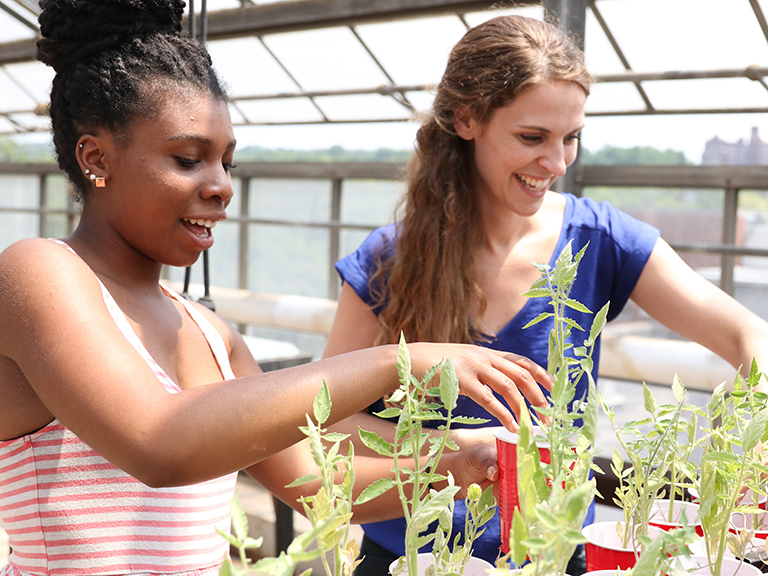 From June 29 - July 2, some of the nation's brightest minds will come to the Riverdale campus. 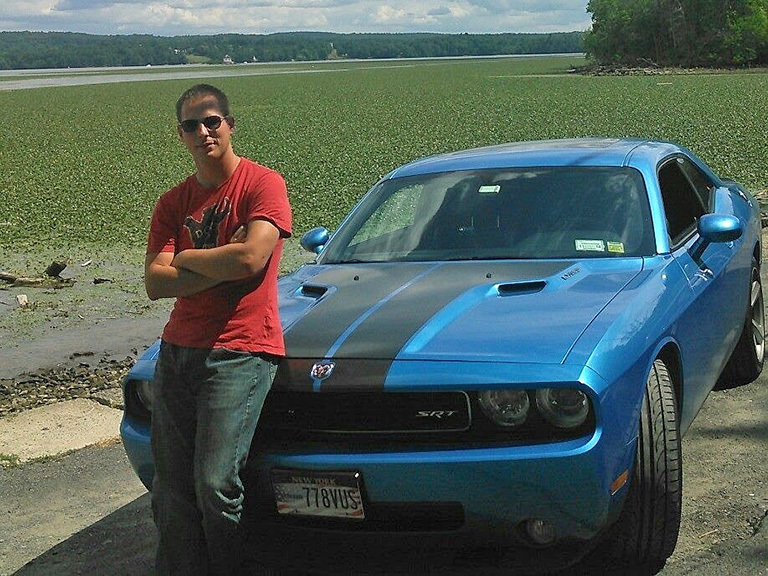 Nick Tommaso ’16 journals his final days before Commencement. 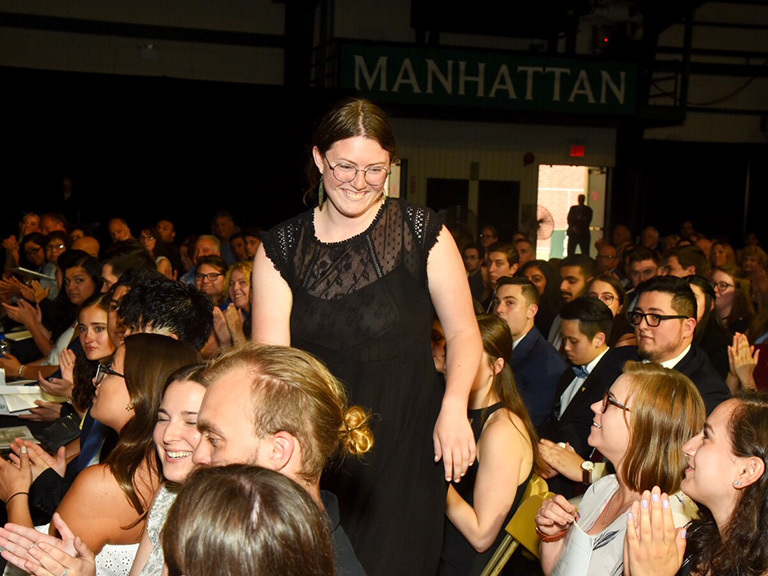 Manhattan College's undergraduate class of more than 780 students capped the weekend's festivities on May 22. 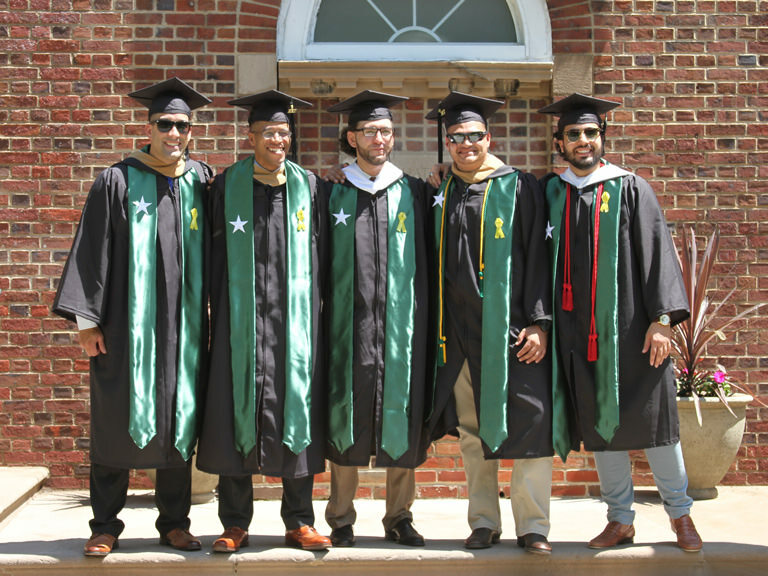 The Spring Commencement exercises take place on Saturday, May 21 with the Undergraduate Commencement exercises to come on Sunday, May 22. 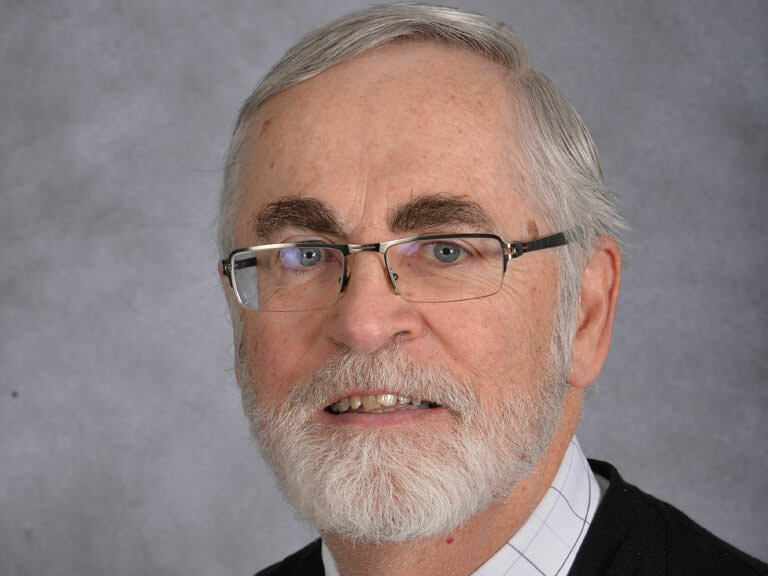 The outgoing dean of the School of Education and Health, Merriman will receive an honorary degree at the Commencement exercises on Saturday, May 21. 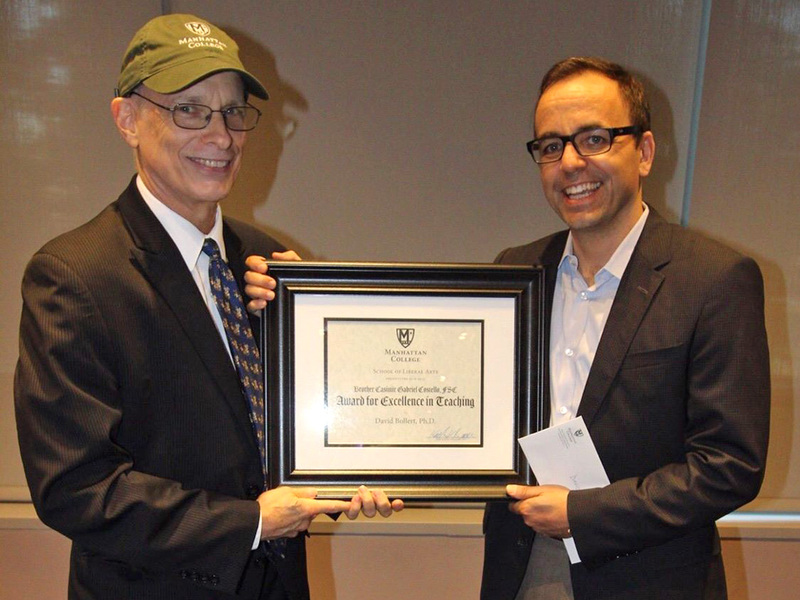 Manhattan College’s Vice President for Enrollment Management was recognized at the school's annual spring gala. 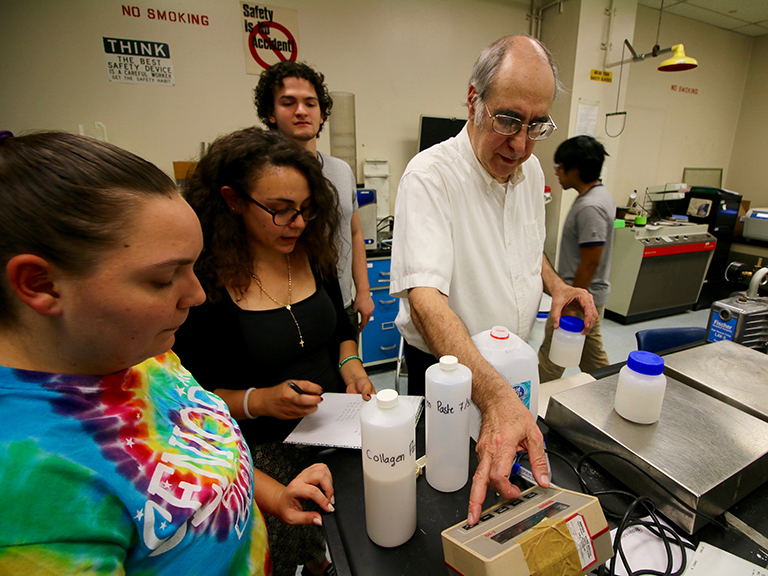 Since its founding by Charles H. Thornton ’61, the ACE Mentor Program has helped hundreds of high school students learn about STEM fields. 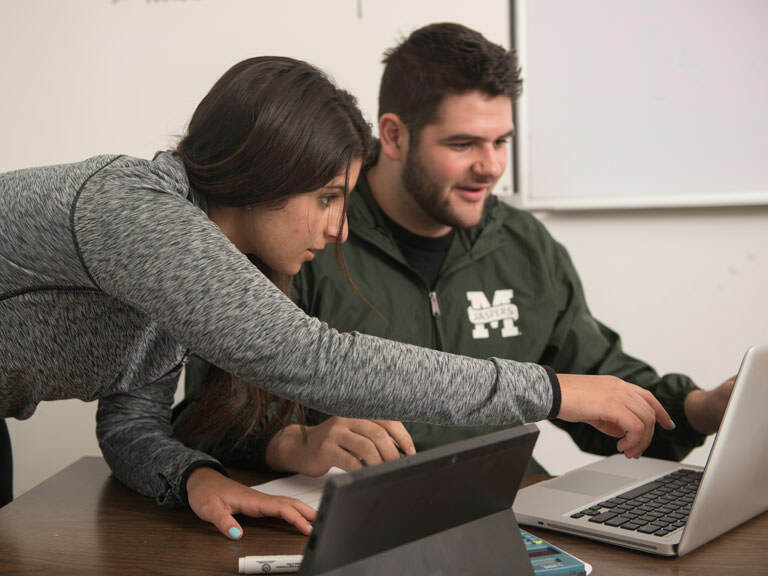 Manhattan College students have access to a loyal alumni network, one-on-one counseling and professional marketing materials, as well as other job-seeking services. 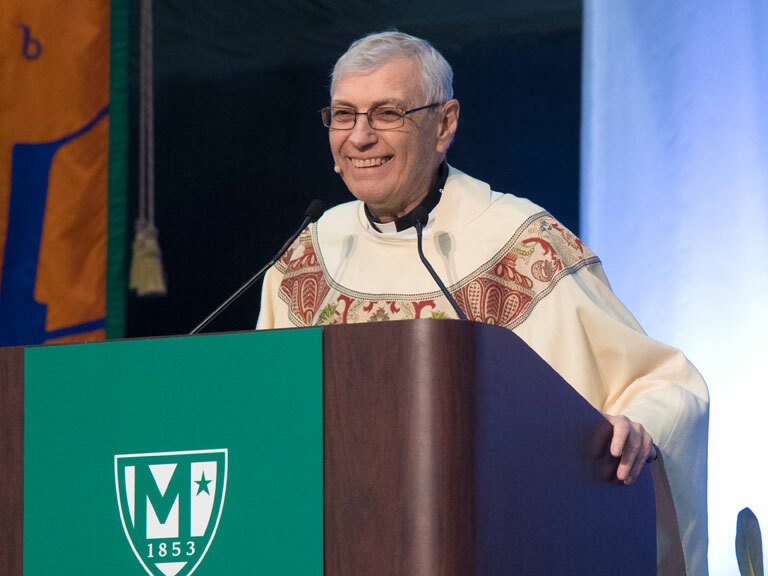 The Superior General of the Brothers of the Christian Schools will address Manhattan College’s class of 2016 on May 22. 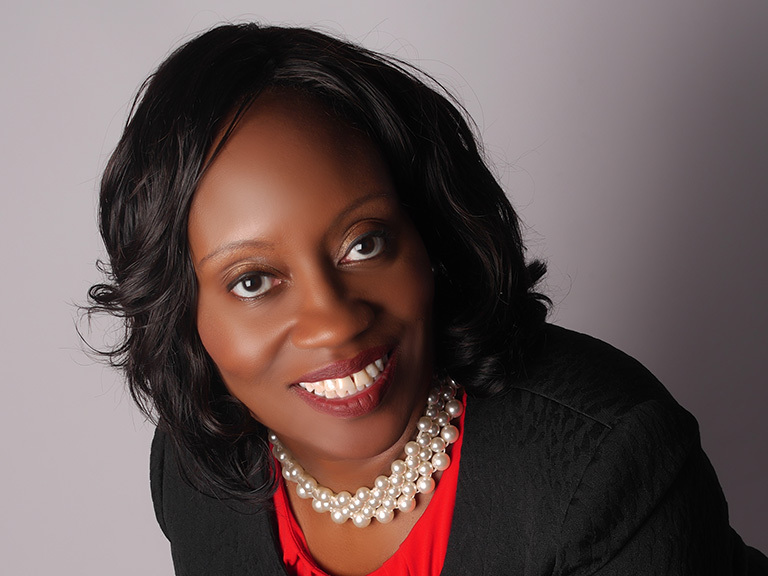 Poet to share her award-winning works on April 28. On April 25, Fink will discuss her reporting at a New Orleans hospital after Hurricane Katrina struck. A Mass and ceremony on Apr. 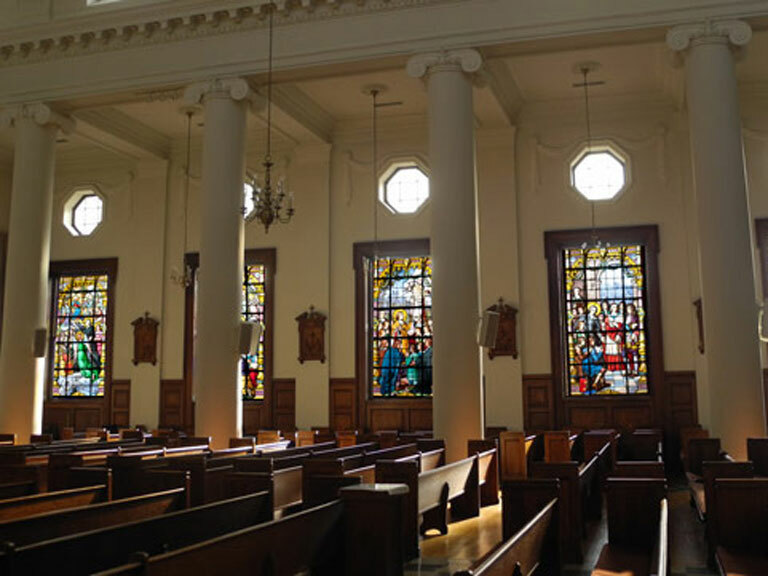 7 celebrated the installation of windows illuminating the life and work of Saint John Baptist de La Salle. 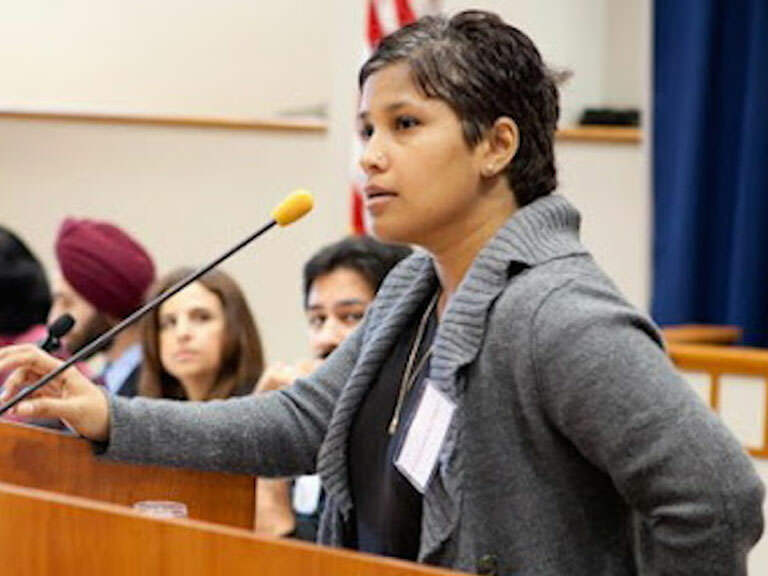 A labor and employment expert, Huq will discuss the role women are playing in the workforce and community in the U.S. and Bangladesh. 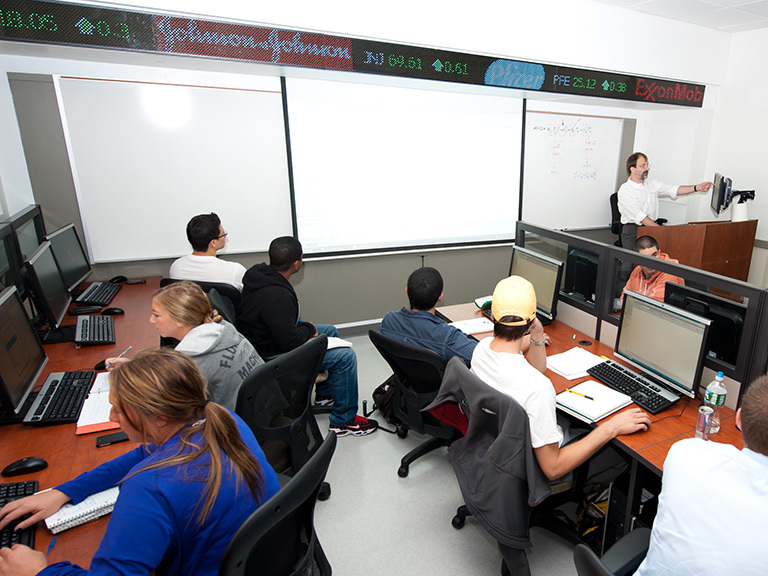 The College places in the top six percent in return on investment among all colleges and universities. 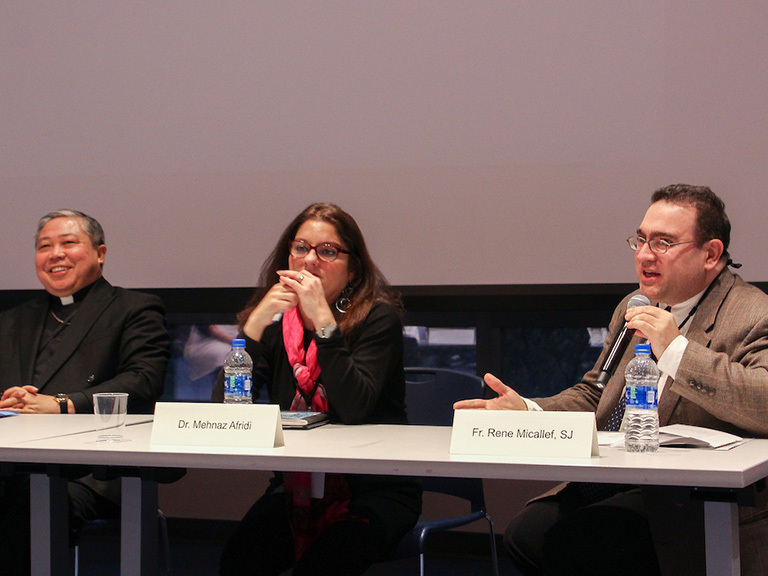 The event took place on campus on Thursday, April 7. 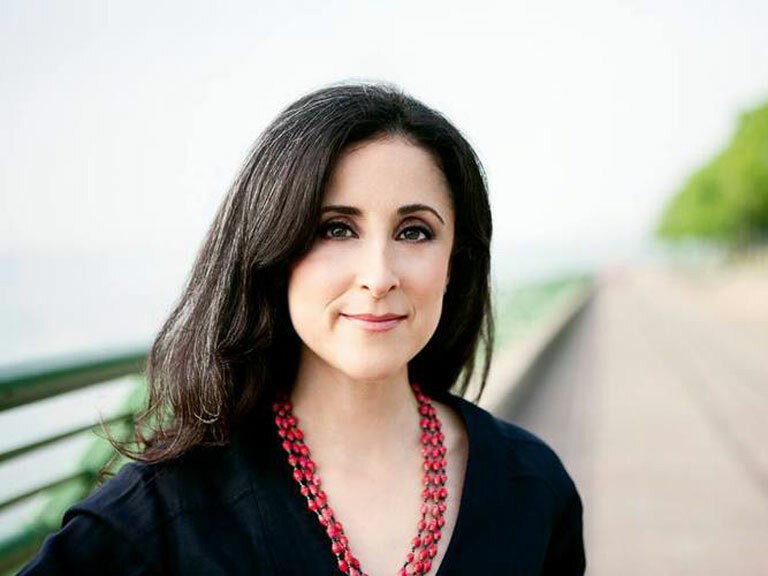 Renowned author of Venus Drive, Homeland and The Ask to speak at Manhattan College for the biannual reading series on March 31. 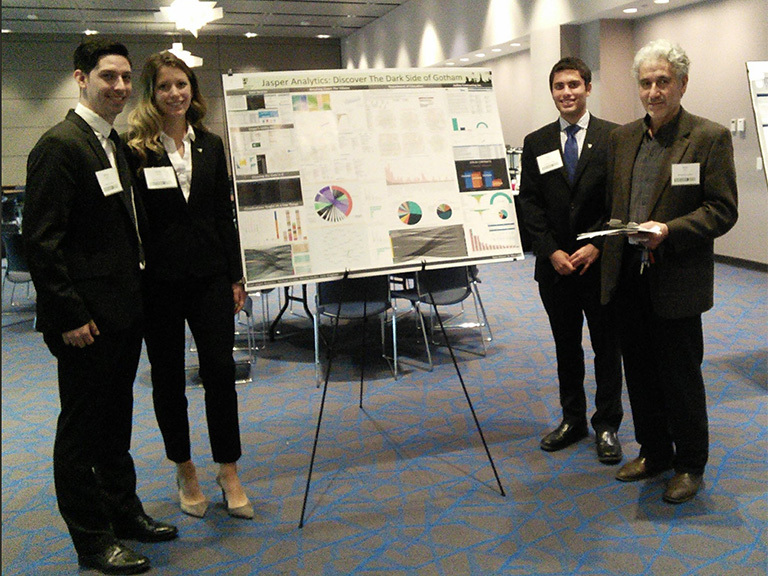 Manhattan College students are using College labs and equipment to help solve a nationwide issue. 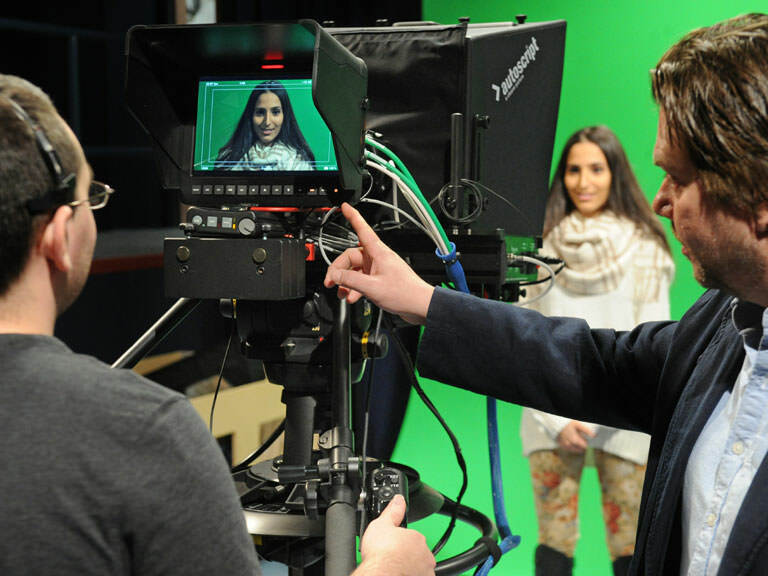 Manhattan College is the first in New York City's metro area to install 4K video equipment. 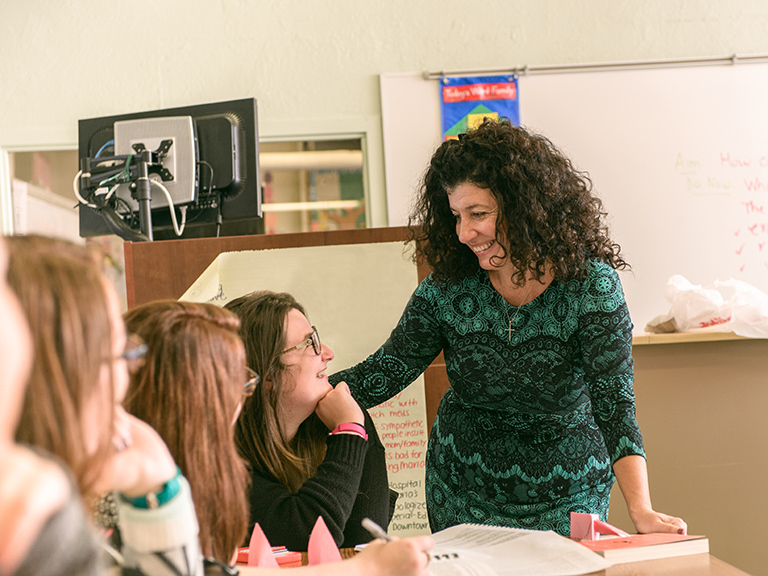 School of Education and Health adds to catalog of graduate-level counseling, leadership, and education programs. 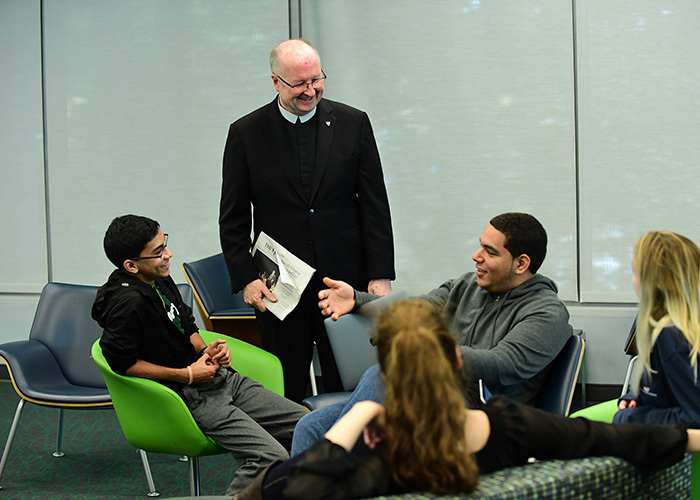 The Manhattan College president will serve on the board of the Lasallian university in Illinois. 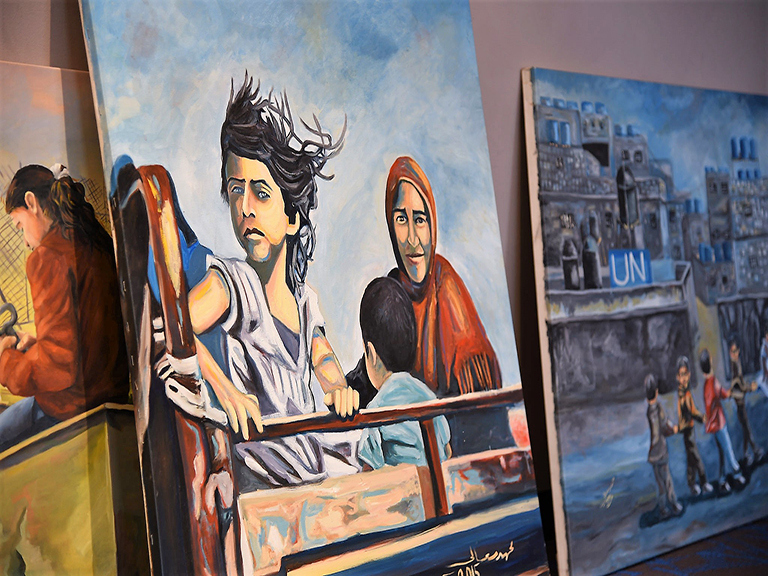 Peace Week 2016: Going Beyond Borders takes place March 7-10. The new online M.B.A. and M.S. 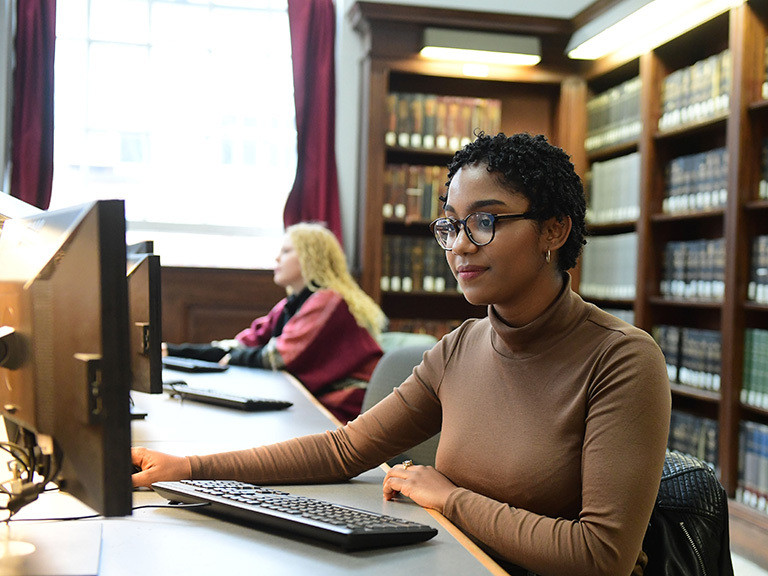 in Applied Mathematics-Data Analytics are designed to give graduates the interdisciplinary skills that employers need. Abdias Myrtil shares his thoughts on Black History Month and how African-Americans are viewed in the past and present. 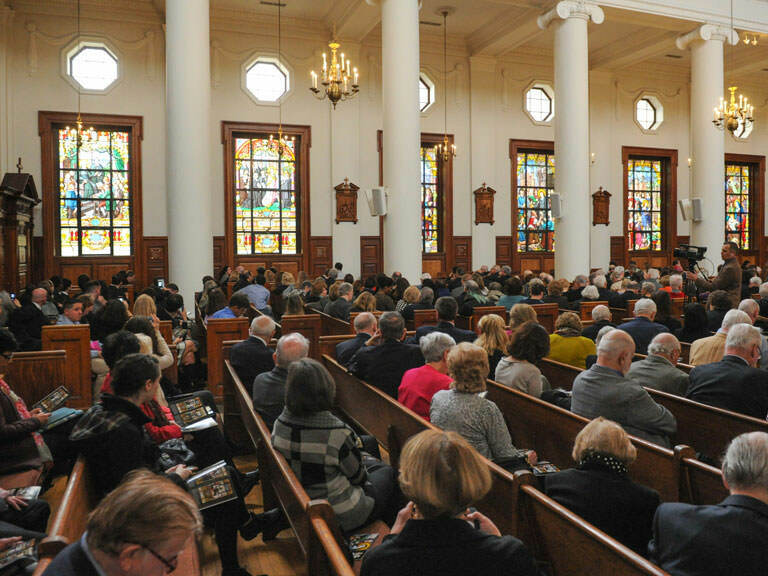 Jaspers celebrate the Easter season with events that remind us of our Catholic identity. Students will hear insights from author Brandy Wilson on Thursday, Feb. 25. 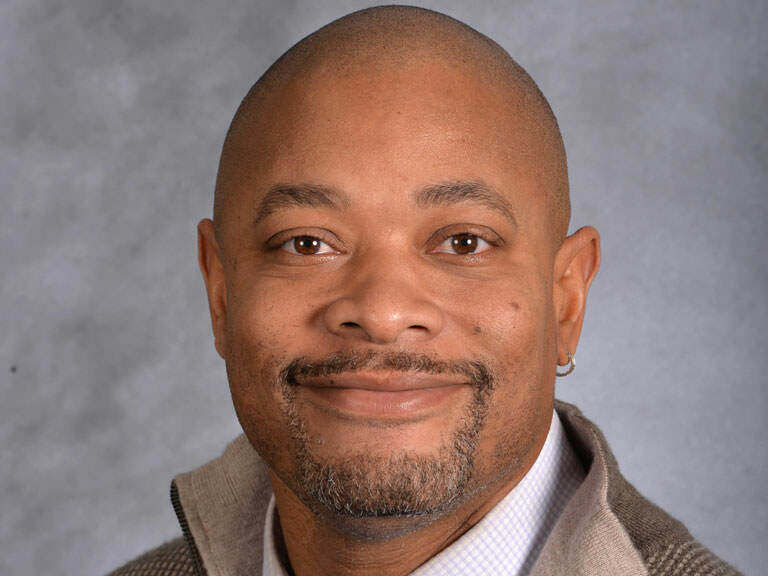 Greene has 20 years of higher education experience in various student-centered roles. 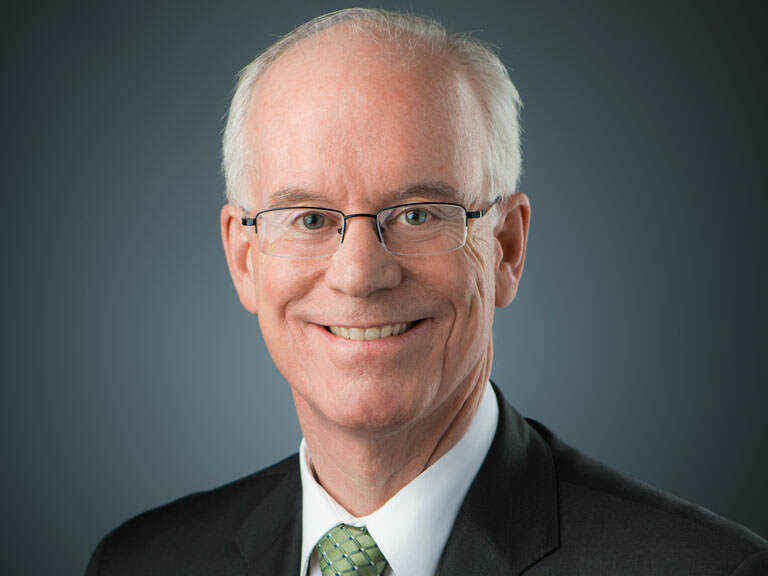 The representative of Ireland to the UN will visit campus and discuss the 2030 Sustainable Development Agenda. 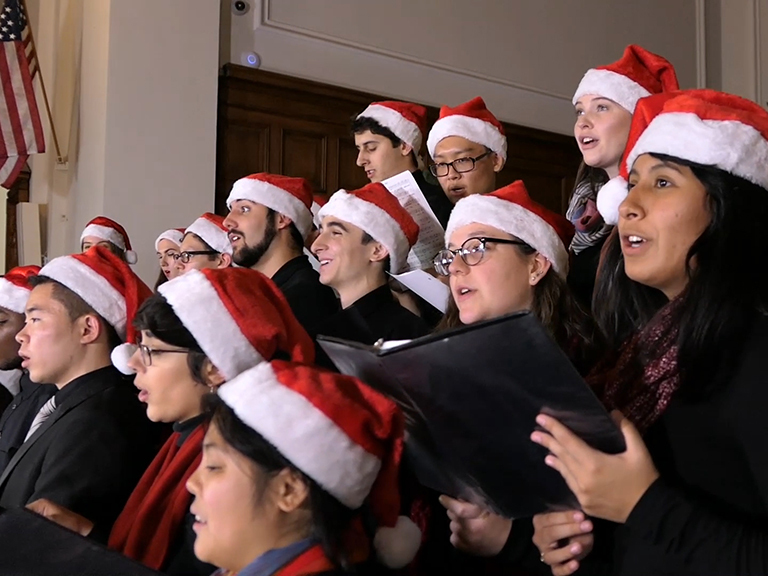 The College’s Singers and Orchestra will conduct their seasonal performance, A Festival of Lessons and Carols. 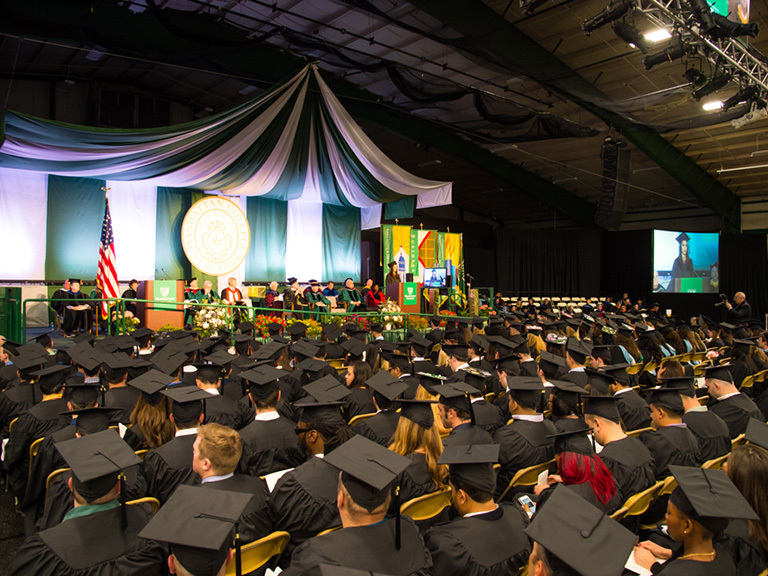 View all the recent accomplishments and accolades of Manhattan College’s faculty, staff and students. 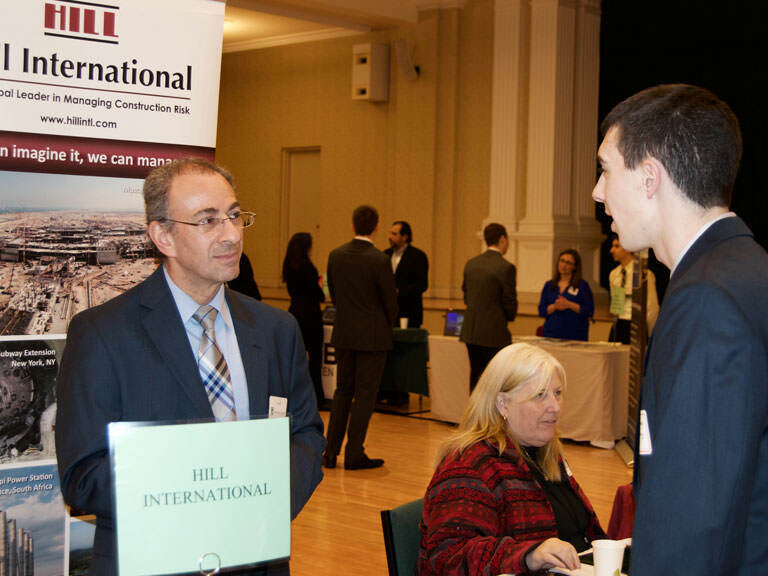 Prospective students and families invited to explore different College departments and programs. Mid-terms are over and there’s still plenty of fall left to enjoy! Every Jasper should make room on their calendar for these events on campus, in the Bronx and around the city. 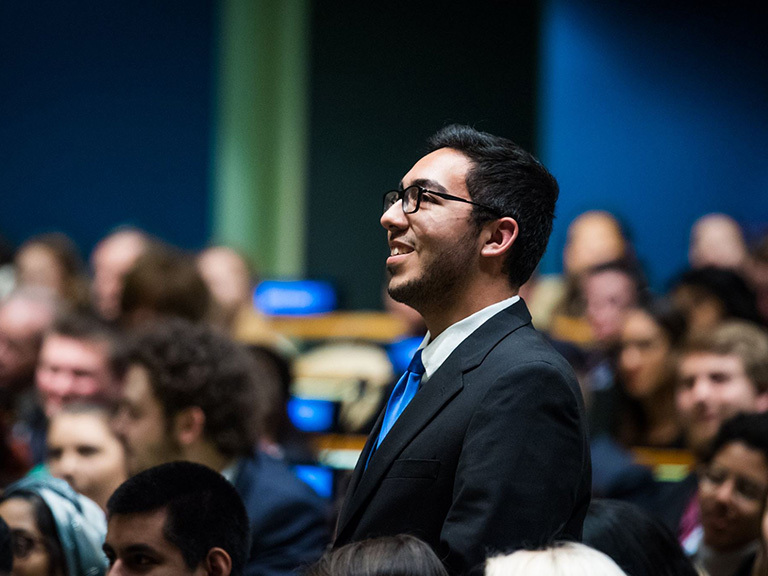 Pope Francis stood before the United Nations on Sept. 25 to address a worldwide congregation that included prominent leaders, environmentalists, and Manhattan College students who listened to his historic speech on campus via a live telecast of the event. 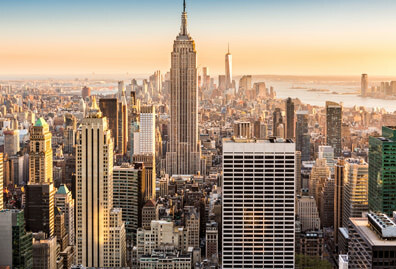 New York City has a way of dwarfing historic moments in the contiguous and contagious movement of its 8 million-plus inhabitants. But from Sept. 24-25, even the Big Apple couldn’t overshadow the arrival of Pope Francis, as thousands stopped their daily activities to hear a word from or catch a glimpse of His Holiness. 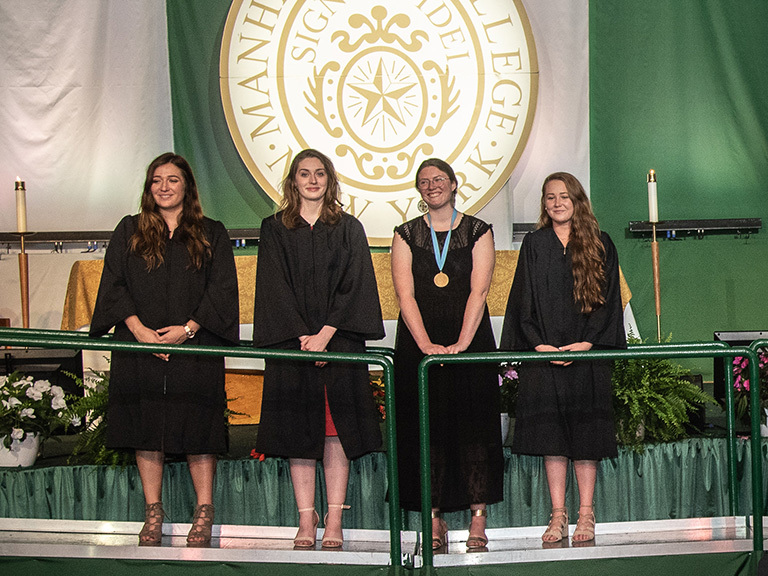 From faculty and administrators to students and alumni, the Manhattan College network was there to bear witness: in person, on campus and around the world. 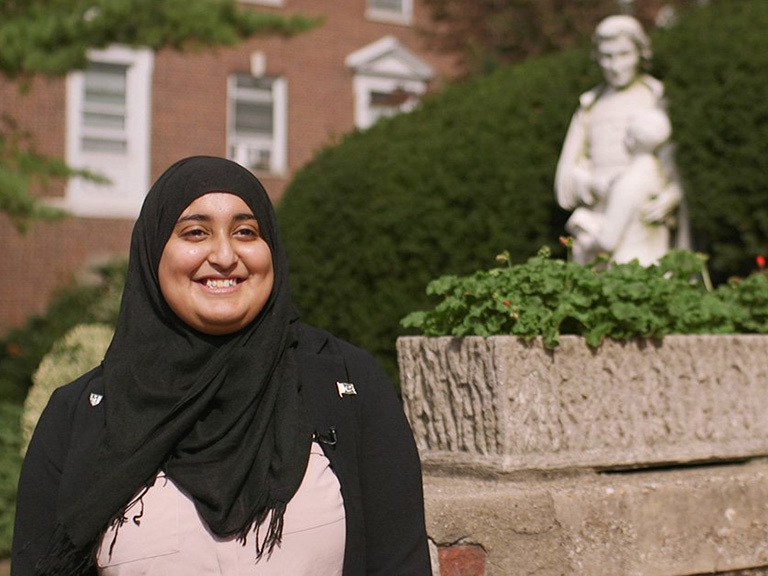 Actor and writer Aizzah Fatima is the sole performer in a show that draws rave reviews. 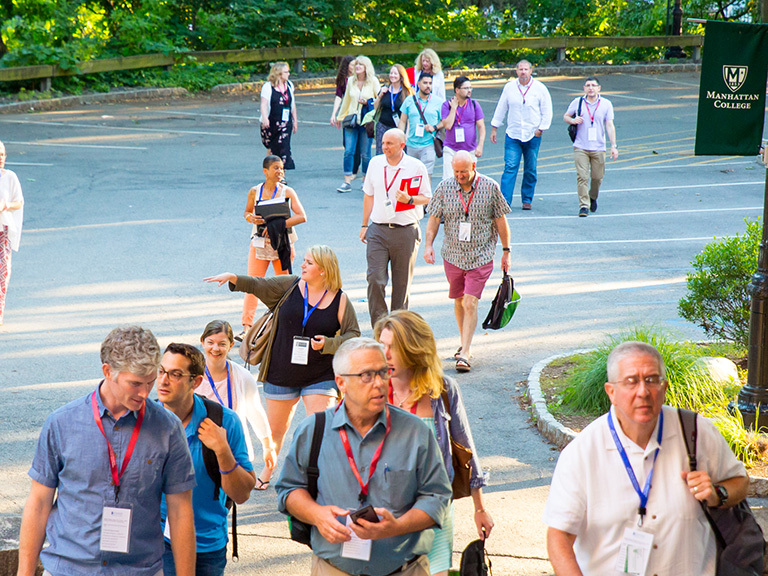 Best-selling author, chef and entrepreneur Bethenny Frankel, Extra’s New York City correspondent AJ Calloway, and violence prevention educator Ted Bunch to speak at lecture series from Sept. 14-16. 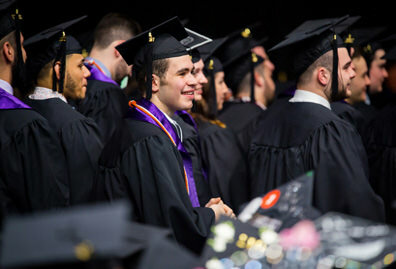 John Tudisco ’15 chronicles his final days leading up to Commencement. 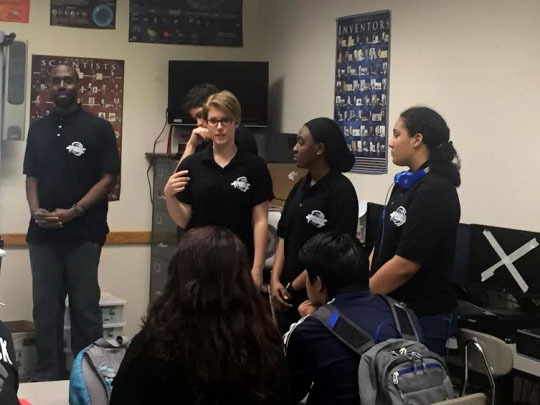 The dozen Manhattan College students affiliated with its newly minted Engineering Scholars Training and Retention (STAR) Center translated some pretty complex physics topics into teenage-speak last week with lemons, eggs and other household items for a group at Riverside High School in Yonkers. Women’s rowing elevated from a club sport beginning in the 2015-16 academic year. 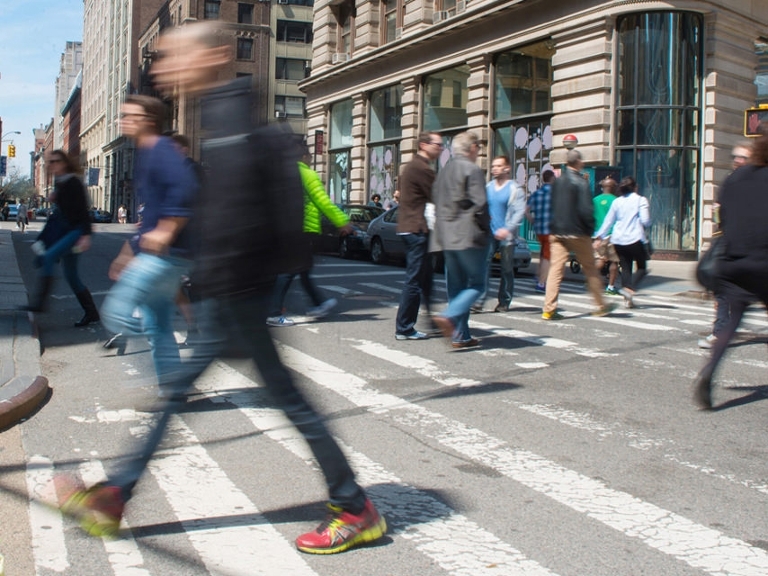 The report highlights Manhattan students’ return on investment. 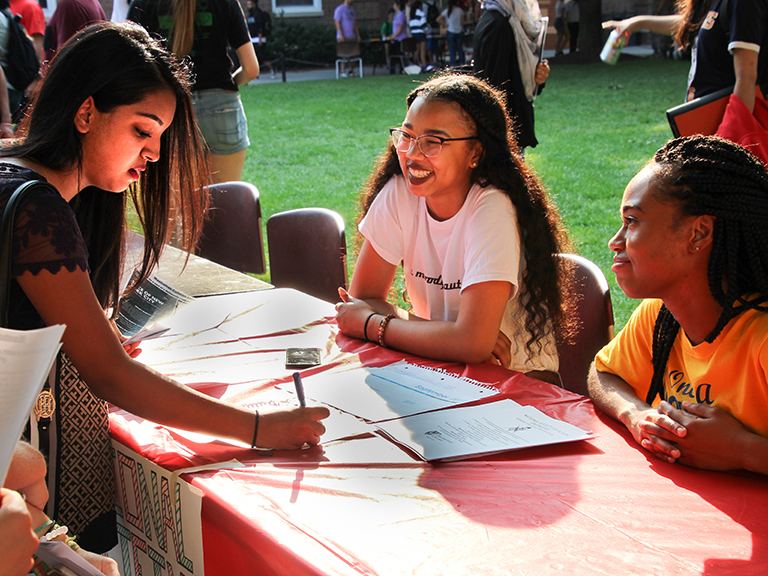 Organized by those enrolled in a new course, entitled Kinesiology & Public Health (KIN 375), the campaign includes events encouraging the school community to get up, get out and have some fun if for no other reason, their health. 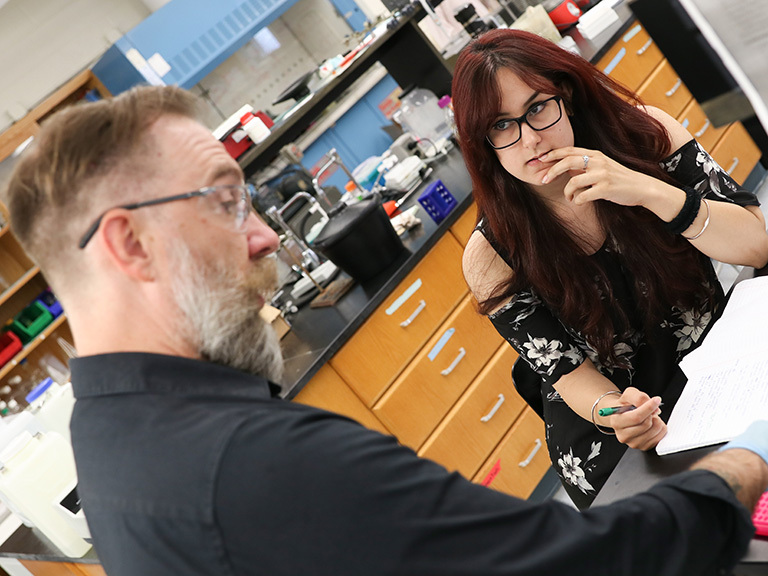 Throughout the semester, students participate in these and other projects that explore the relationship between kinesiology and a person’s overall wellness. The Tony Award winner will speak about a number of topics, including the start of his career as an entertainer after the civil rights movement of the 1960s. 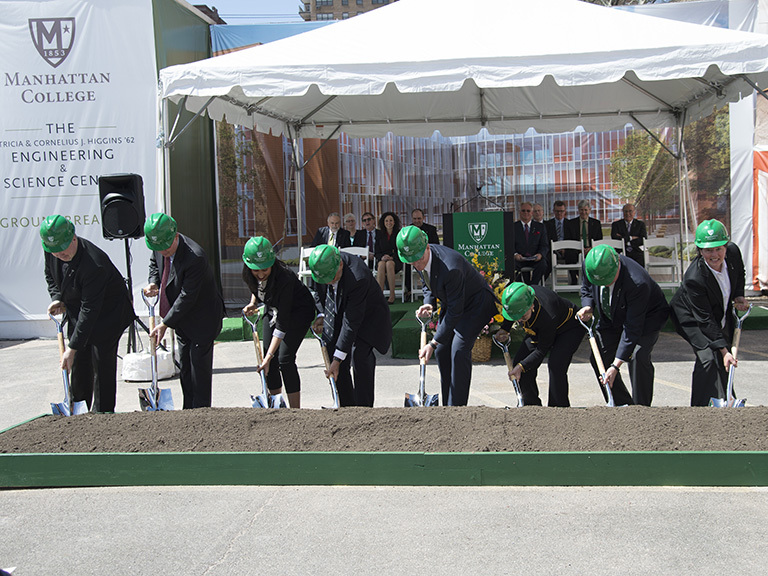 This is the College’s first LEED certified building on campus. Prospective students and families invited to visit campus and explore different College departments and programs. 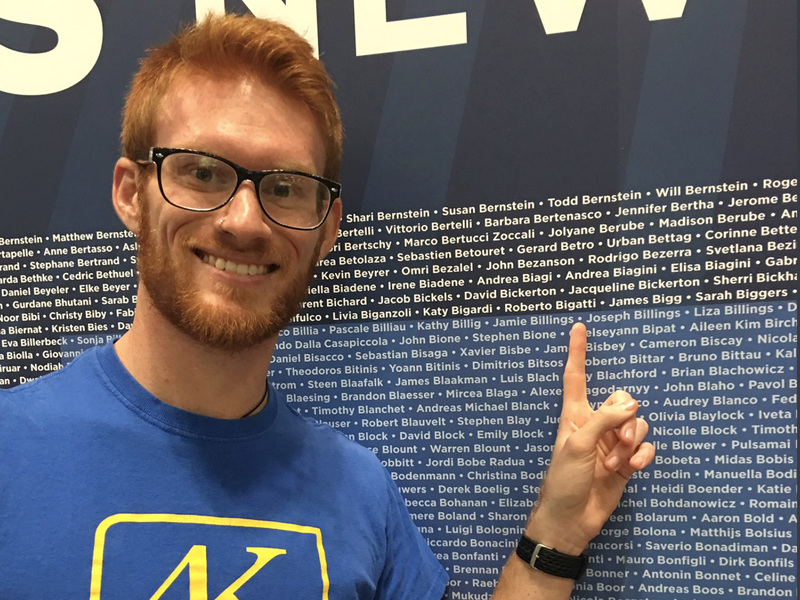 Robert Walsh discussed the opening of the Raymond W. Kelly '63 Student Commons in his weekly "Bottom Line" segment on 1010 WINS. 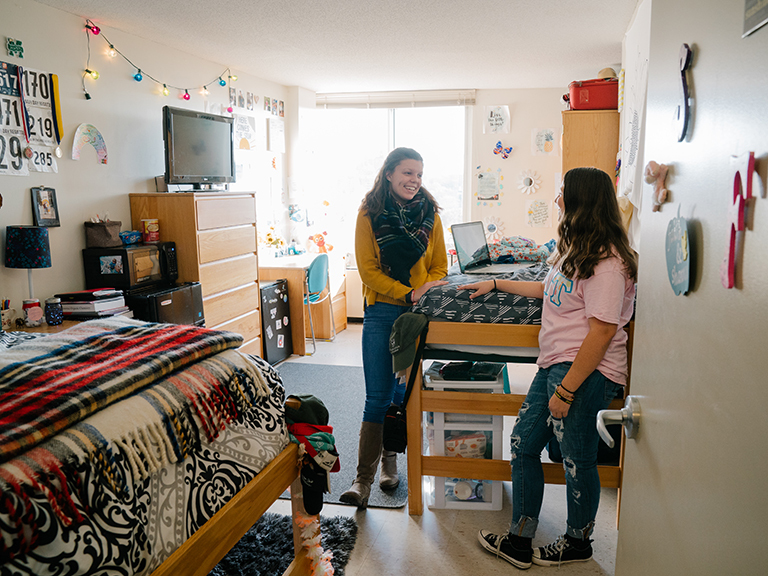 The transformative, 70,000-square-foot building connects the College’s north and south campuses, offering a state-of-the-art space for student and faculty engagement, learning and recreation. 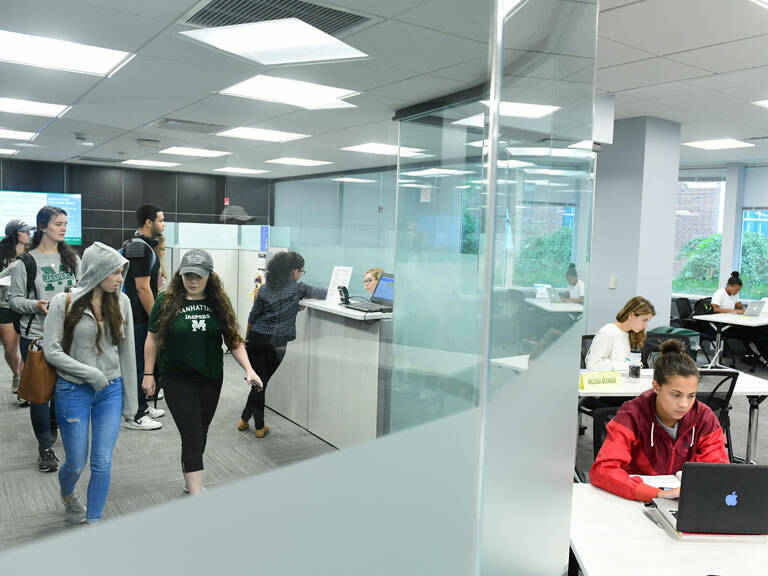 Manhattan College will host a formal building dedication ceremony on Oct. 15 for the Raymond W. Kelly ’63 Student Commons. Take a look back at the construction of the new building and see how students are using it now. Religious leaders and scholars to lead open discussion entitled, Jews, Christians and Muslims: Challenging Extremism Today. 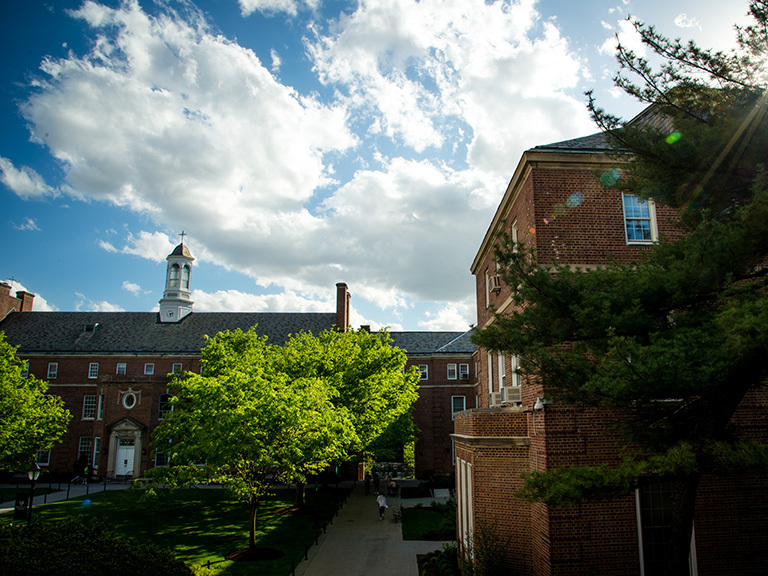 Lee Hall is the first building on campus named after a woman. 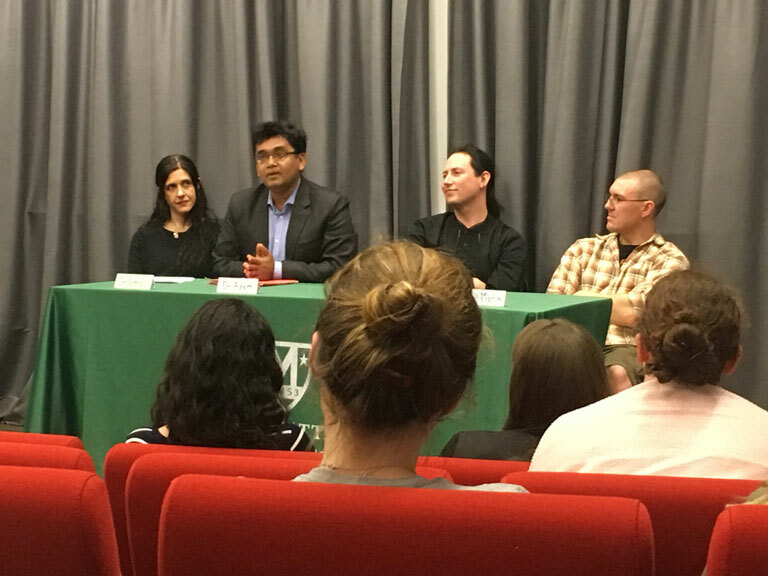 The College’s Major Author Reading Series (M.A.R.S.) will commence on Sept. 18 with writer Jen McClanaghan. 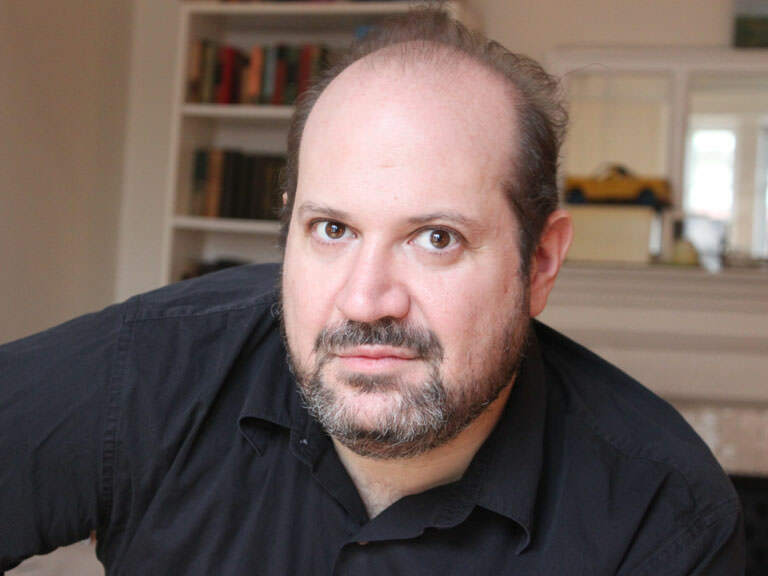 Charles Long to discuss the dilemmas of American religion on Sept. 11. 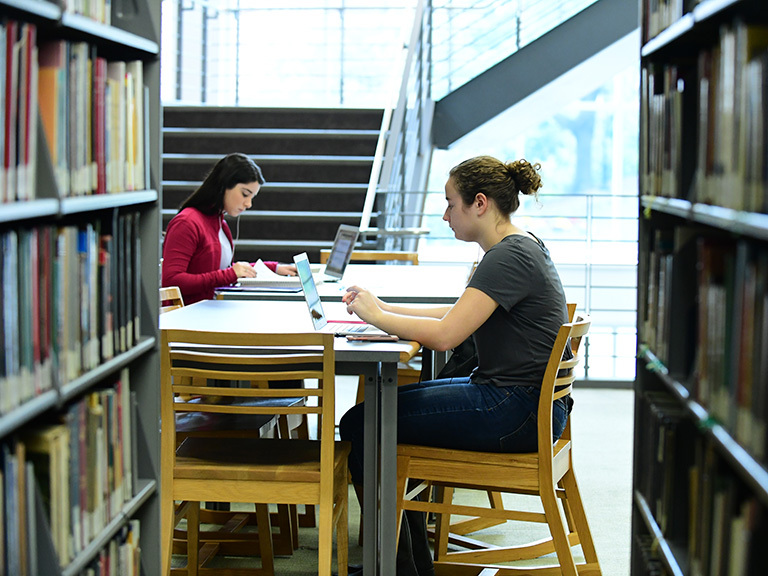 Walters will oversee the Mary Alice and Tom O’Malley Library. In collaboration with H2O Applied Technologies, the College launched a large-scale water and energy conservation project in May 2014. 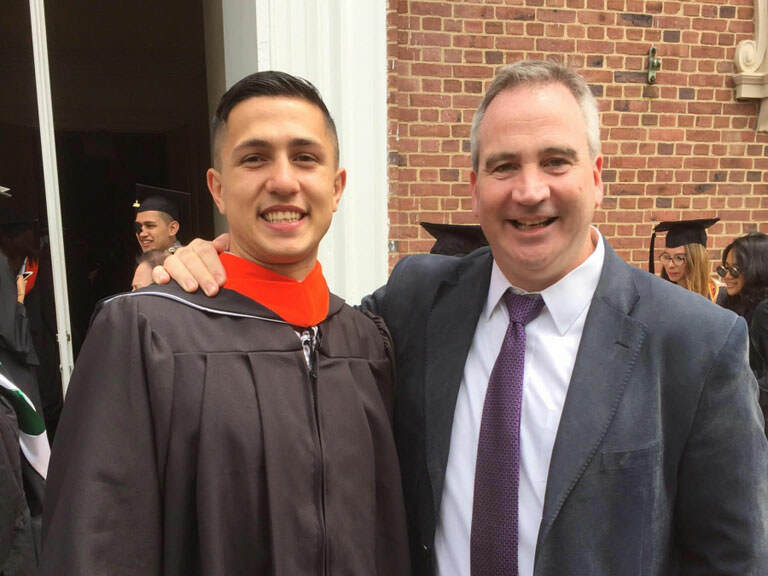 Seasoned professor of modern languages and former associate dean at Salisbury University began on July 1. 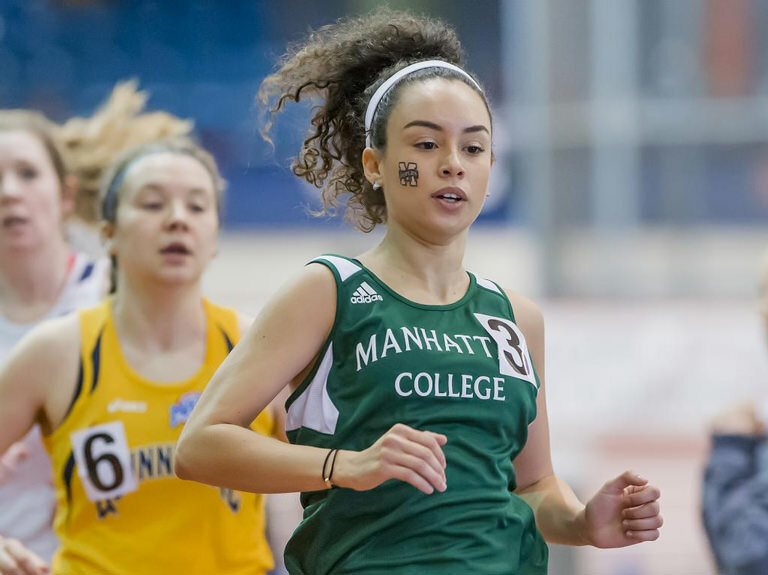 Boe Pearman, most recently the interim director of athletics at Southern Connecticut State University, was named the senior associate director of athletics at Manhattan College. 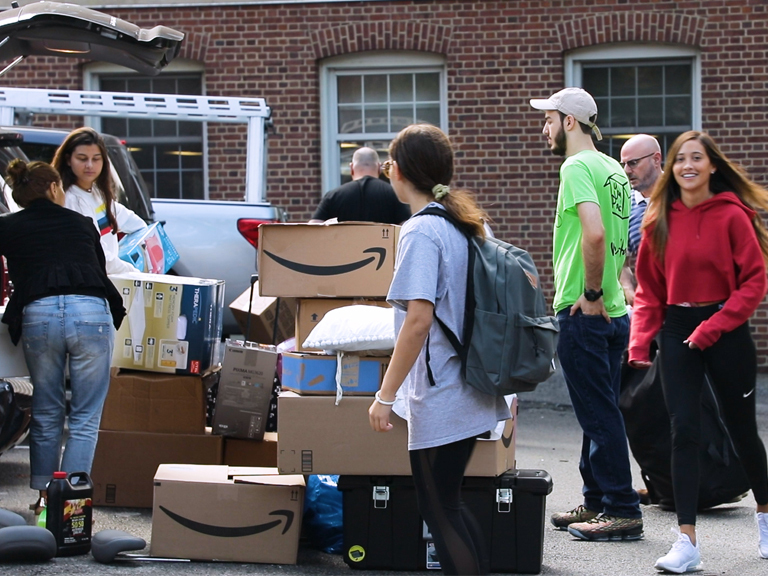 During Reunion Weekend, Manhattan College’s detachment of AFROTC — the only one of its kind in New York City — celebrates more than 60 years on campus. 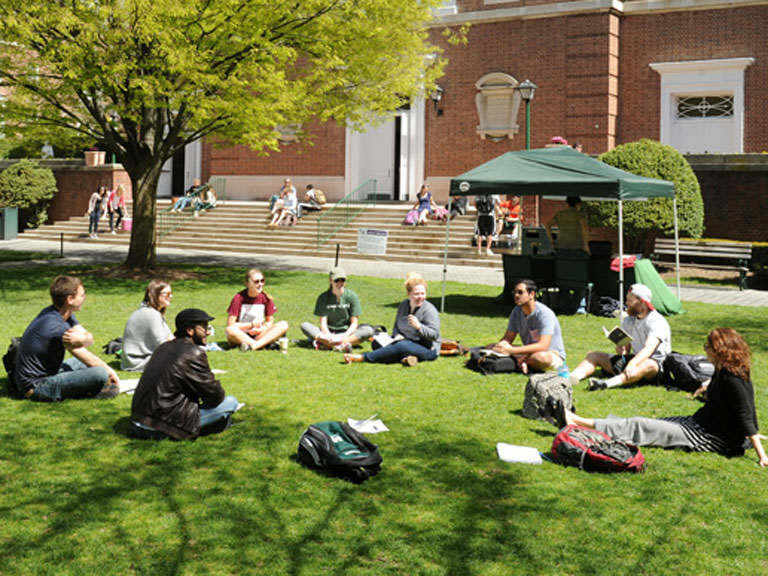 More than 100 members of the College community gathered to read Walt Whitman’s Leaves of Grass on May 1. 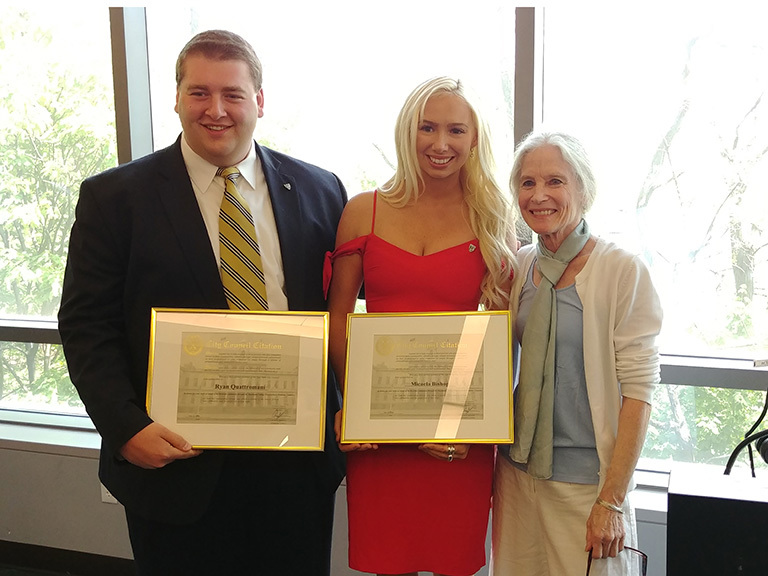 Manhattan College’s commitment to service and social awareness is officially recognized by CRS. 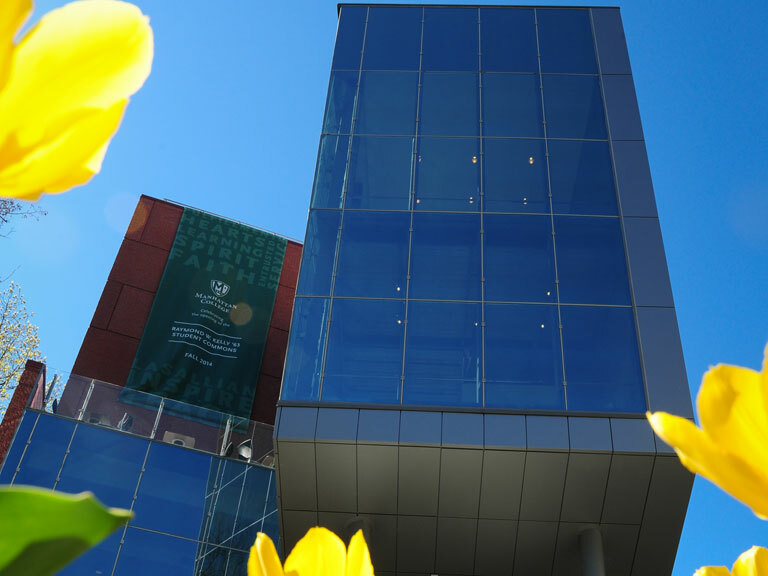 Panel discussion followed by tour of rooftop garden on April 22. 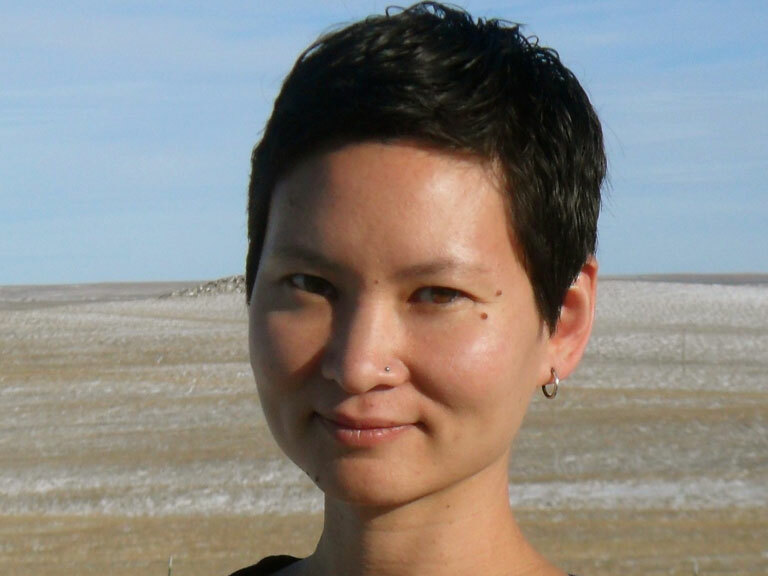 College will present Carolyn Woo with honorary doctorate during ceremony. 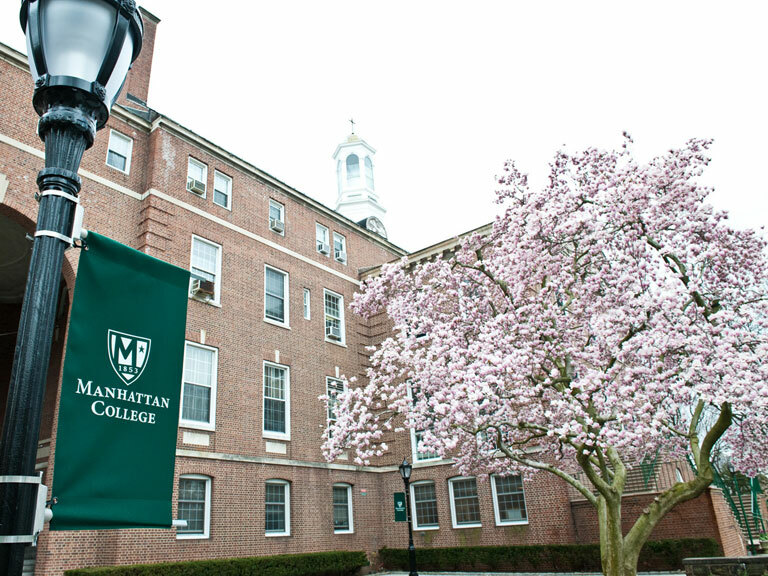 Manhattan College today announced it will reinstate Steve Masiello as its men’s head basketball coach, once he has completed his undergraduate degree from the University of Kentucky. 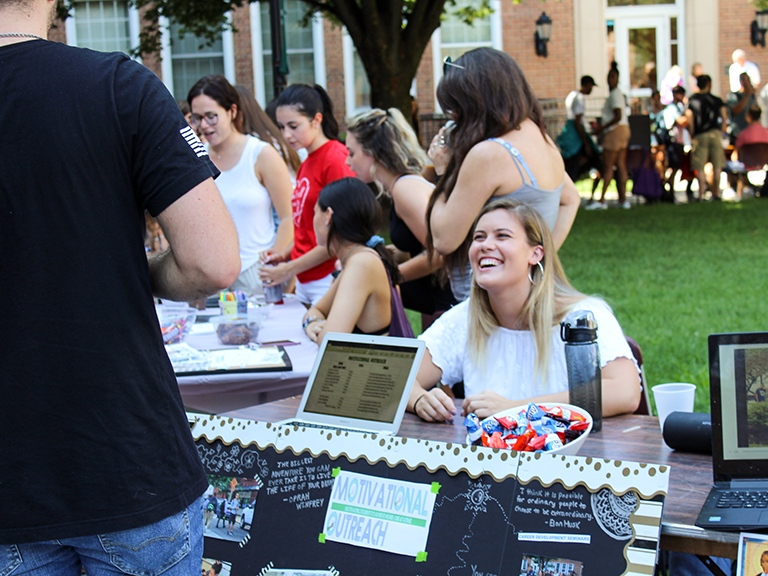 Flirting with Danger examines cultural views on sexual assault and will show as part of Sexual Assault Awareness Month. Ana Maria Laguna to discuss Cervantes’ "Don Quixote" at annual lecture. 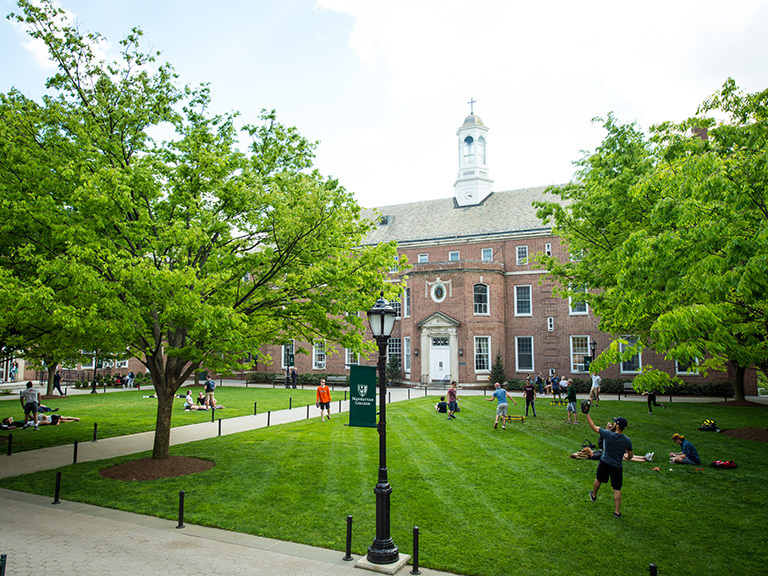 As part of Manhattan College’s ongoing planning in the event of an emergency situation on campus, the College will conduct a scenario exercise on April 3. 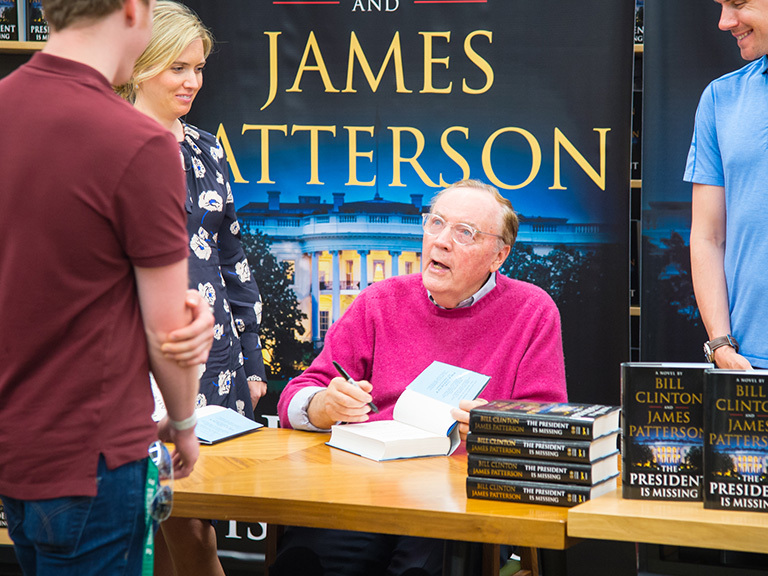 The new bookstore will feature cost-saving options and expanded services, and is open to the public. 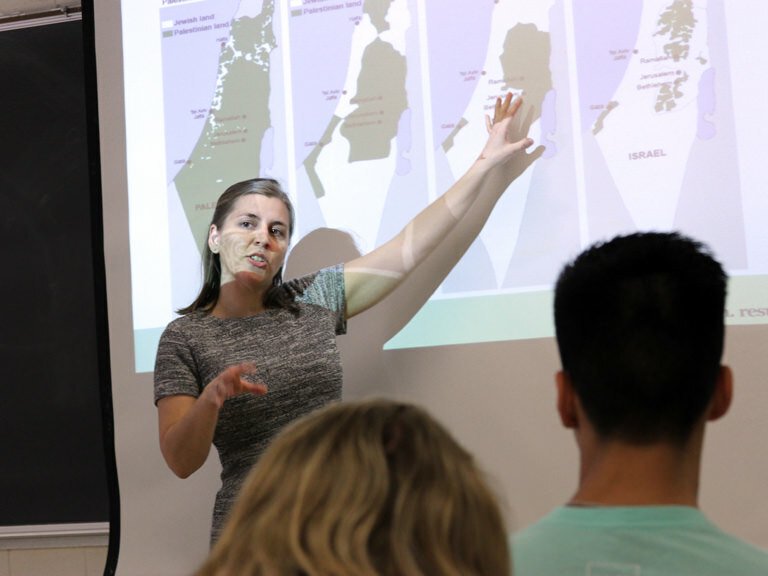 The Manhattan College community gathered for a series of events, which promoted peace and understanding for a war-torn nation. Seles, formerly ranked No. 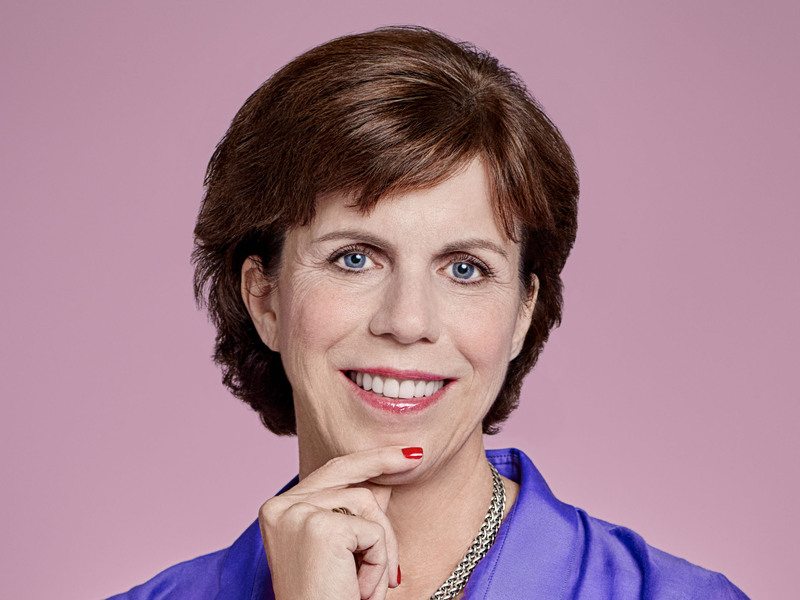 1 in the world, will speak about her career as part of Women’s Lecture Series. George Young to present book on Russian cosmism, a philosophical and cultural movement in Russia during the 20th century. Gaiutra Bahadur, a frequent writer on the culture and politics of global migration, will discuss her 2013 book. 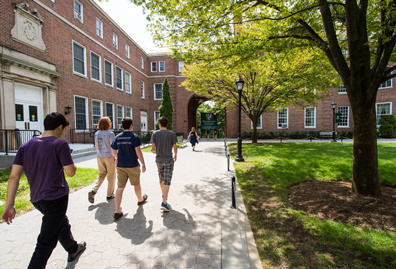 Starting Monday, Feb. 3, 2014, Manhattan College will close the Waldo Pedestrian Pathway, which currently links the Leo Hall and Research and Learning Center facilities with main campus, for three months as part of its continued construction on the Raymond W. Kelly ’63 Student Commons. 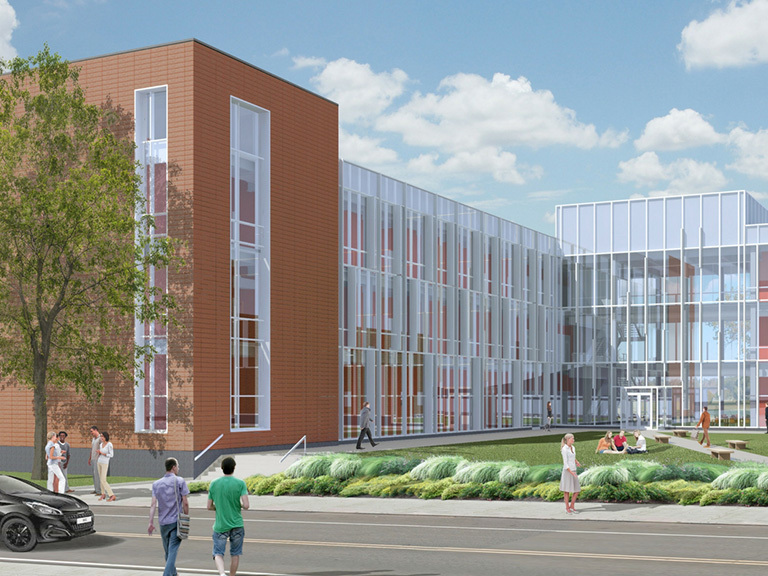 The student commons will officially open in fall 2014. 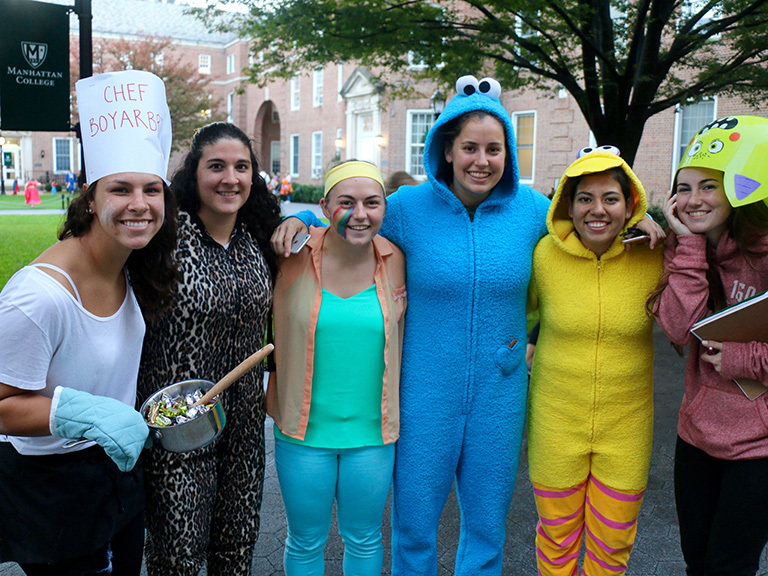 Education students coordinate fun activities and trick-or-treat stops around campus. 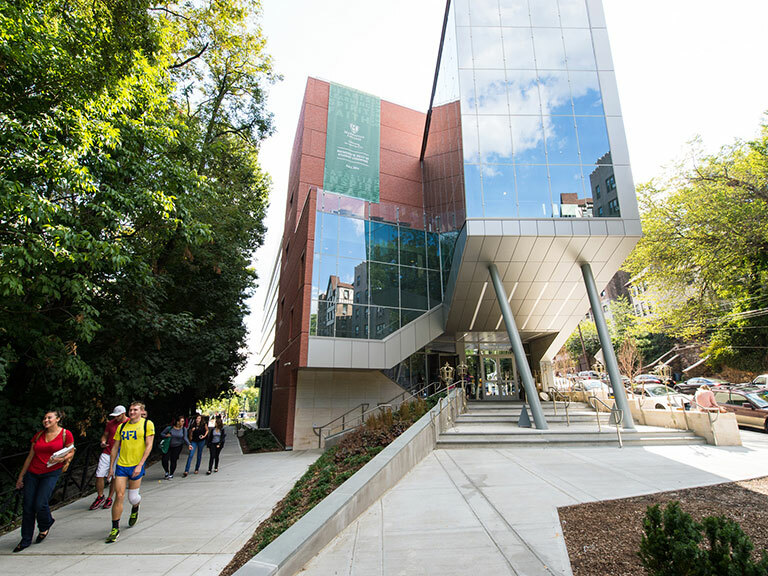 Manhattan College’s Riverdale campus is a 30-minute ride on the 1 train into midtown Manhattan where Jaspers learn, work and play. On Sept. 25, Manhattan College continues the Costello Lecture series with historian and UCLA professor emerita Lynn Hunt, Ph.D.
On Sept. 9, Manhattan College continues the Newman Lecture series with cultural historian and media scholar Siva Vaidhyanathan, Ph.D.
From its early history on 131st Street and Broadway in Manhattan in the mid-1800s to its move to Riverdale in the 1920s, Manhattan College’s landscape has been one of change and growth. 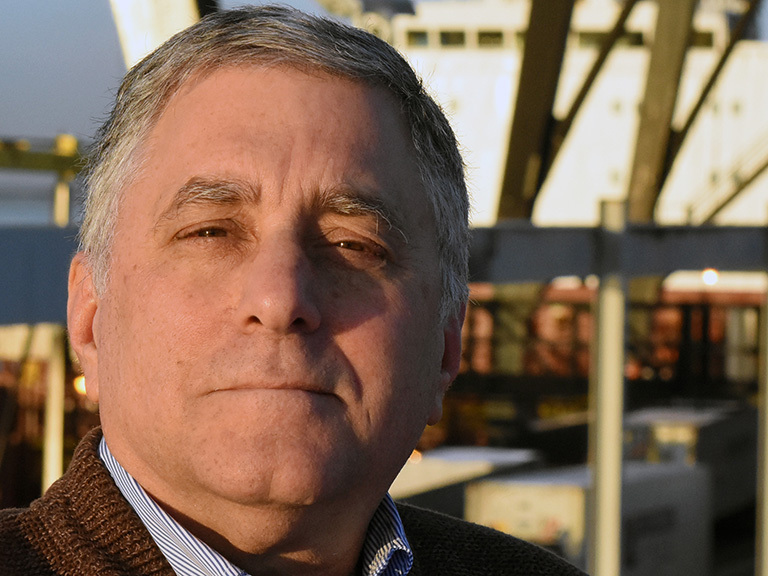 Spring semester programming begins on Feb. 13 with activist and scholar Alan Richard. 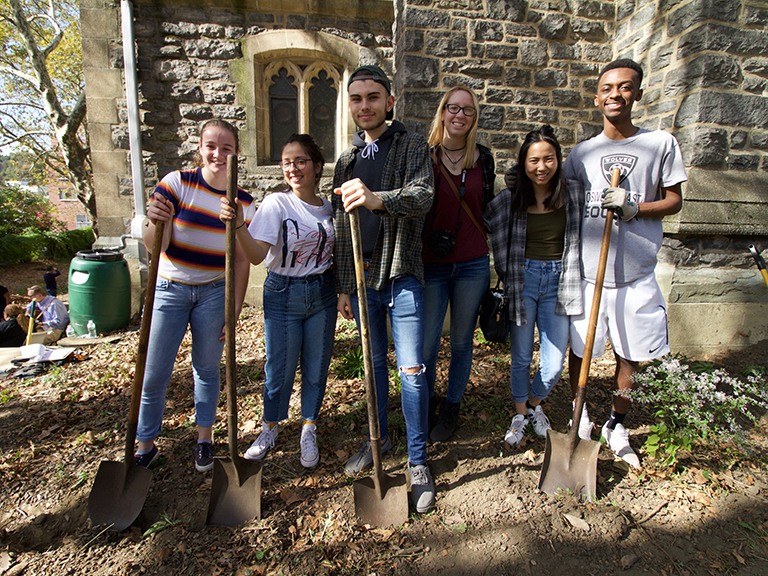 In recent years, Manhattan College's commitment to sustainability has grown to include new courses on environmental justice, extracurriculars that allow students to take part in the green movement, and a new research center on campus. It's safe to say that Jaspers enjoy being green! 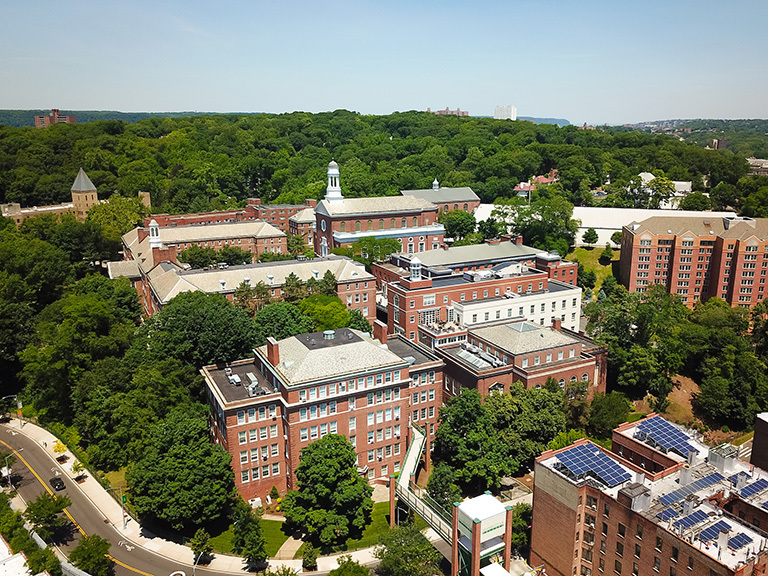 From encouraging recycling to reducing emissions, Manhattan College is making sustainability a priority in all facets of campus life. 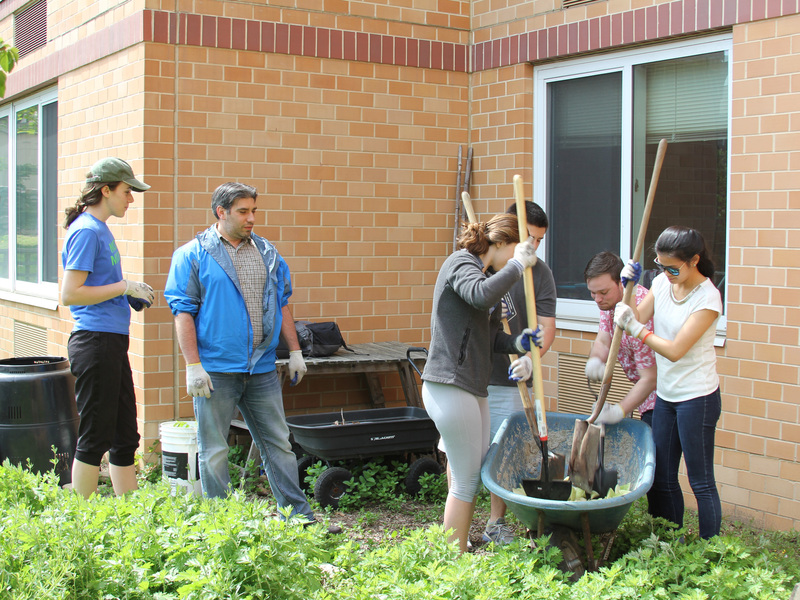 The Green Club has taken on gardening, composting and planting projects, while JustPeace has worked to bring fair trade products to campus and provide education about environmental issues that impact human rights.